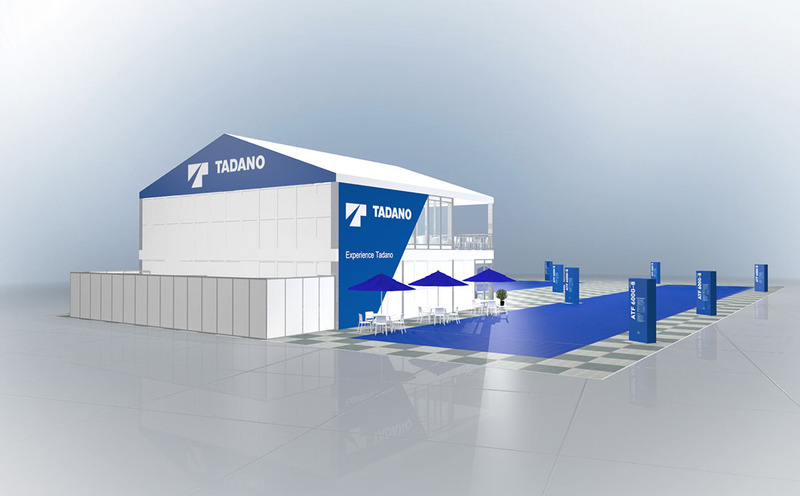 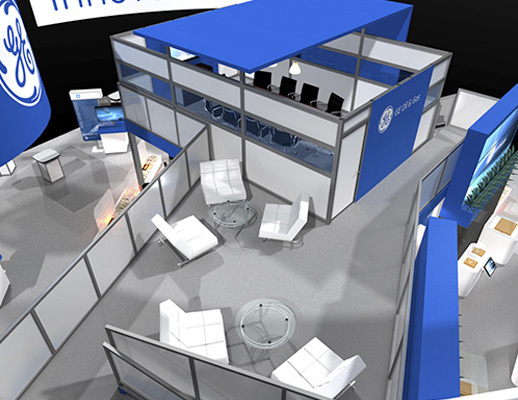 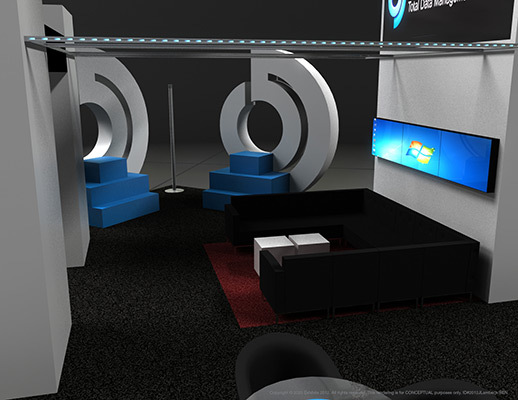 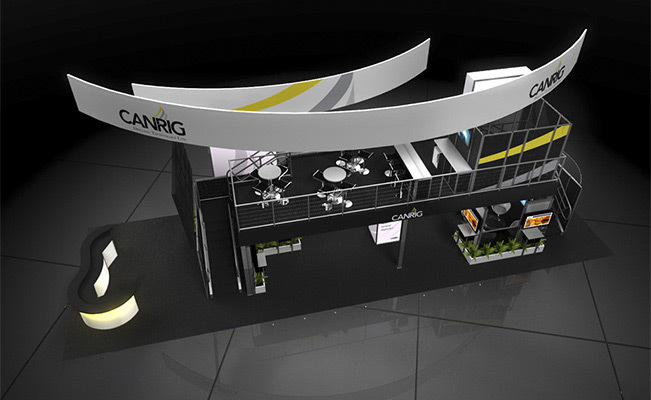 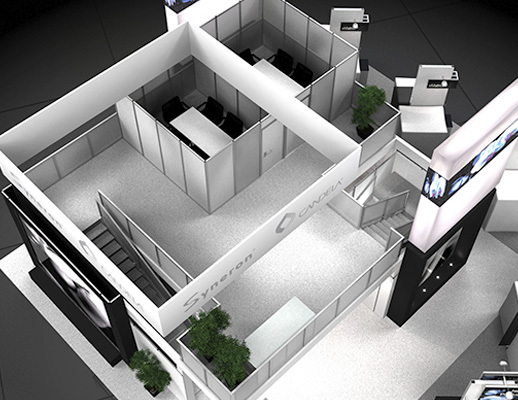 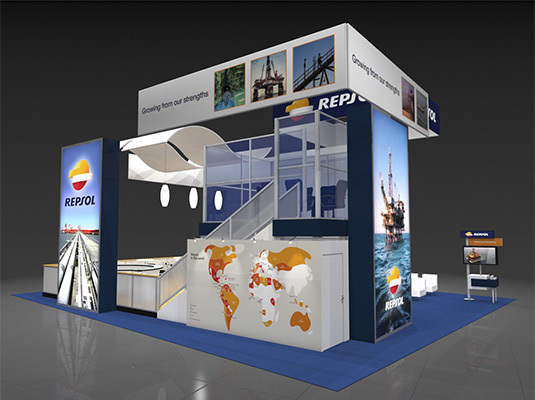 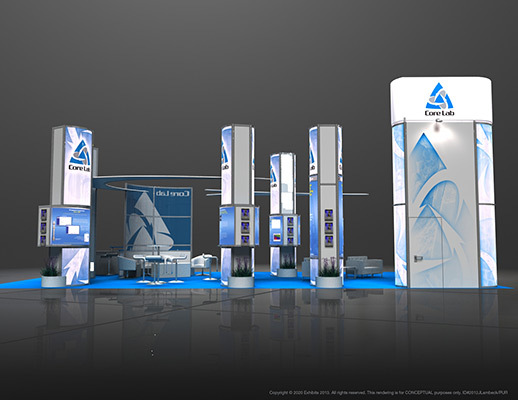 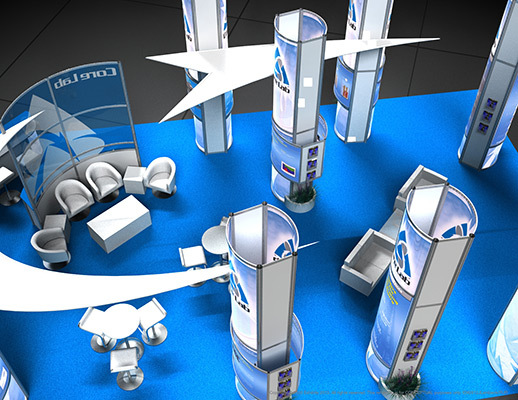 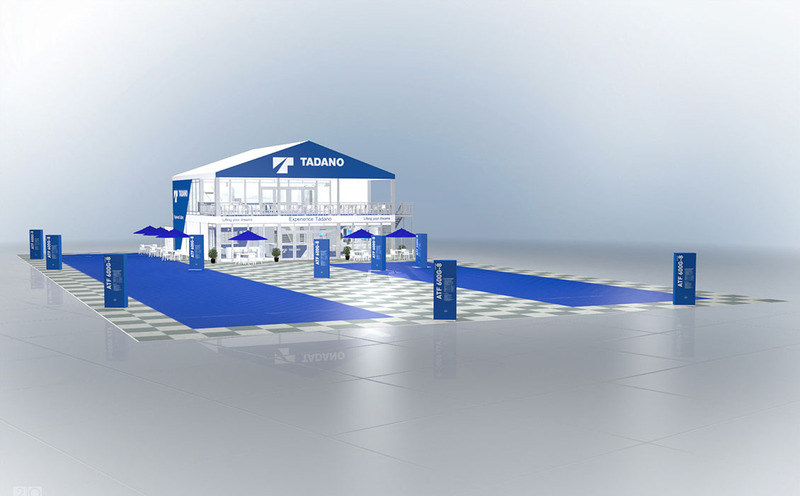 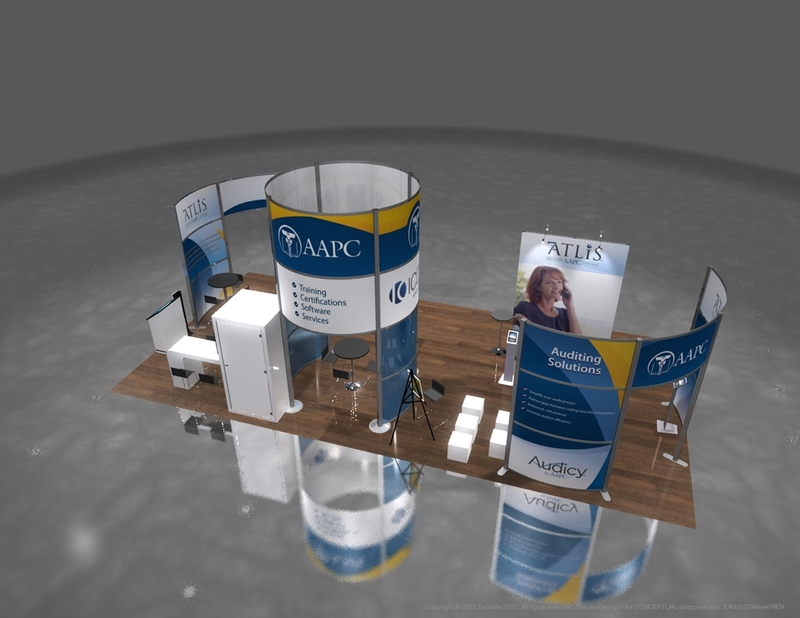 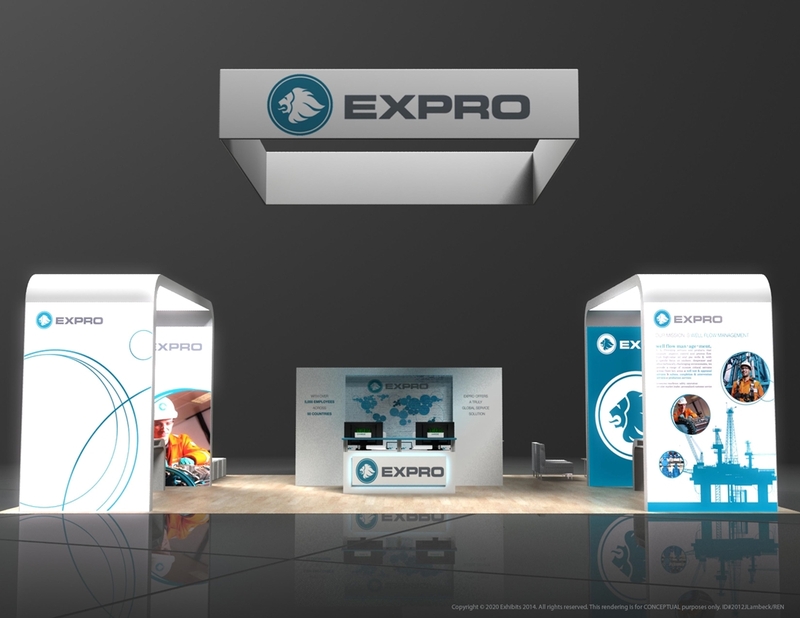 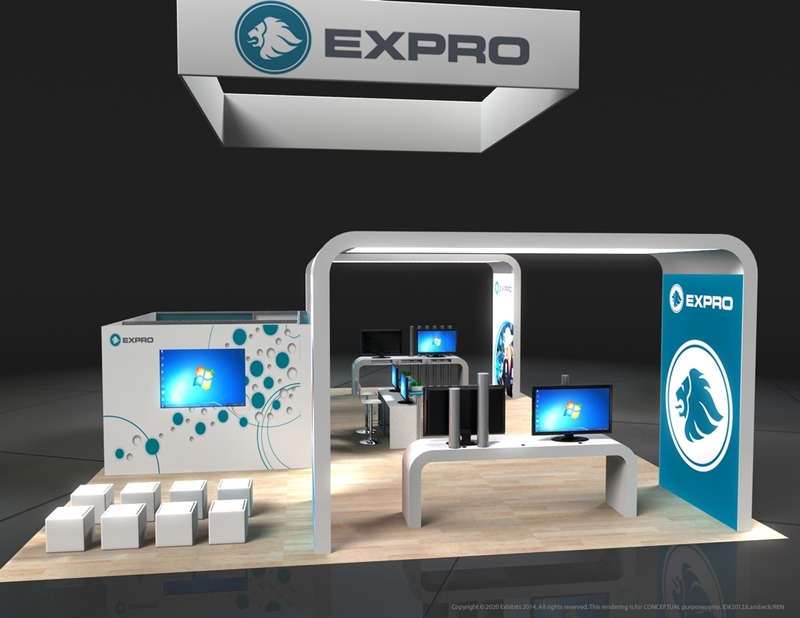 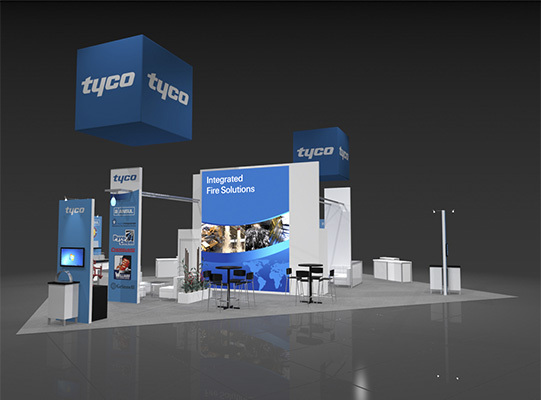 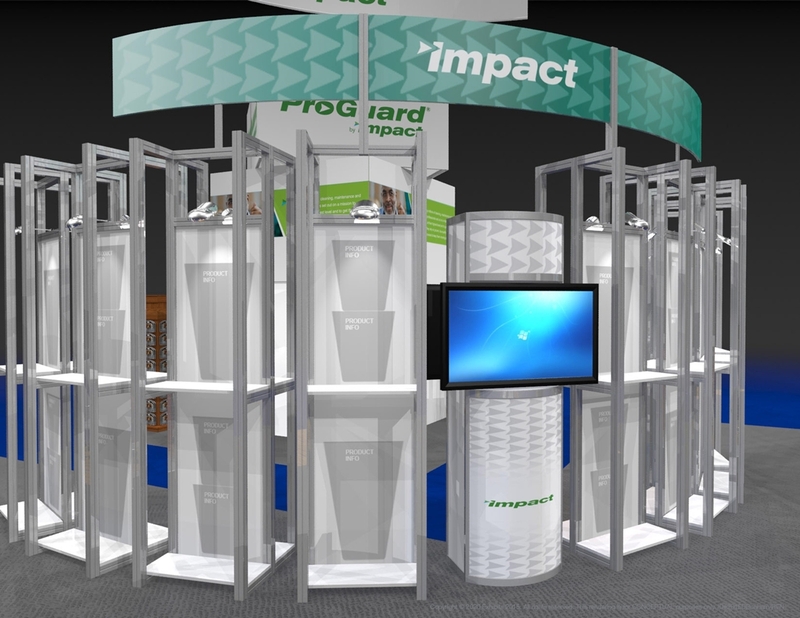 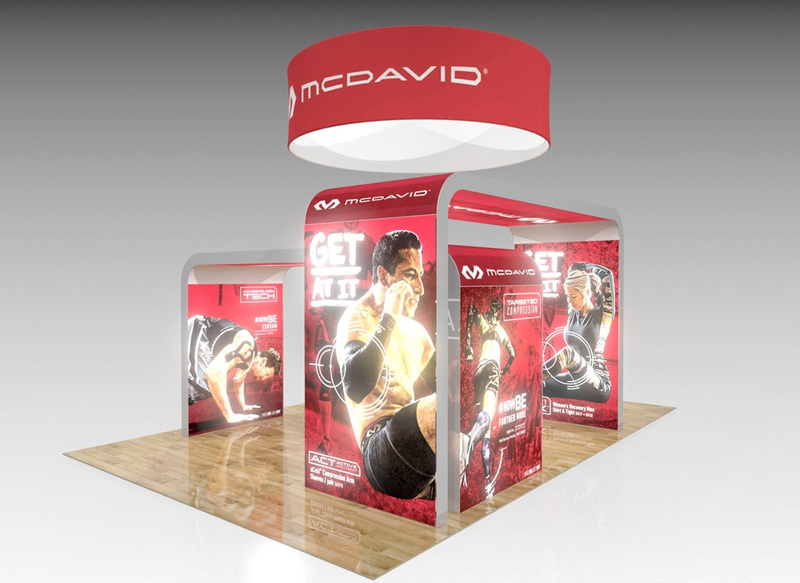 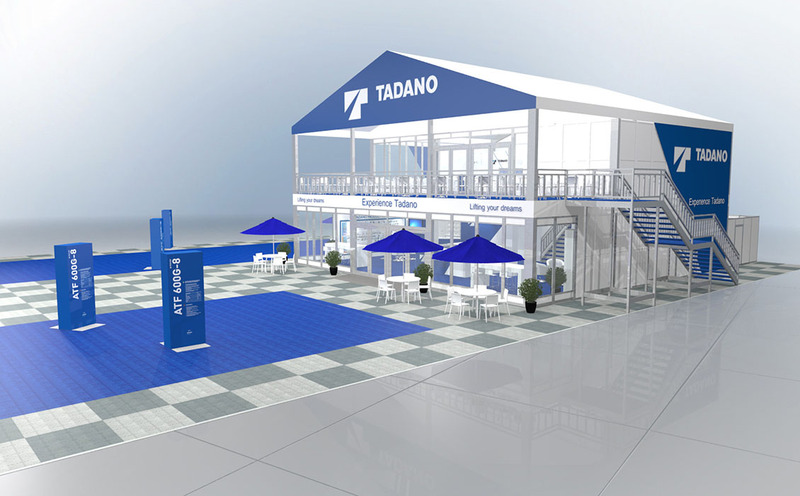 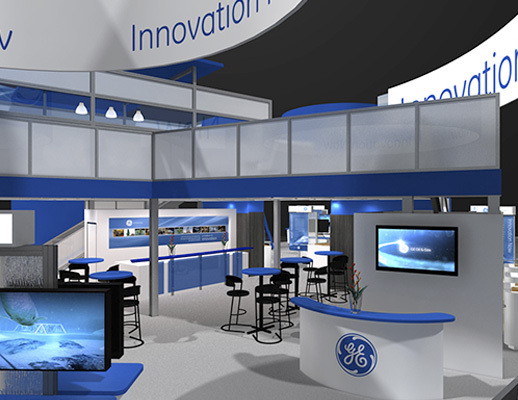 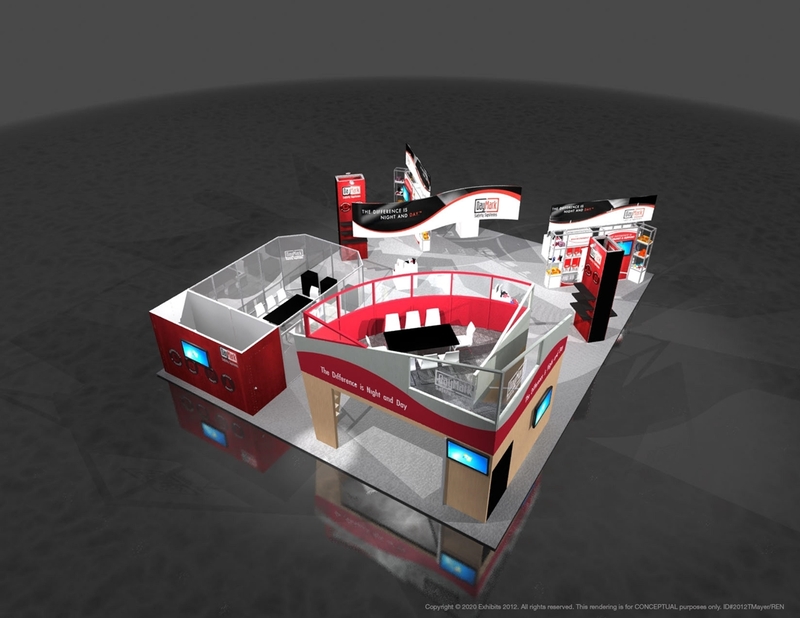 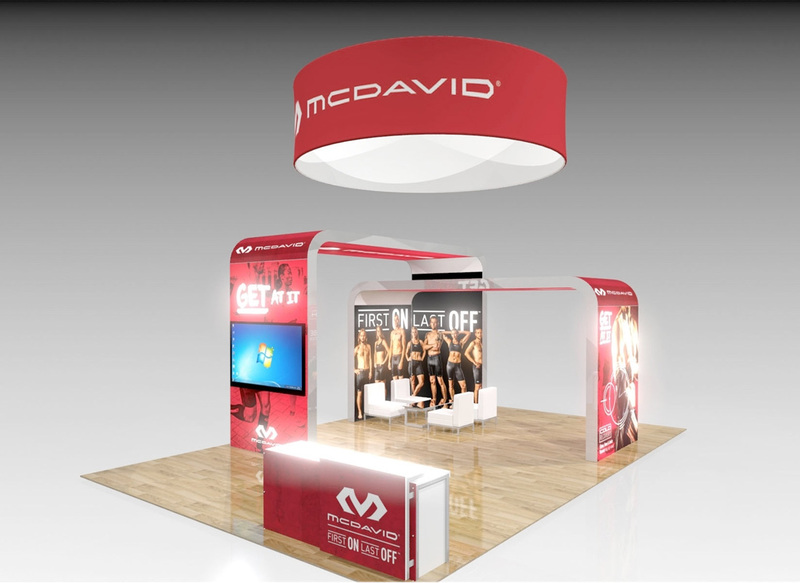 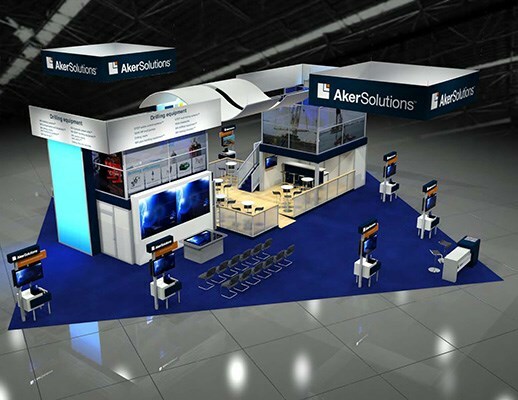 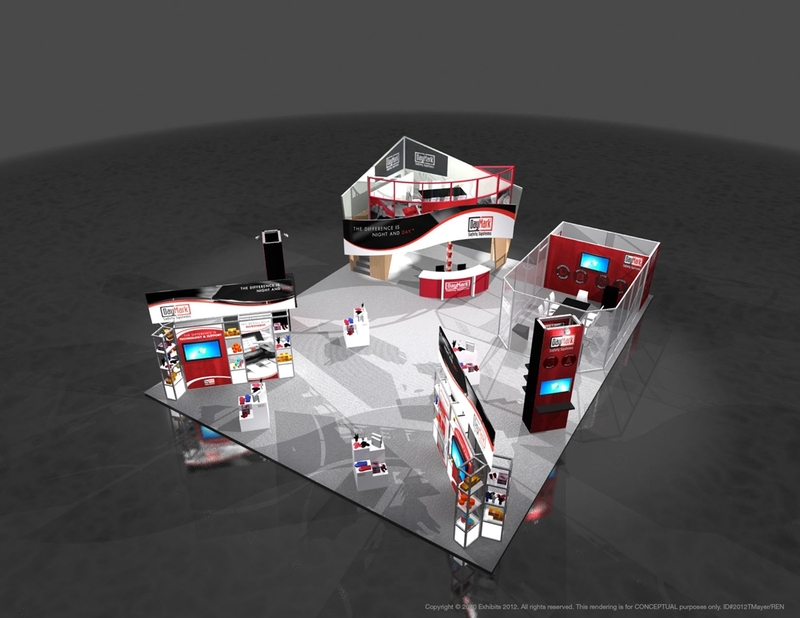 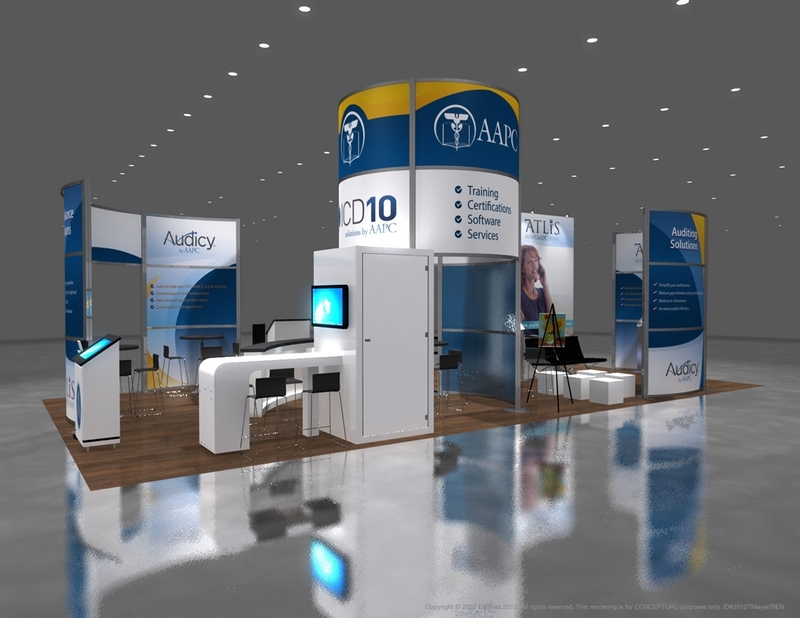 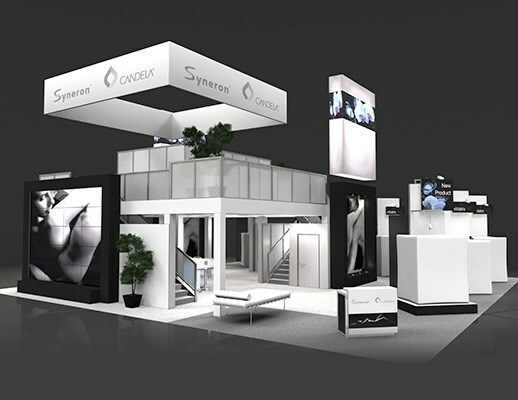 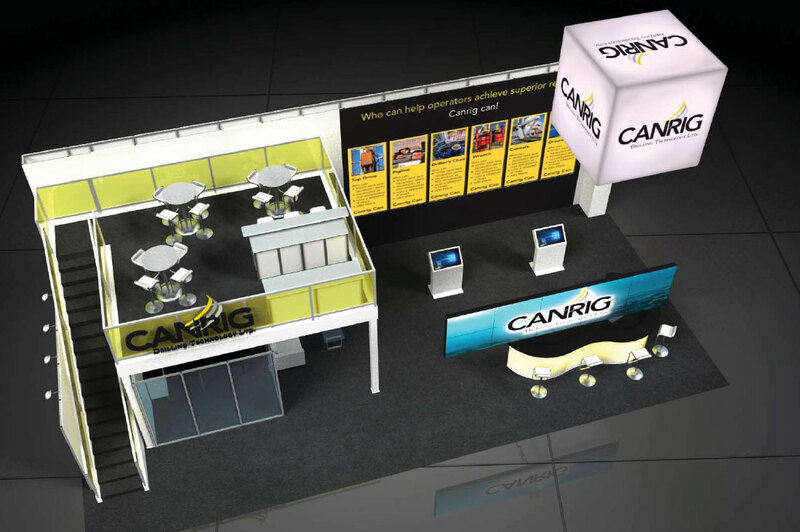 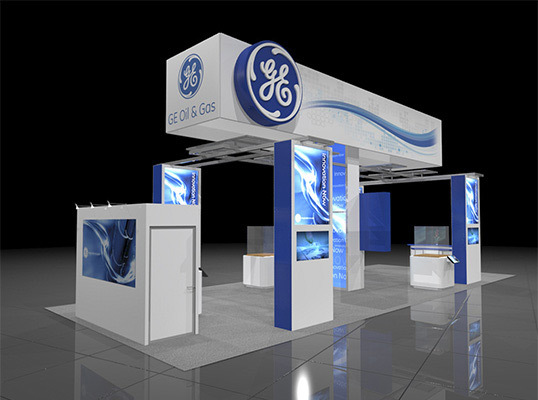 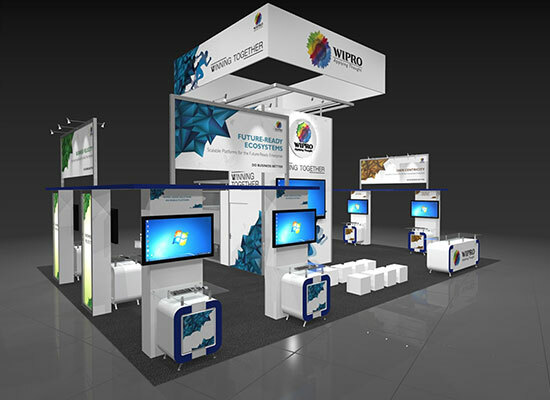 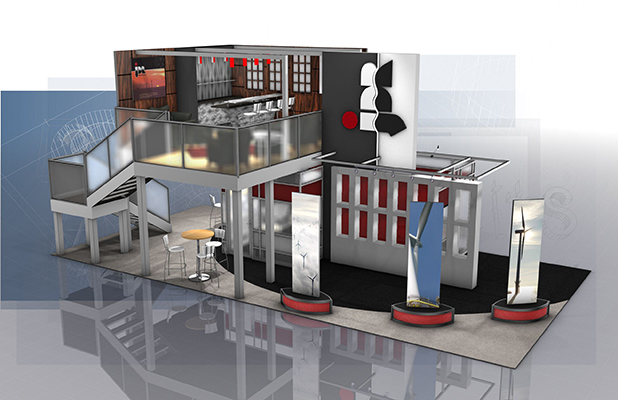 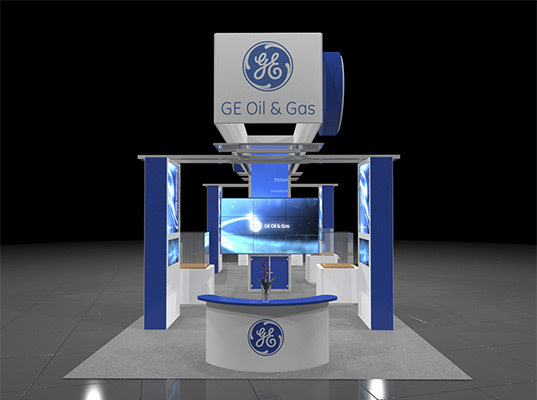 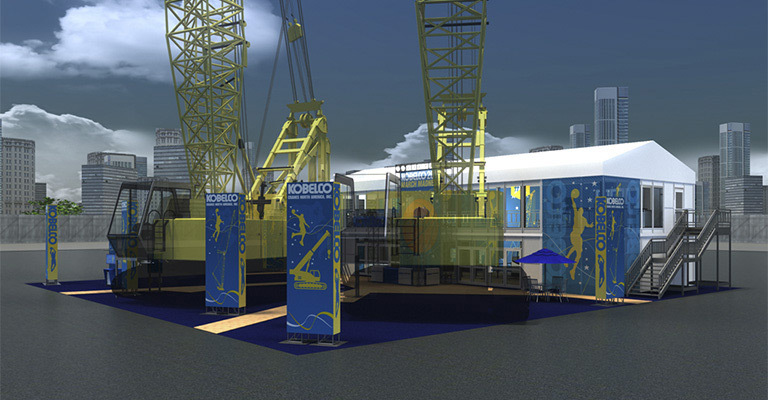 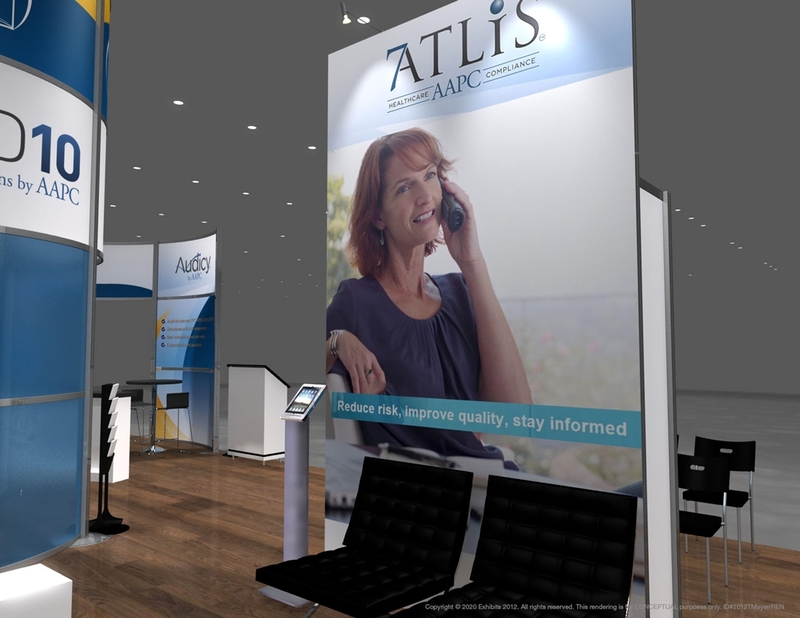 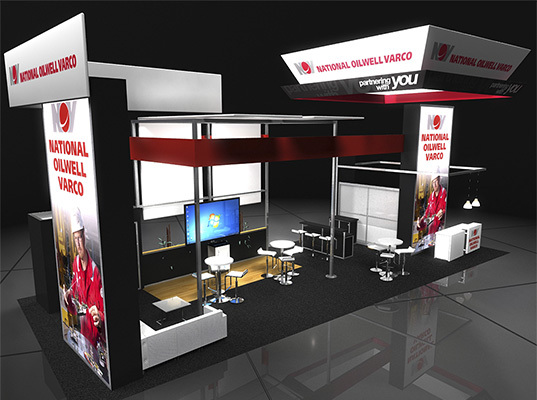 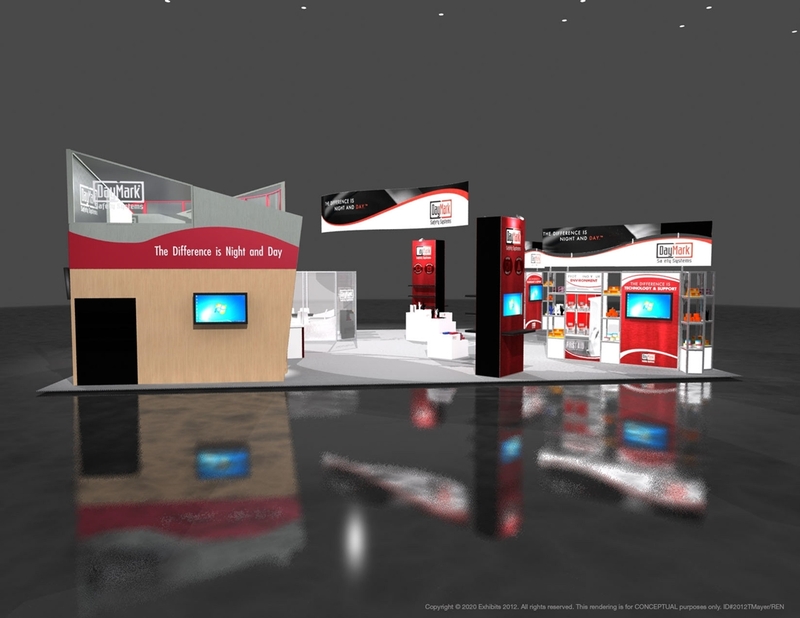 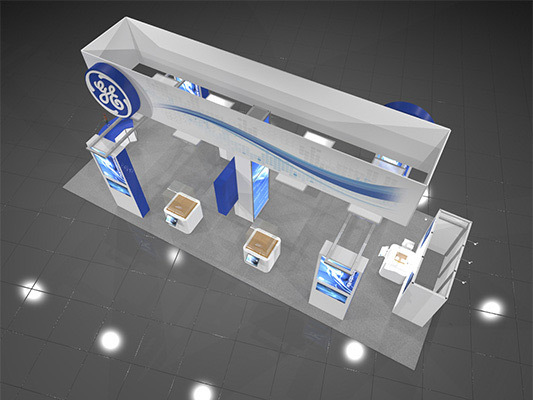 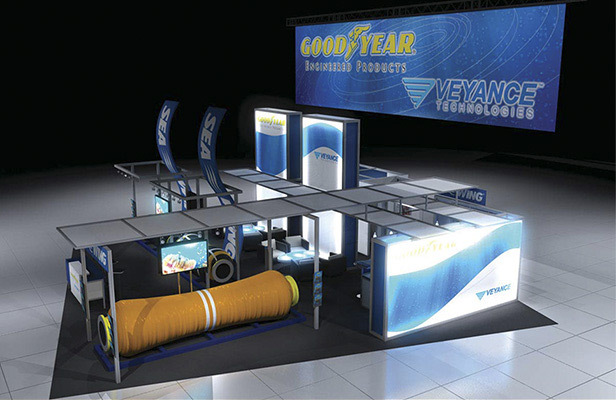 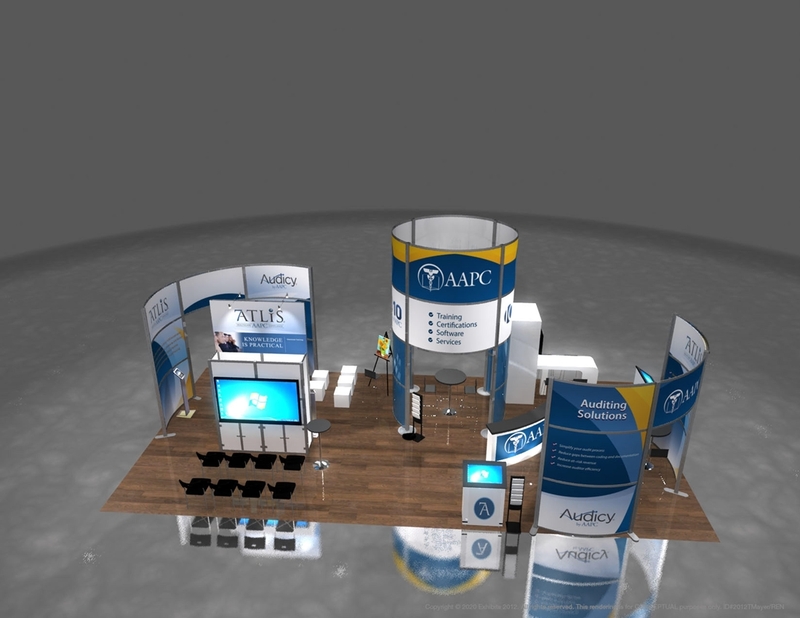 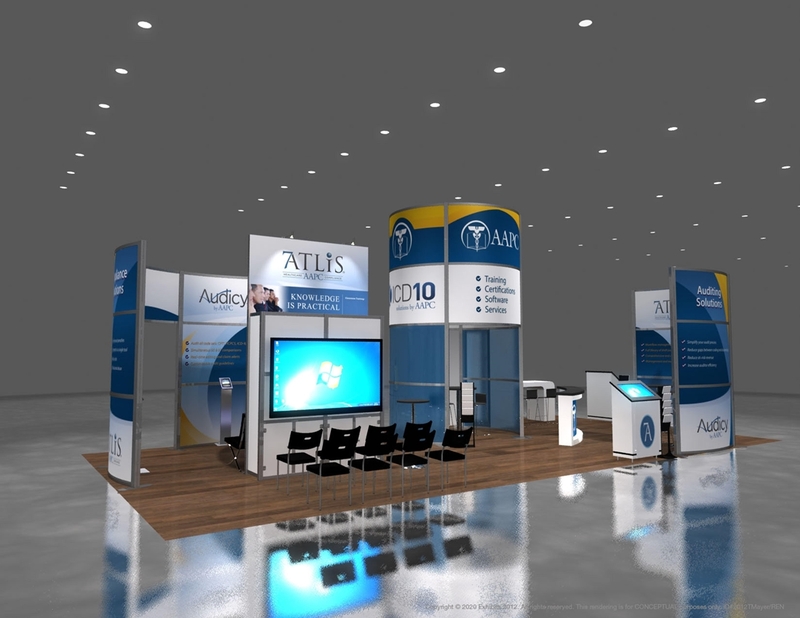 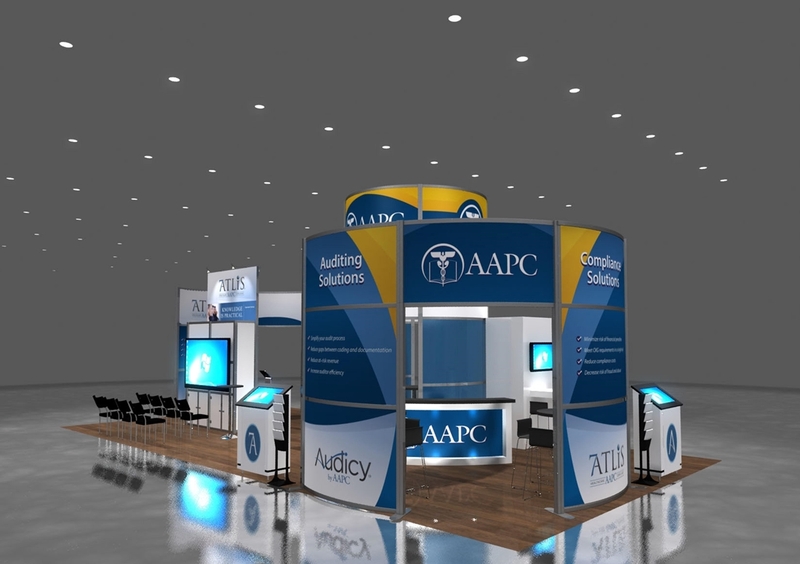 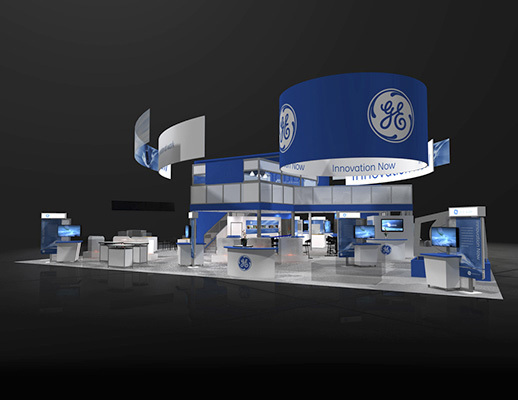 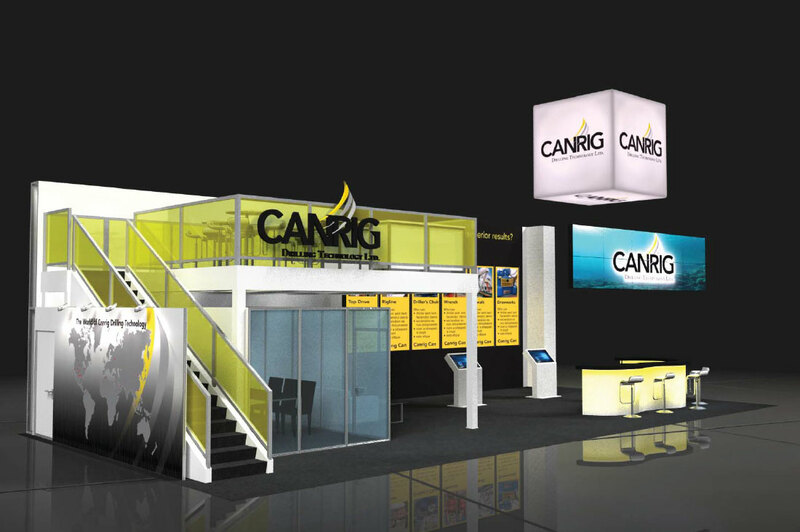 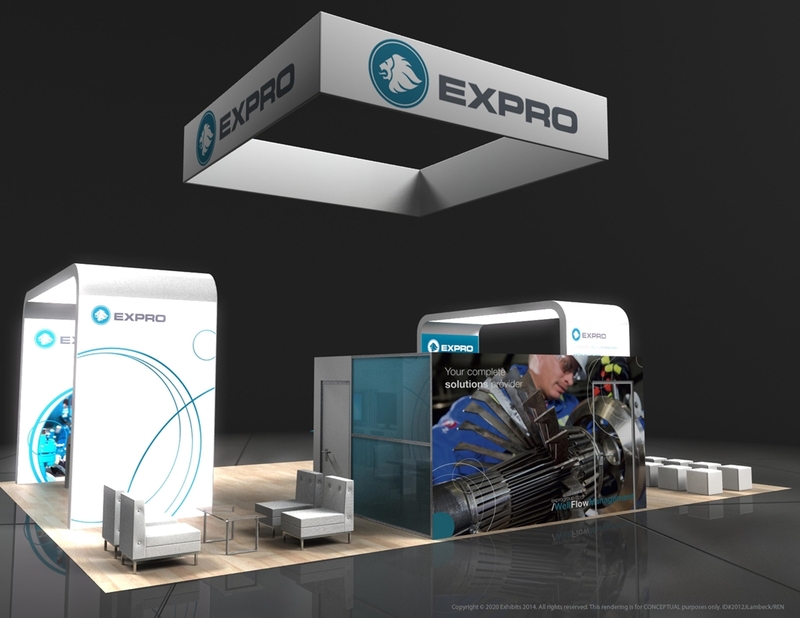 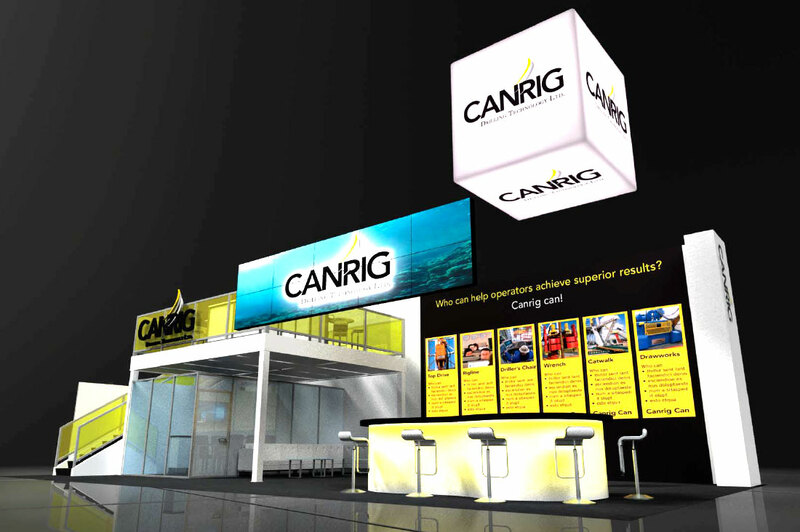 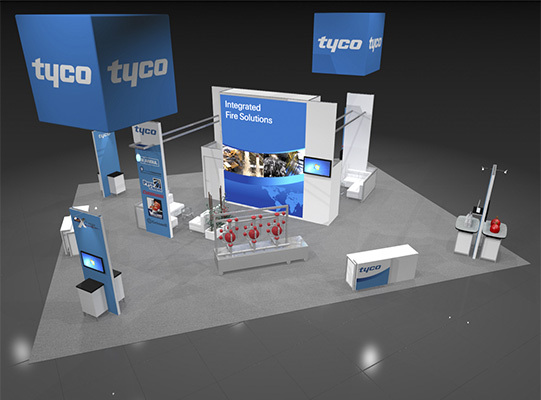 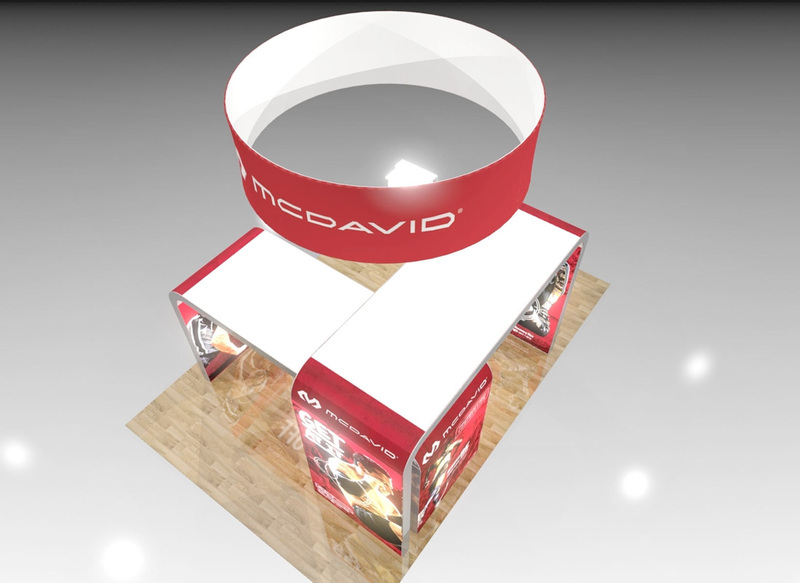 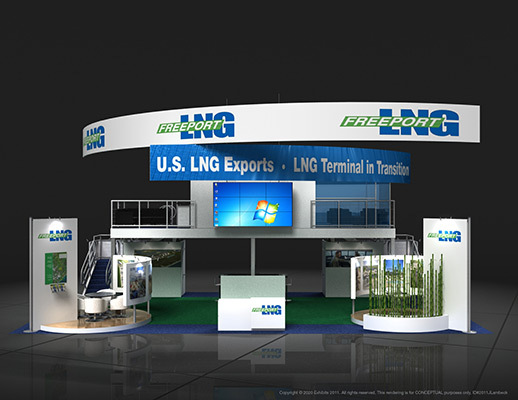 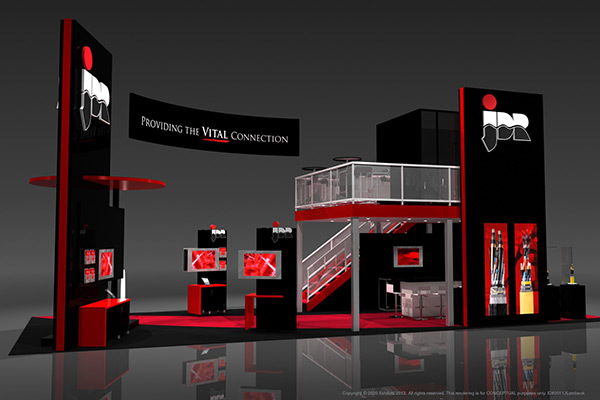 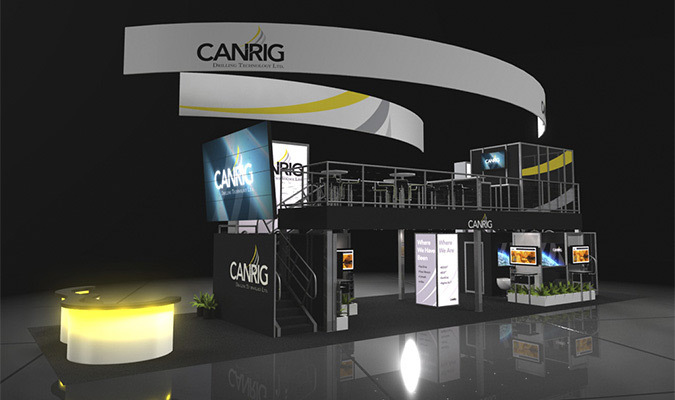 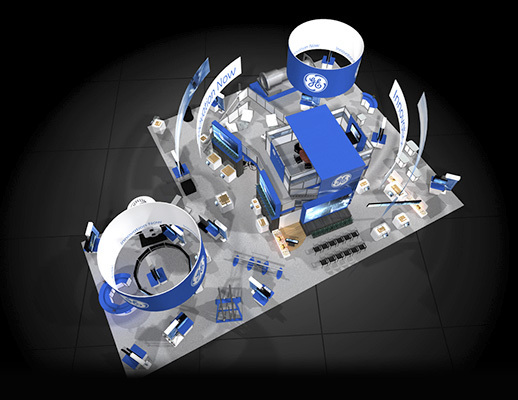 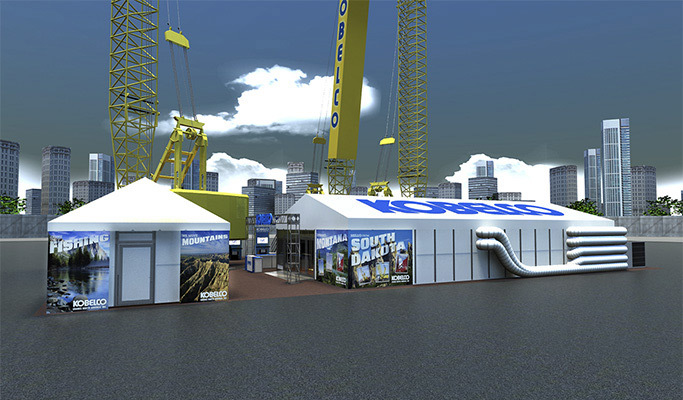 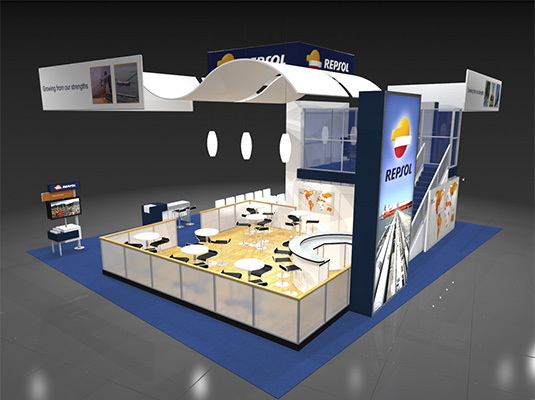 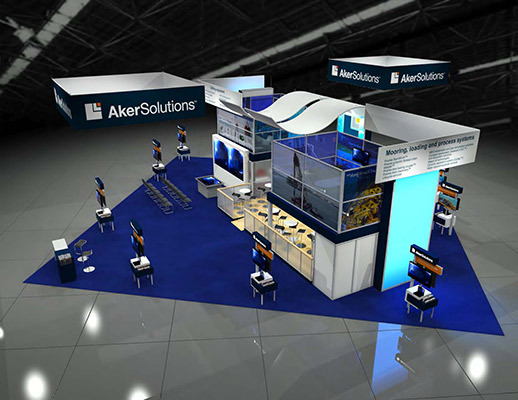 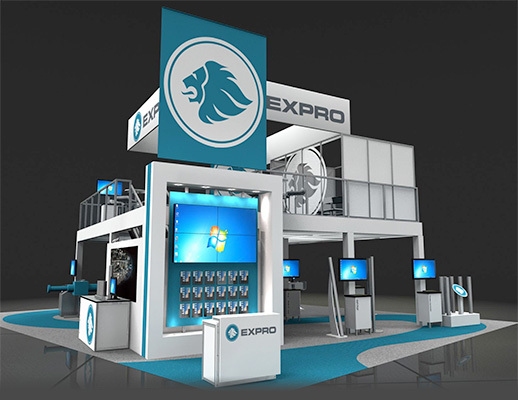 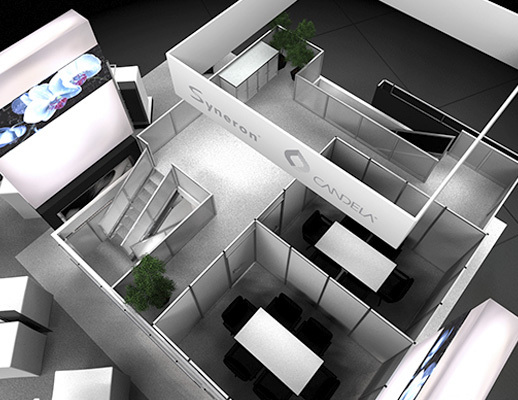 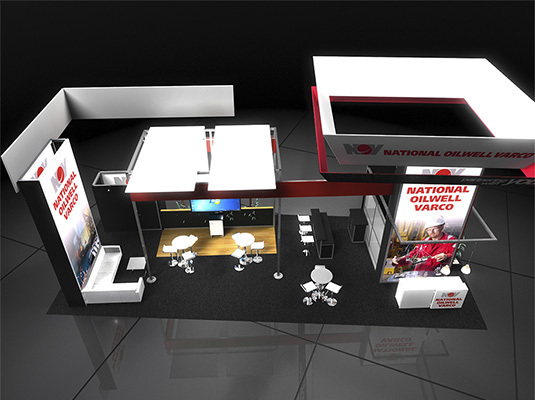 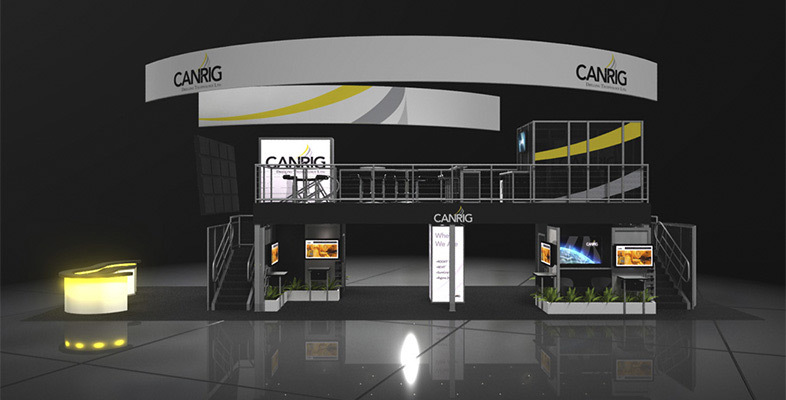 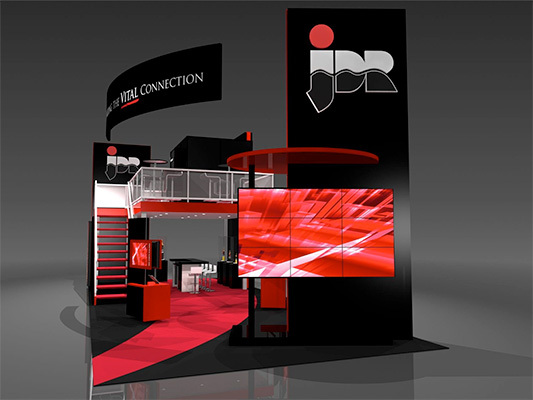 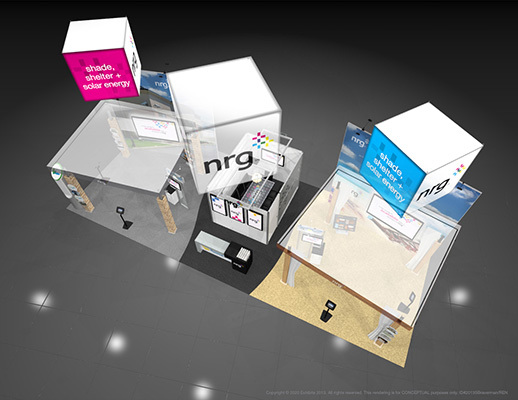 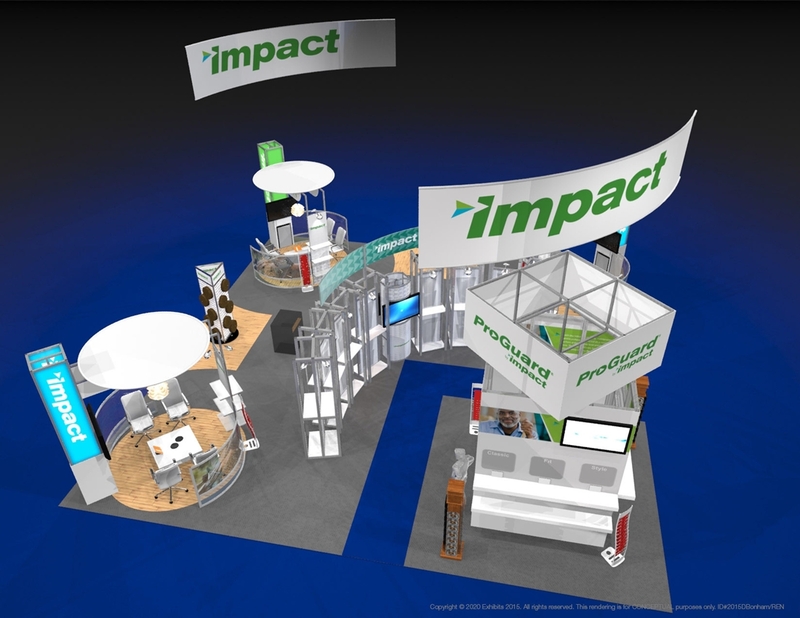 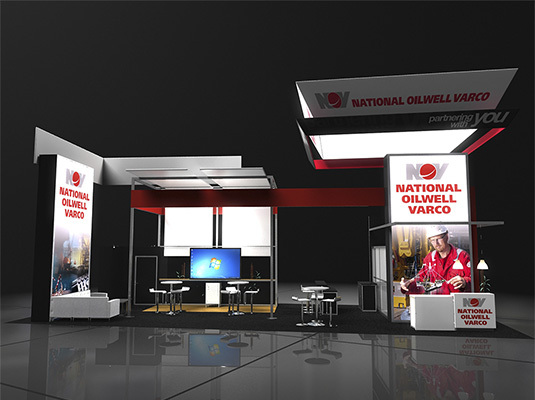 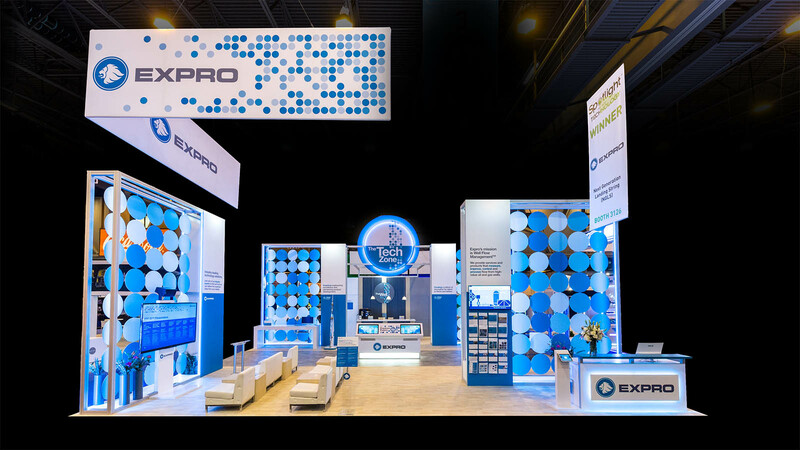 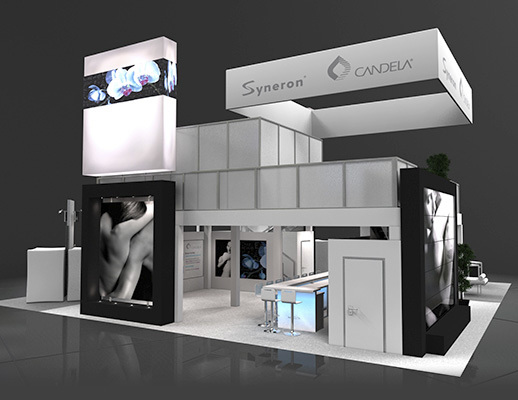 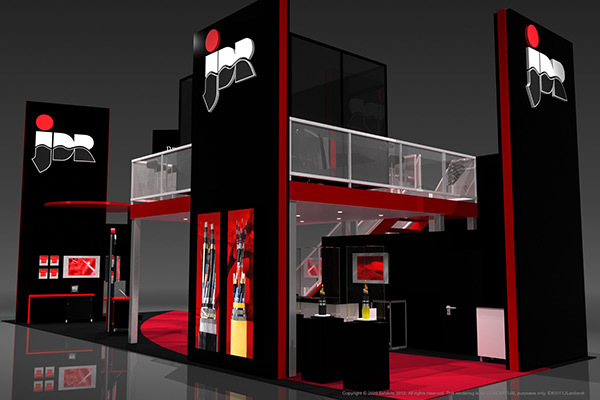 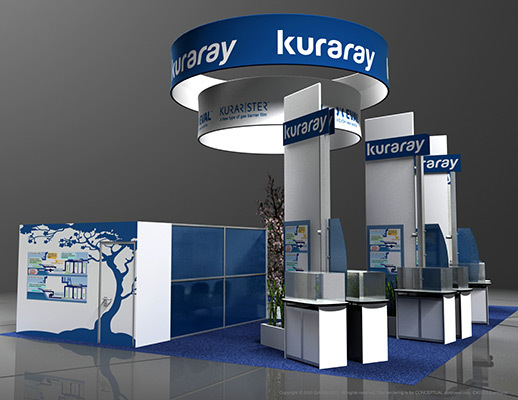 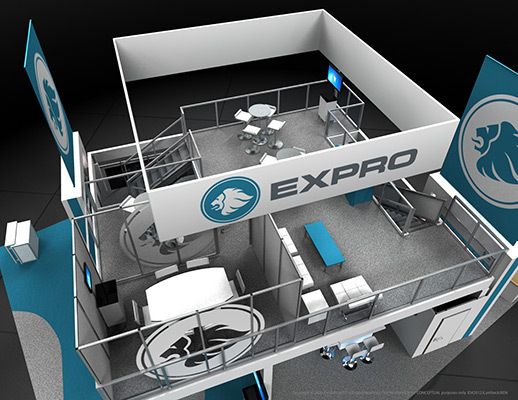 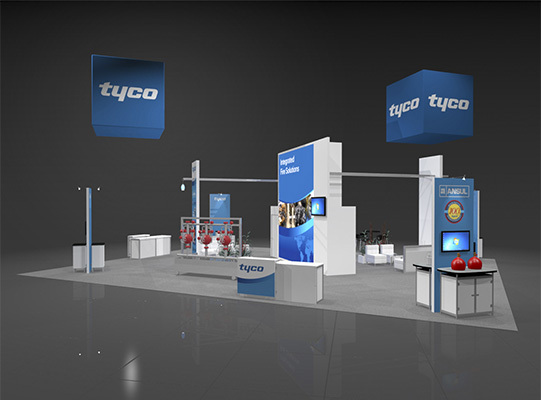 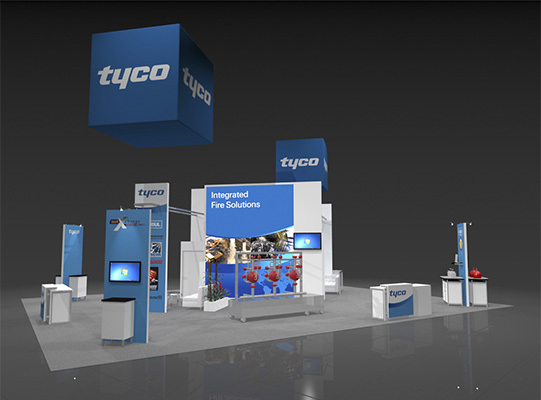 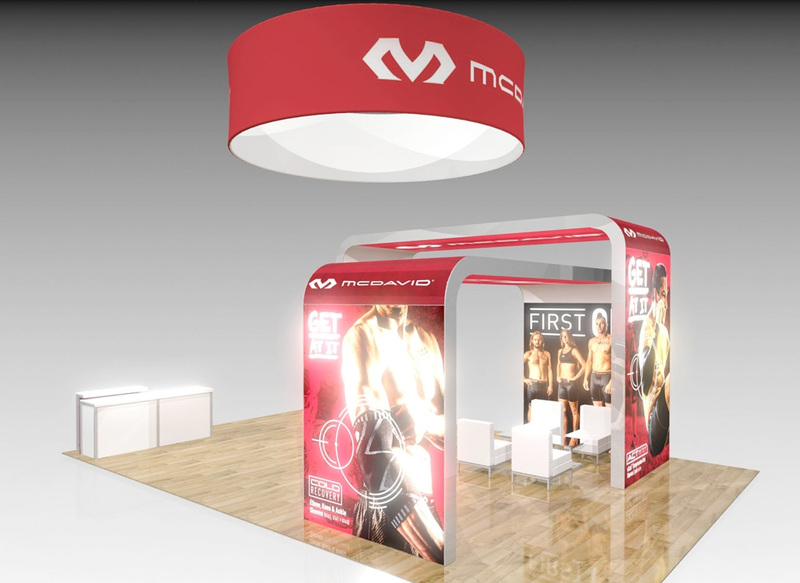 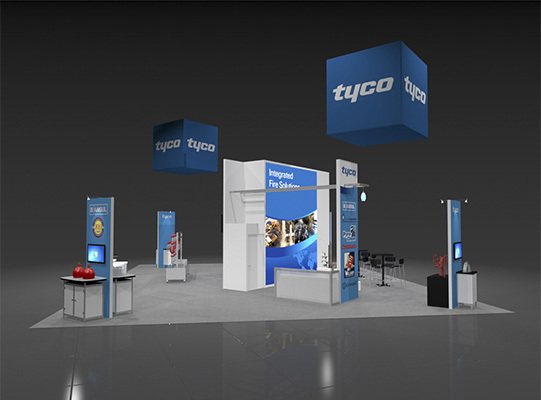 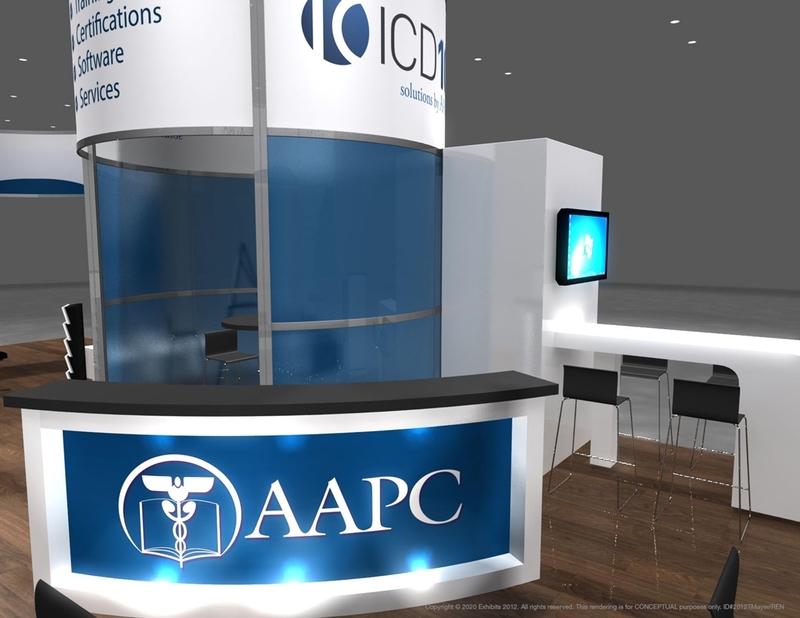 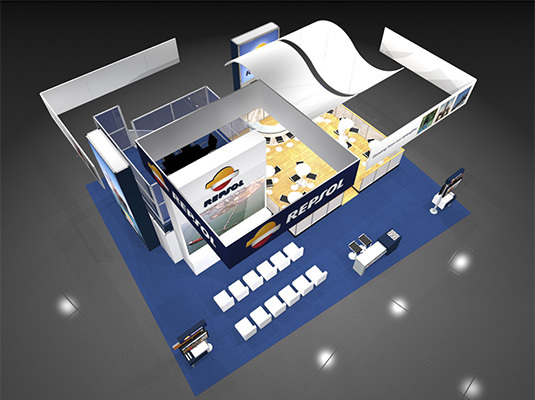 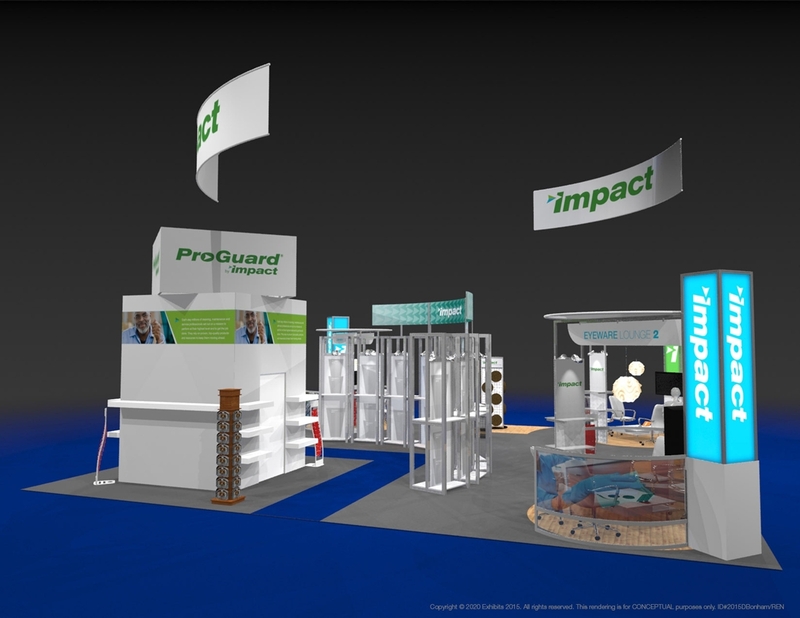 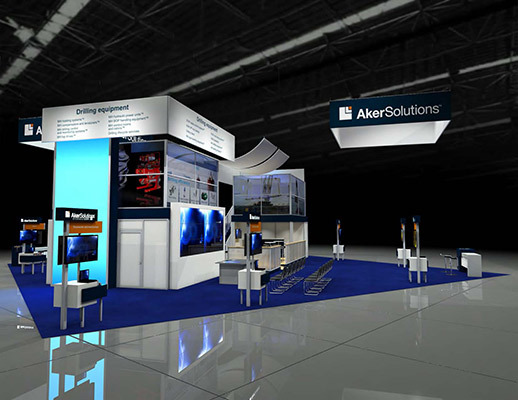 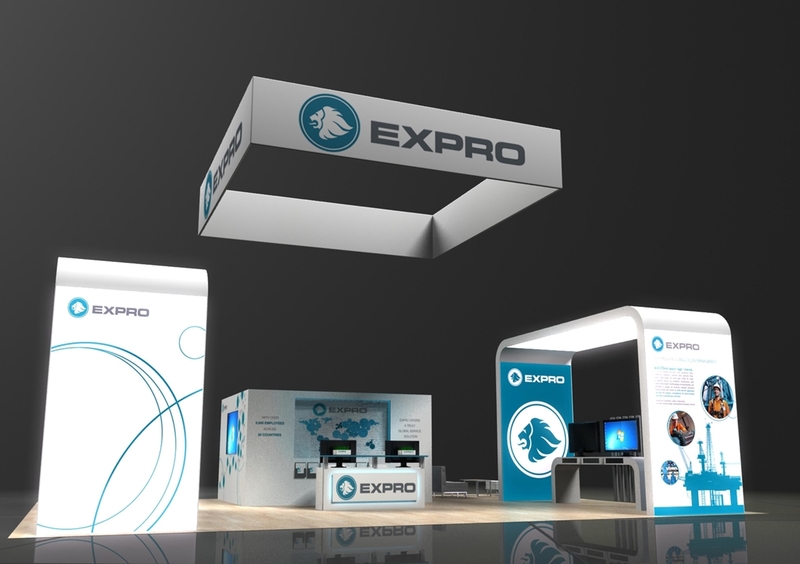 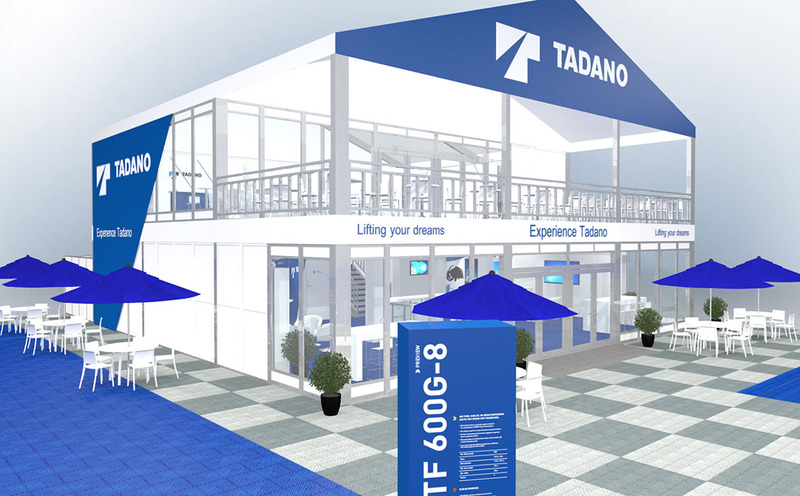 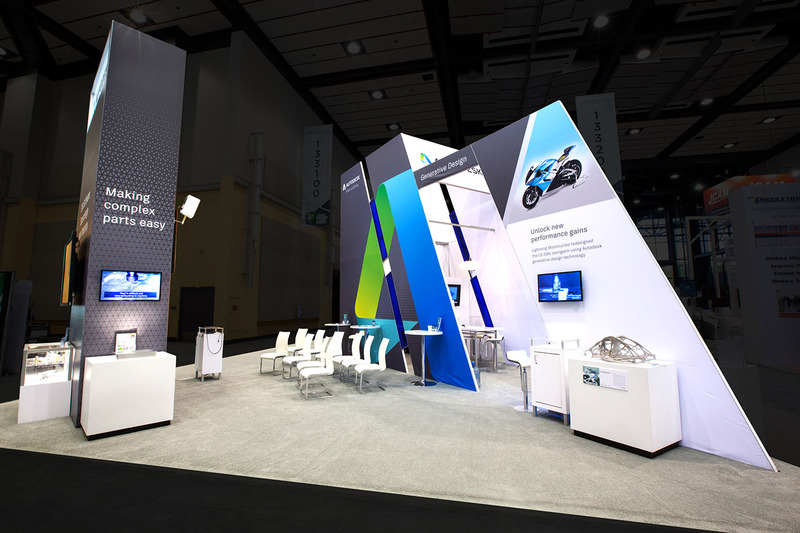 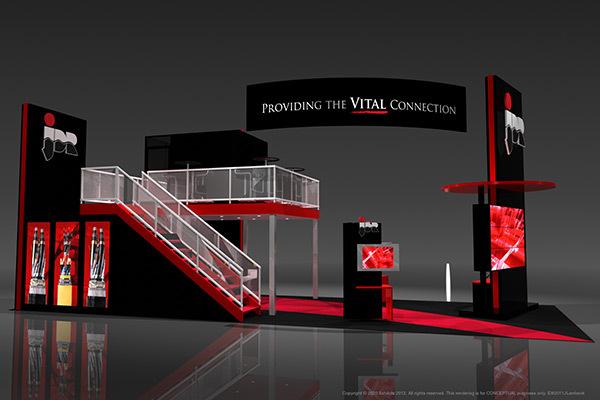 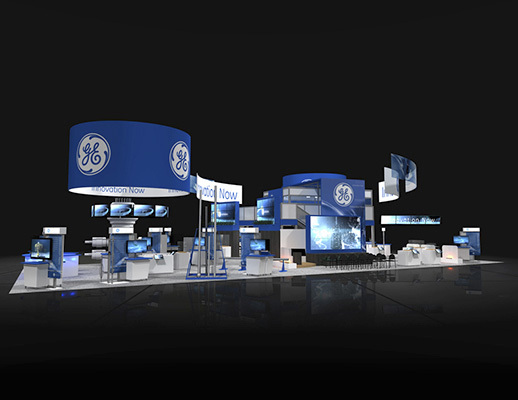 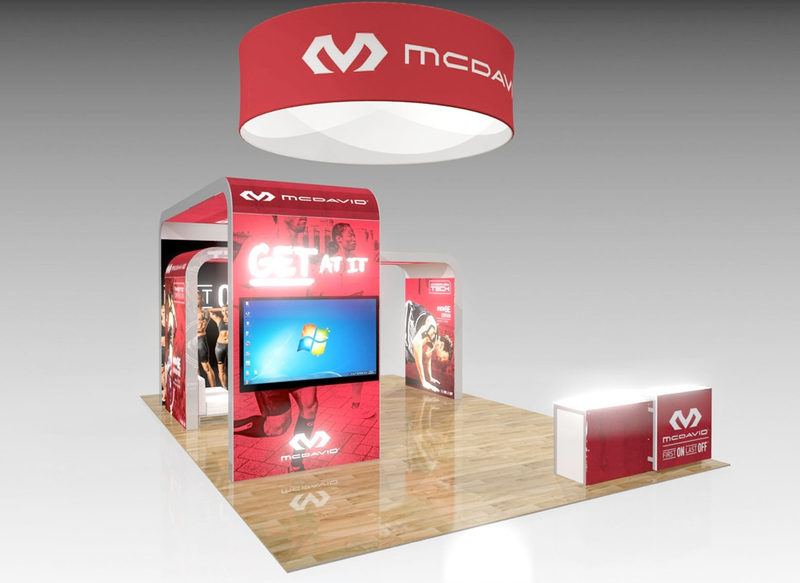 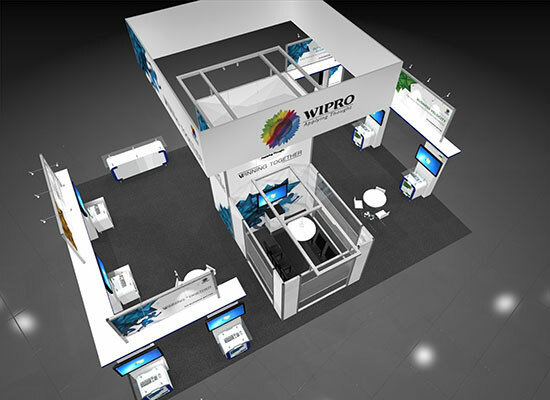 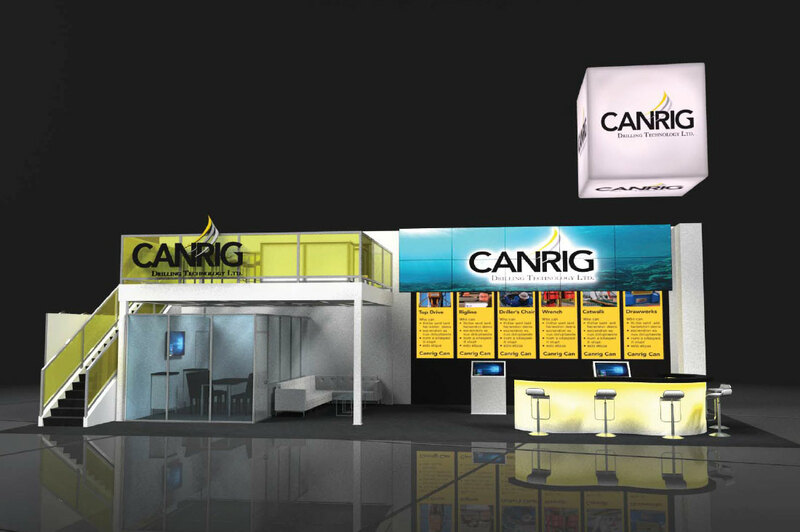 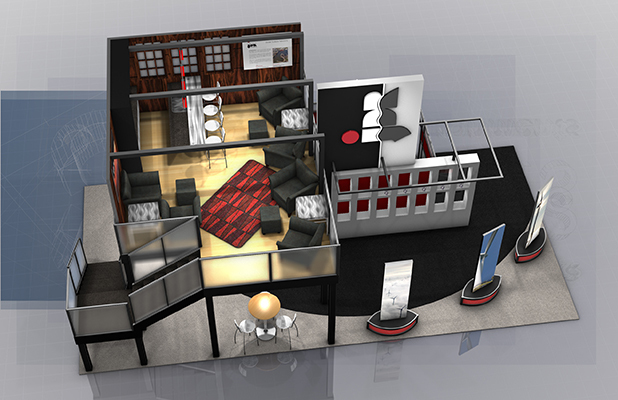 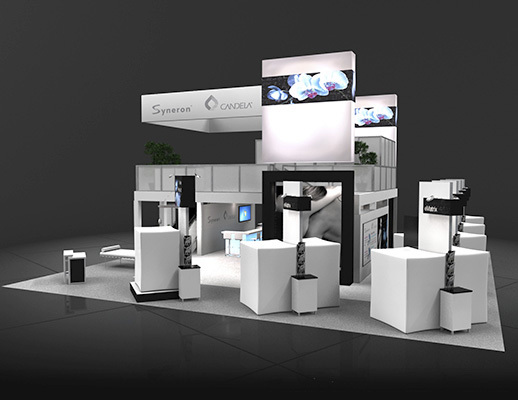 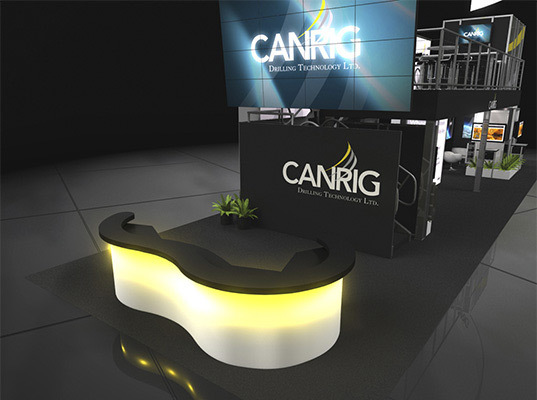 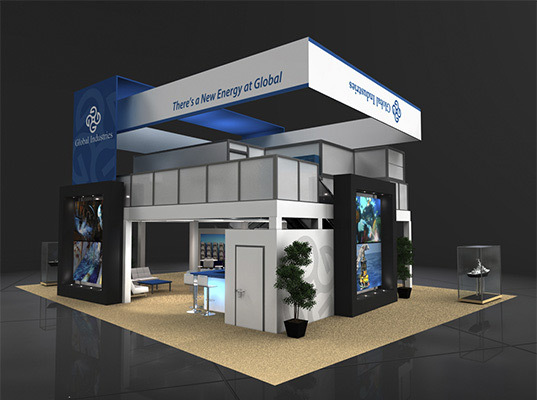 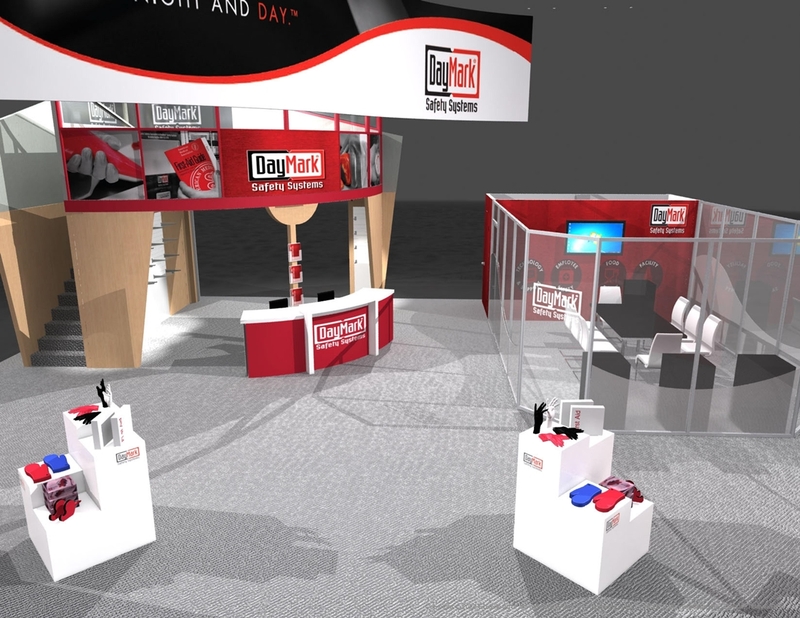 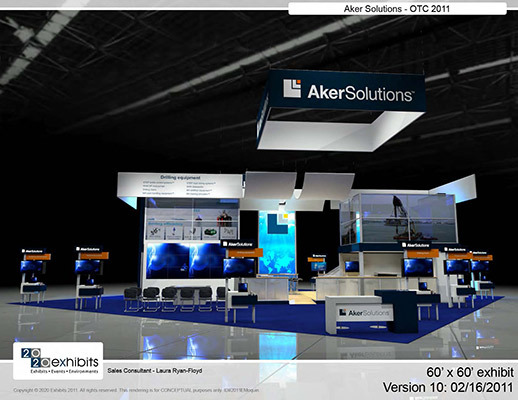 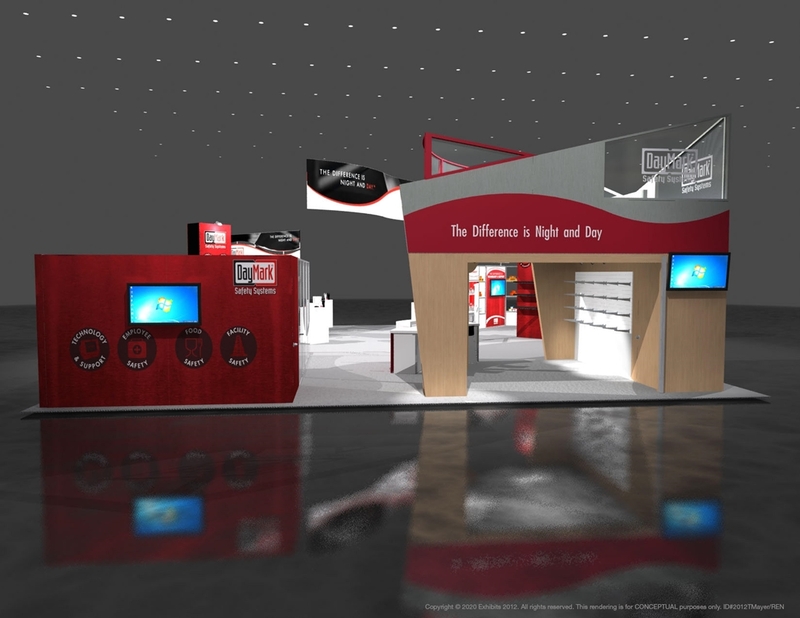 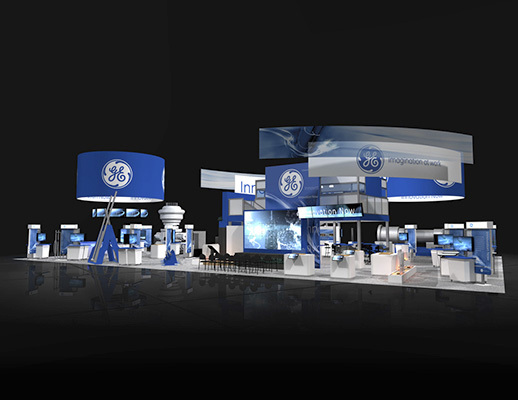 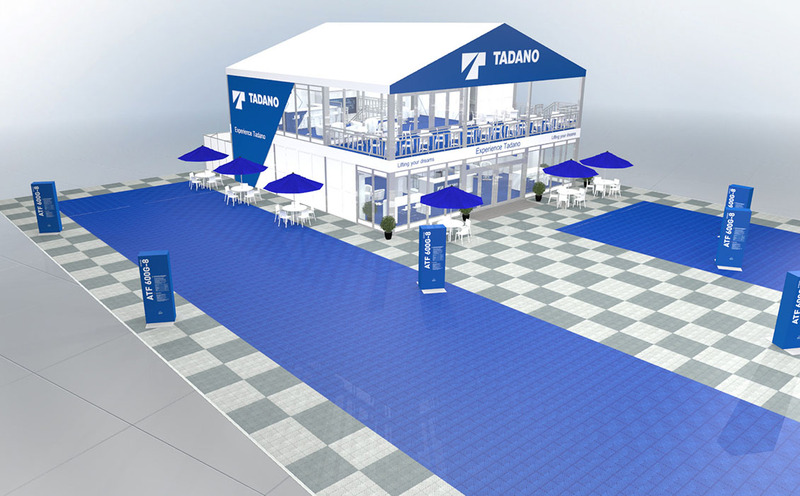 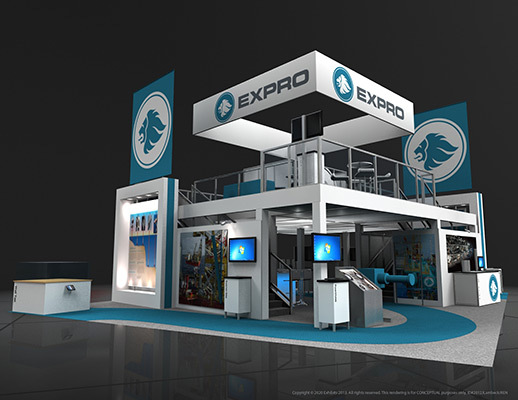 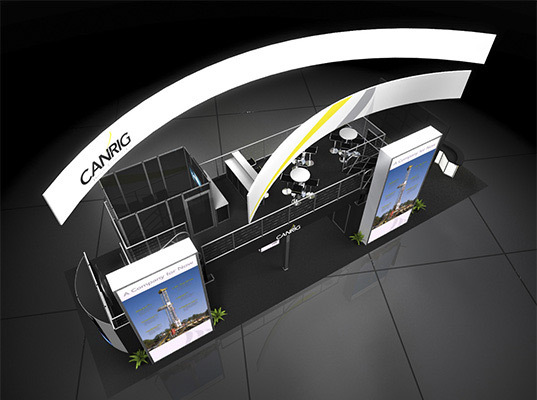 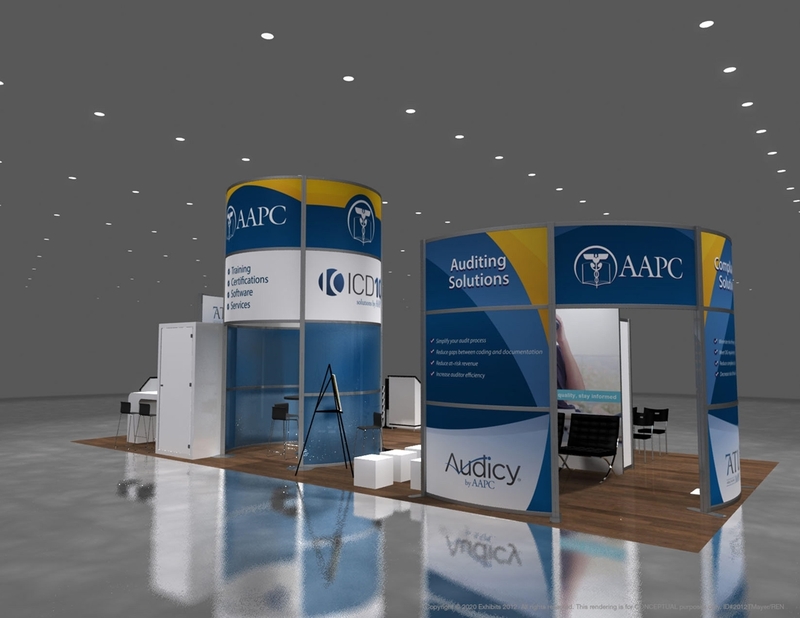 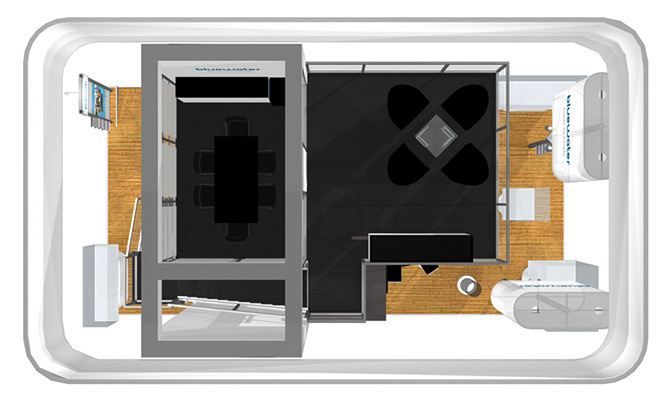 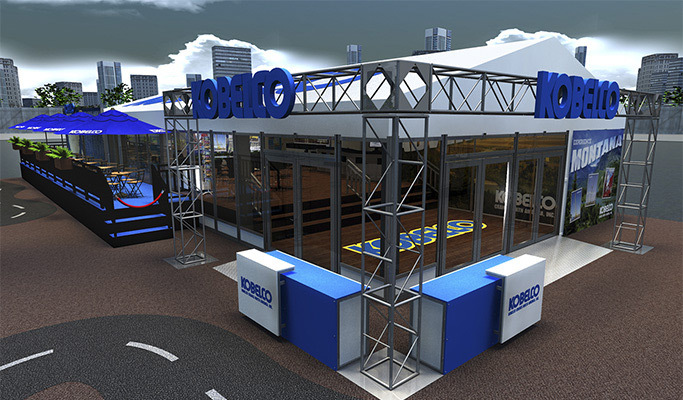 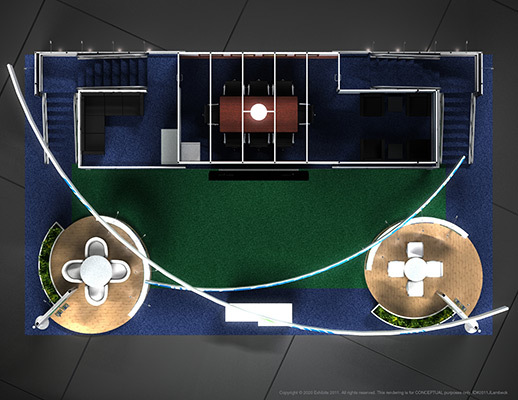 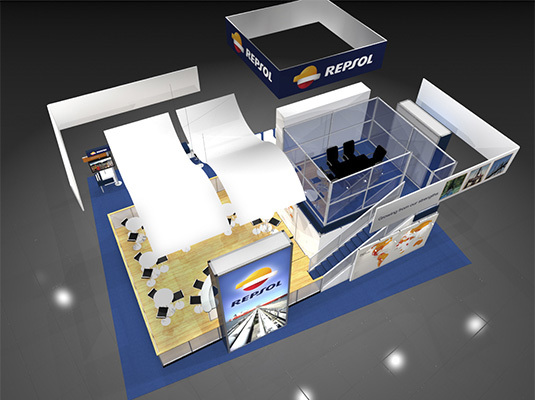 Very elaborate and large-scale booth including just about anything a presenter or attendee could want to see. 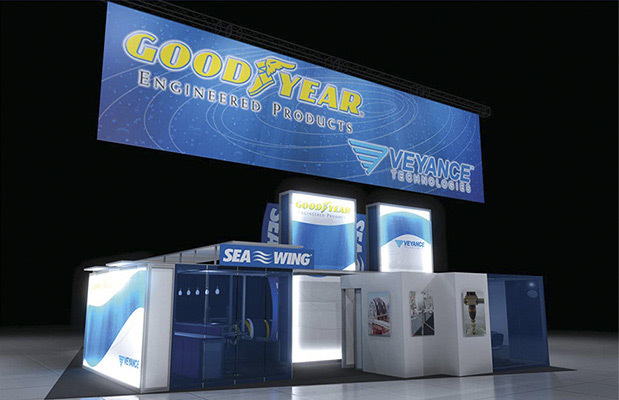 Large, circular, prominent graphic signs overhead, as well as large curved ones. 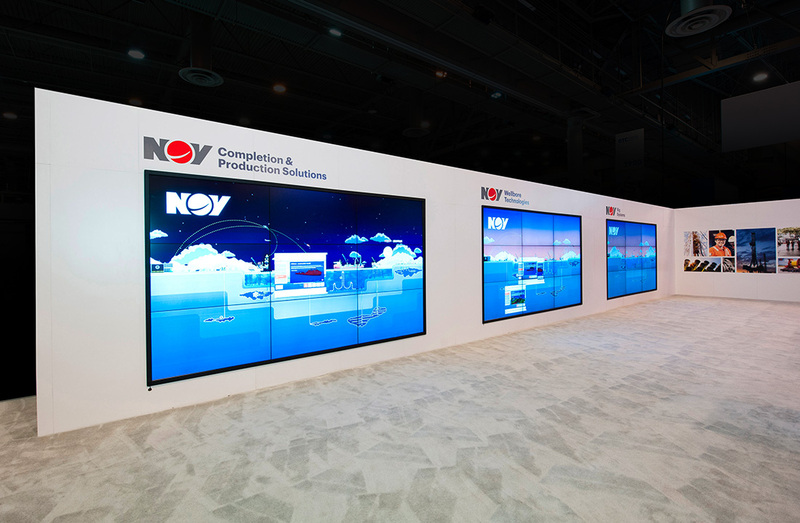 Much interactivity available. 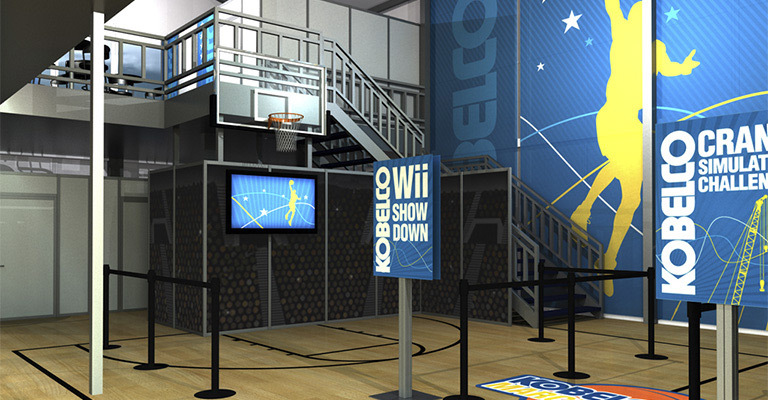 Visitors could spend a large amount of time visiting each station and part of the exhibit without hitting the same spot twice. 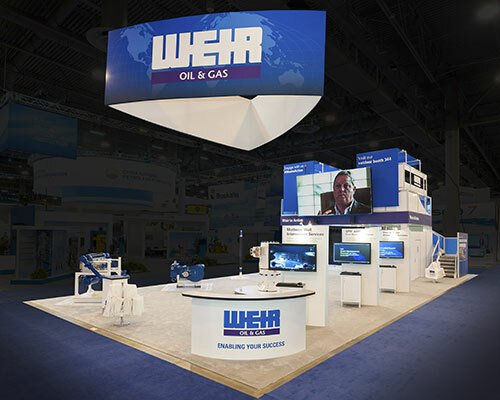 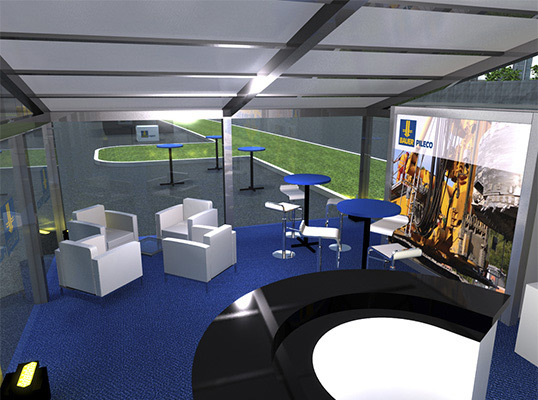 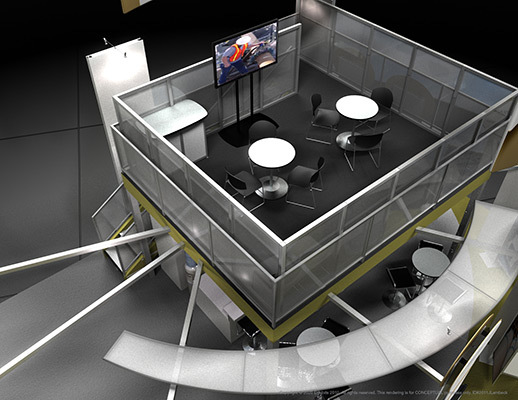 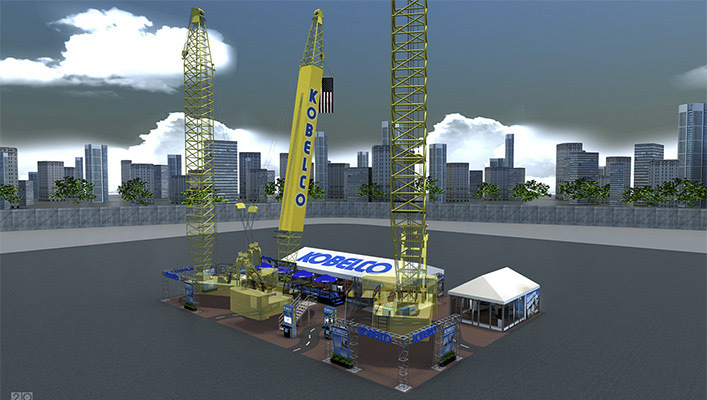 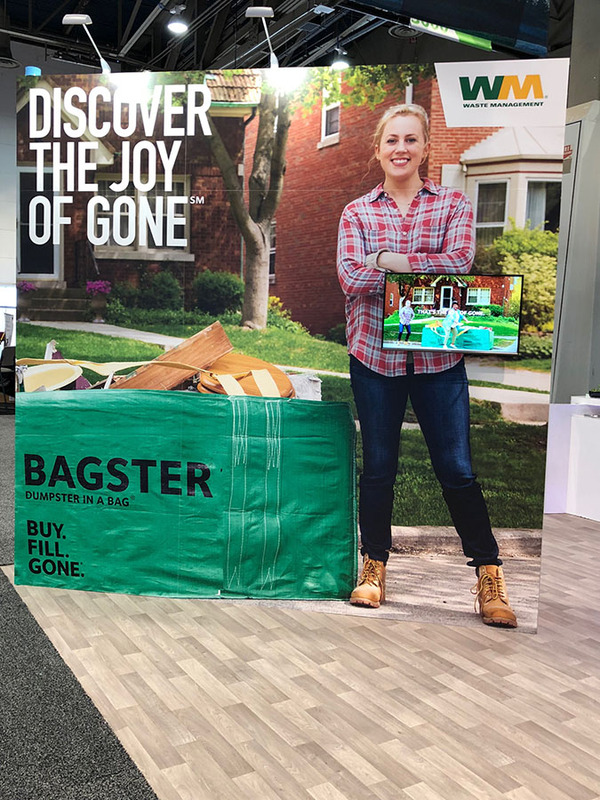 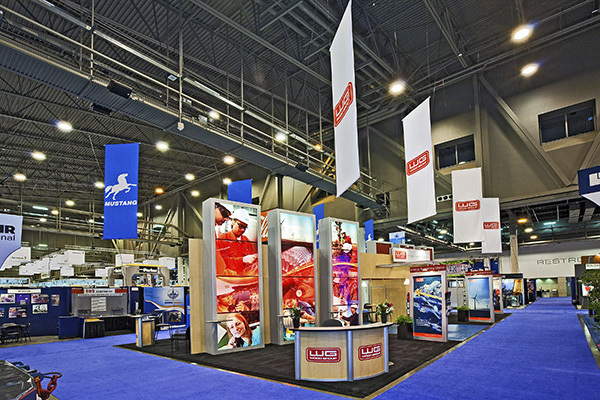 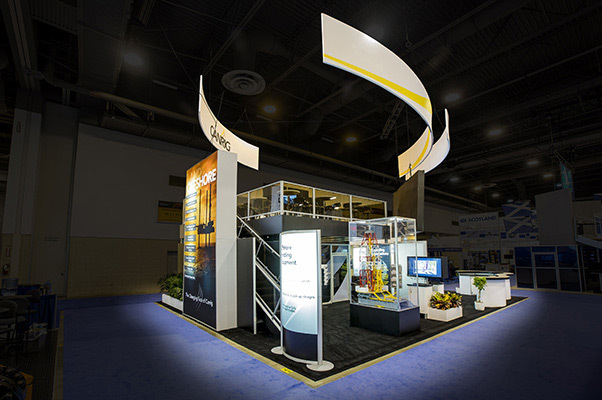 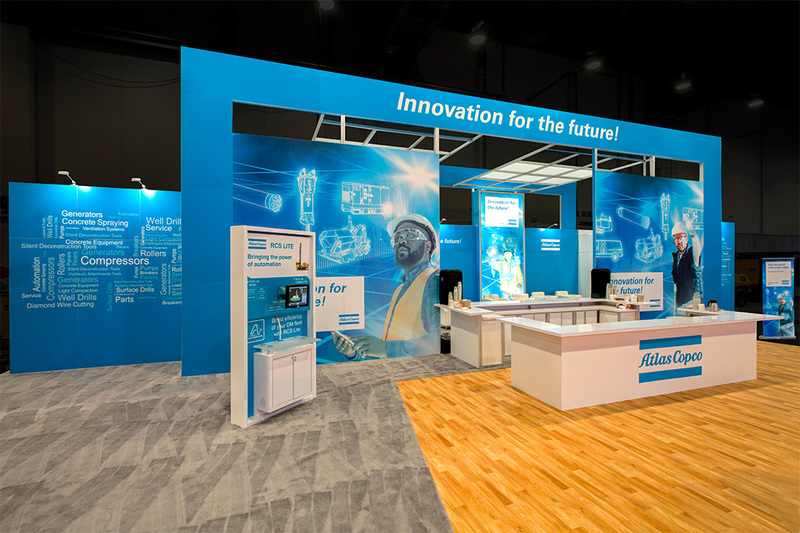 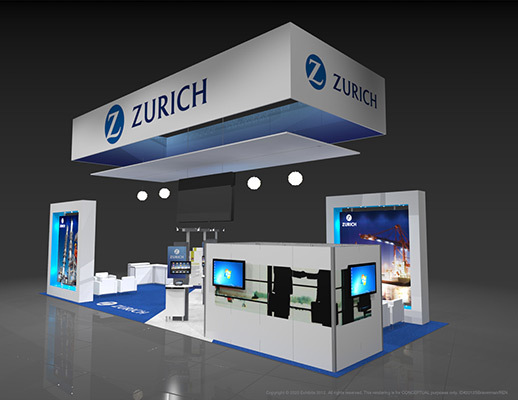 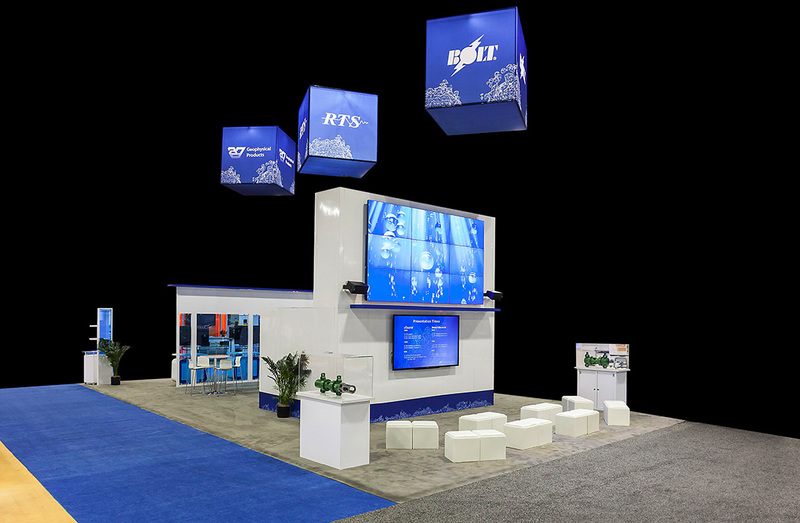 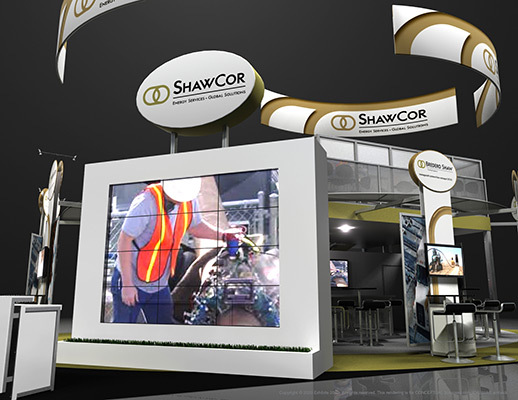 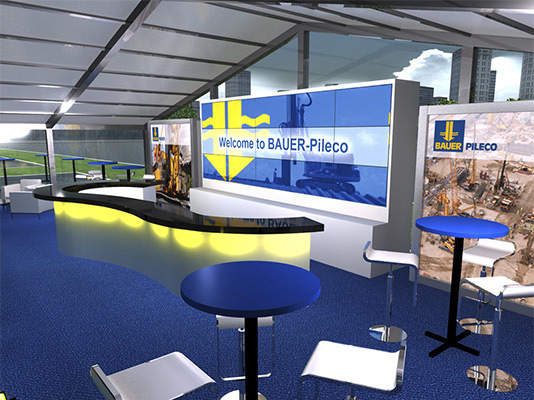 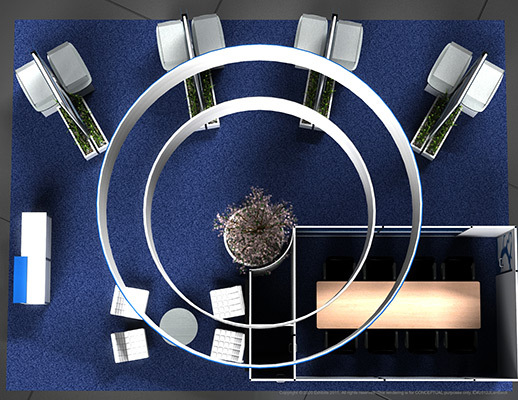 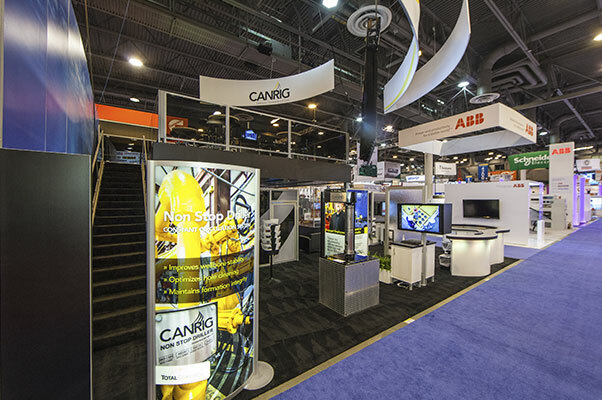 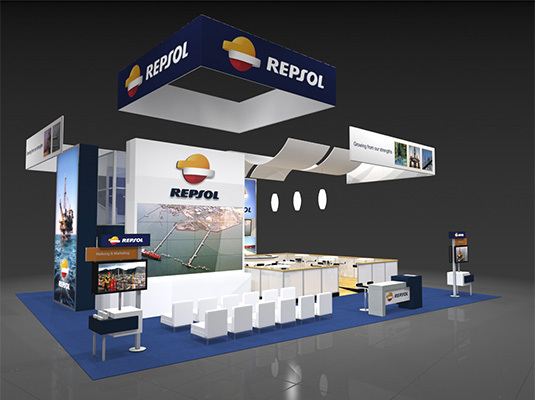 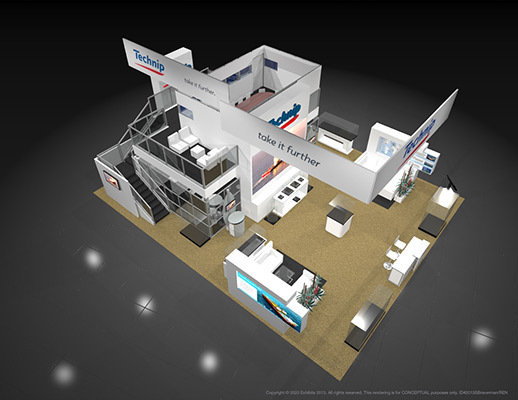 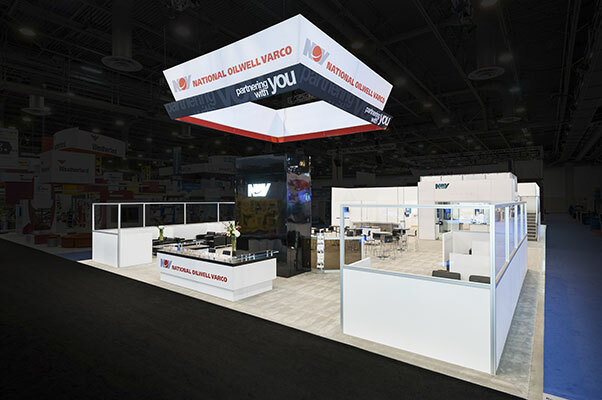 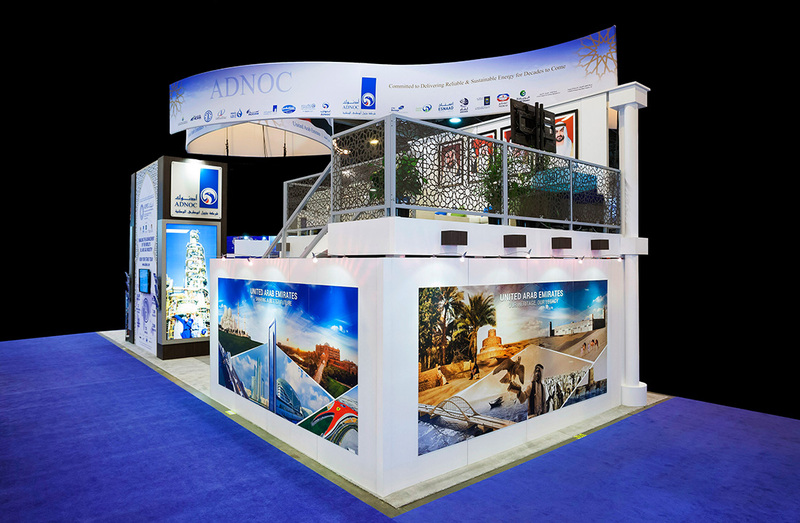 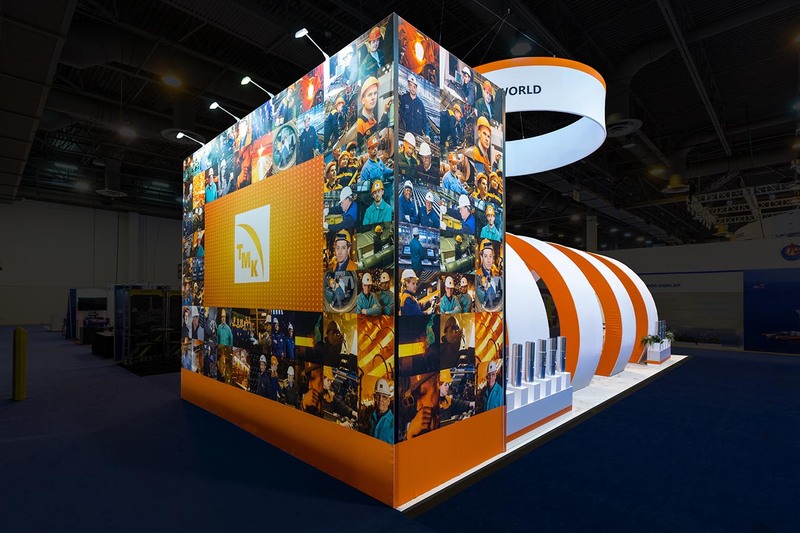 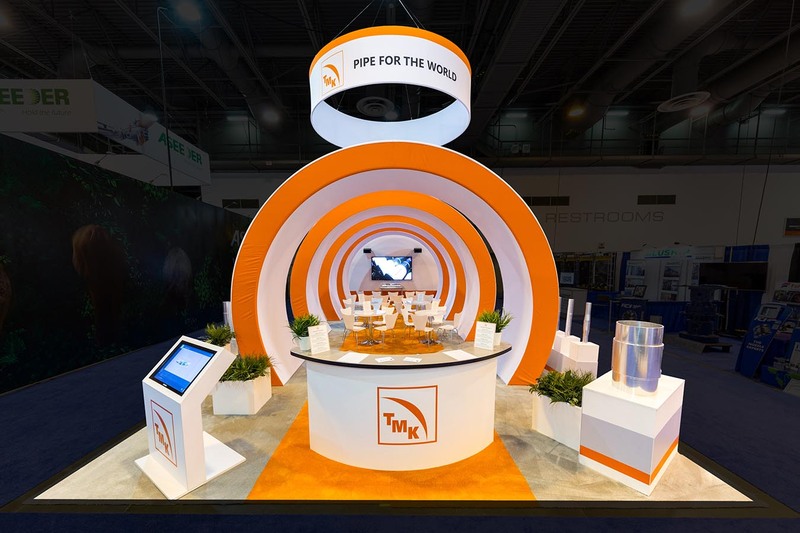 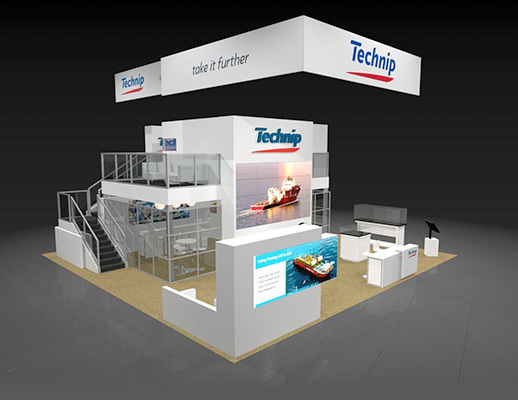 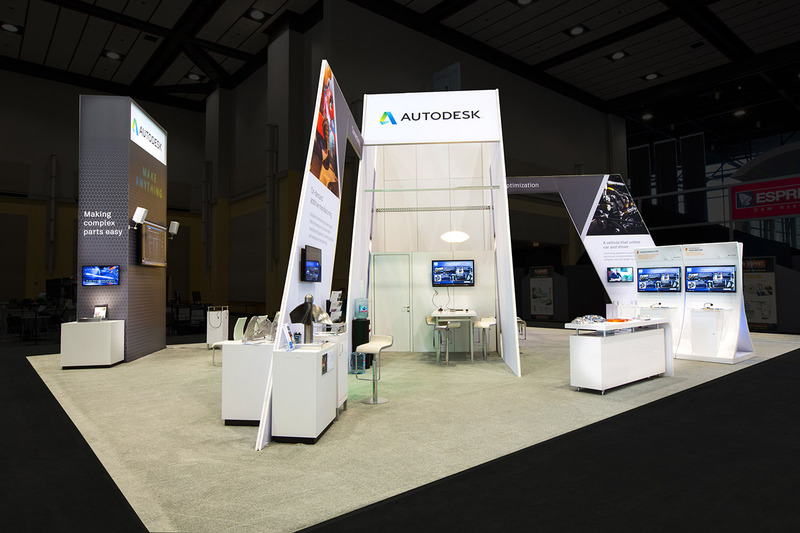 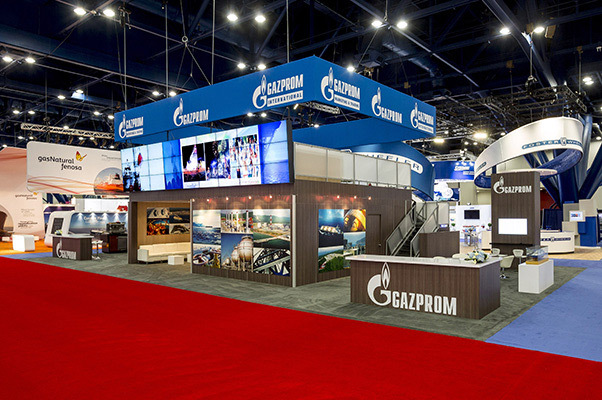 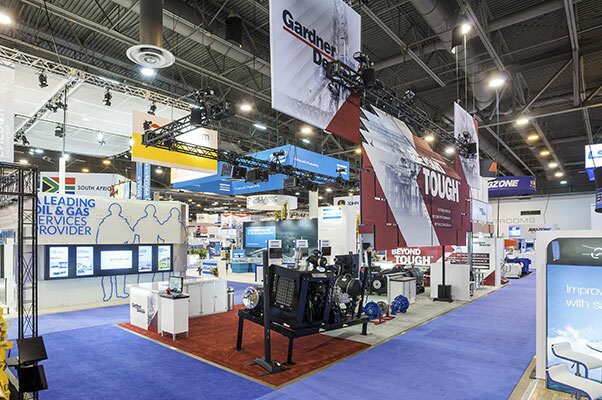 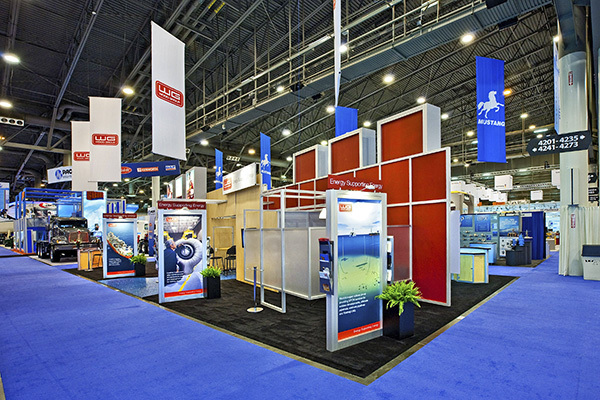 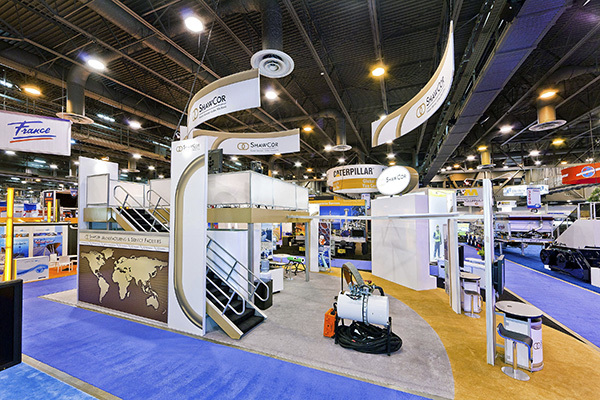 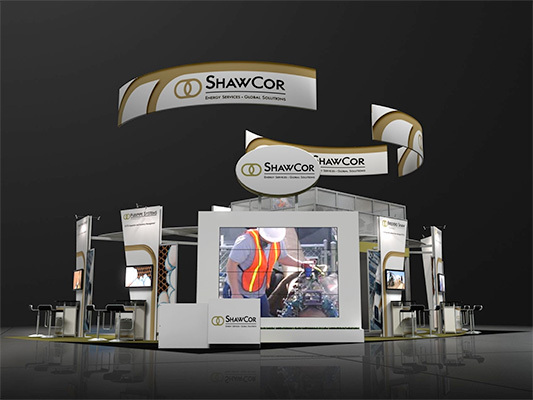 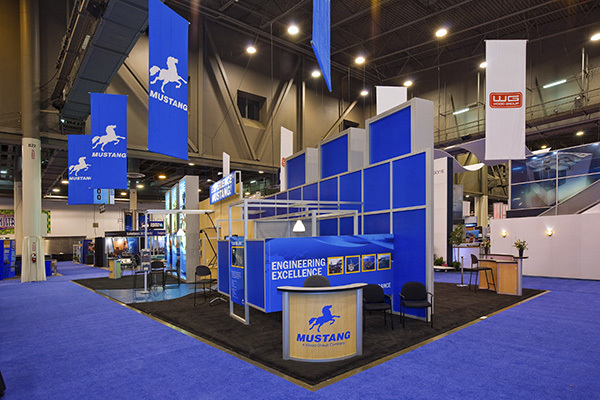 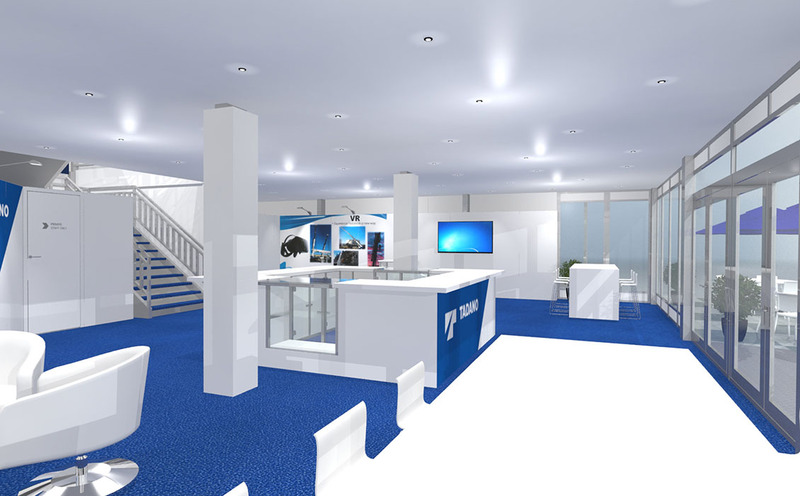 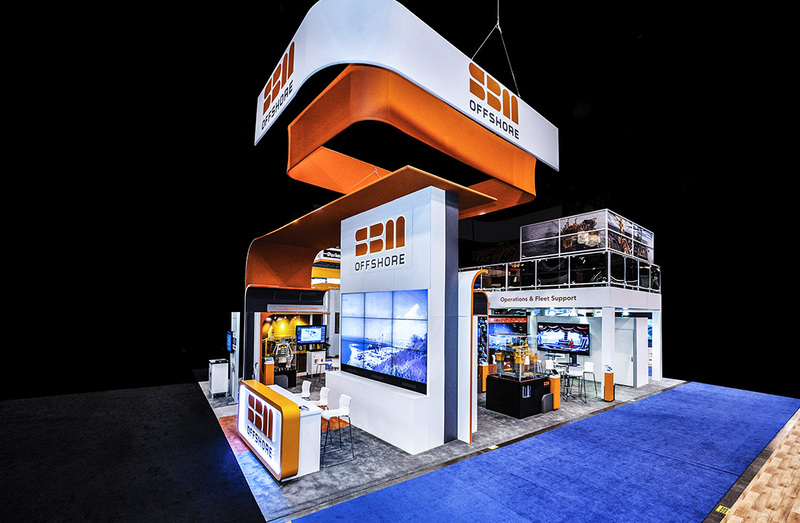 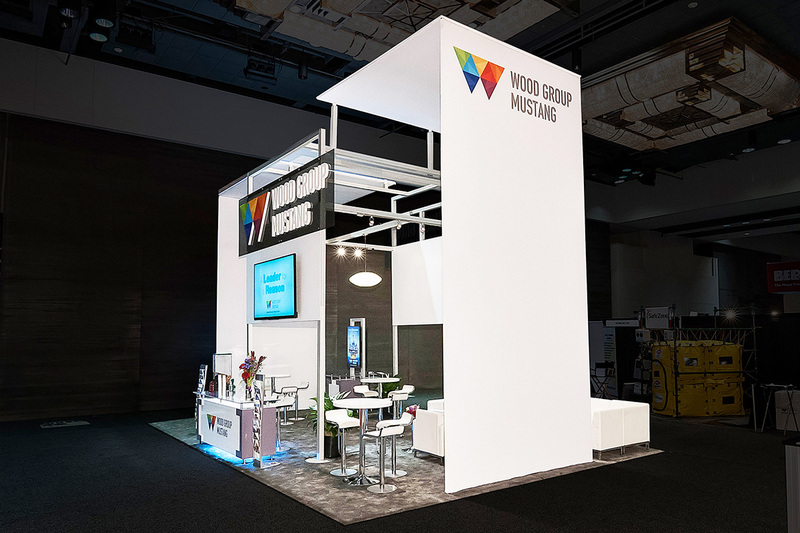 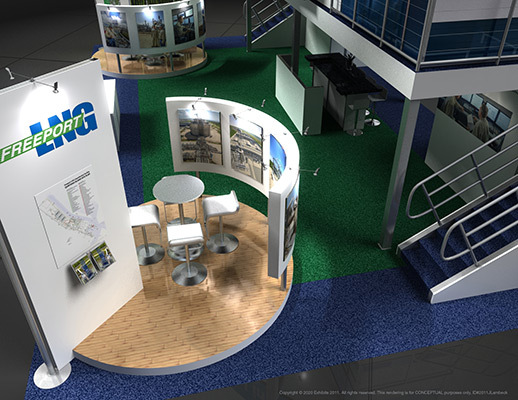 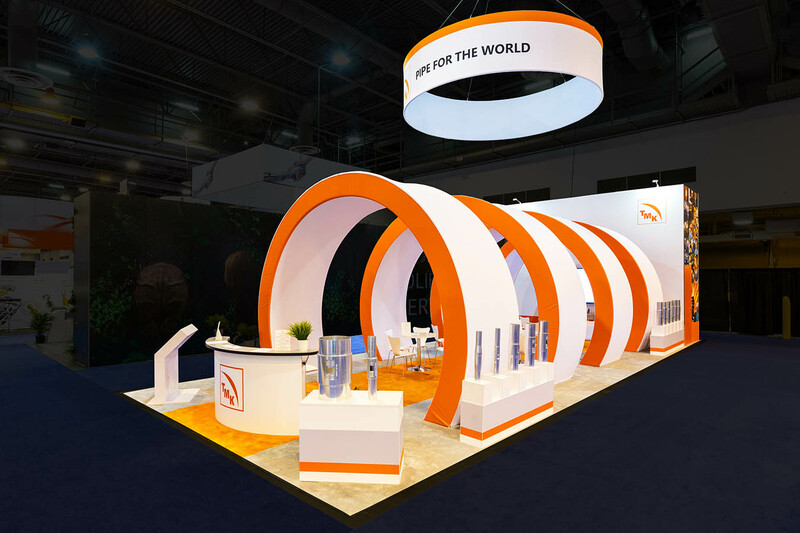 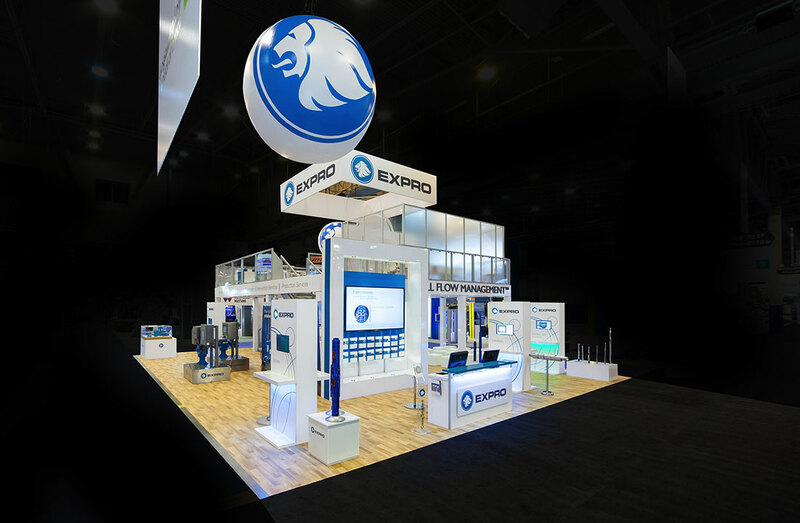 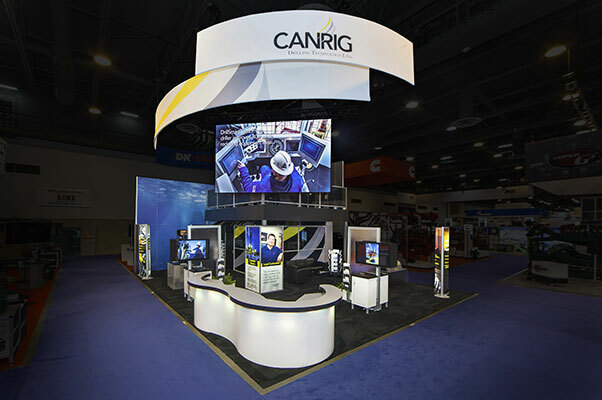 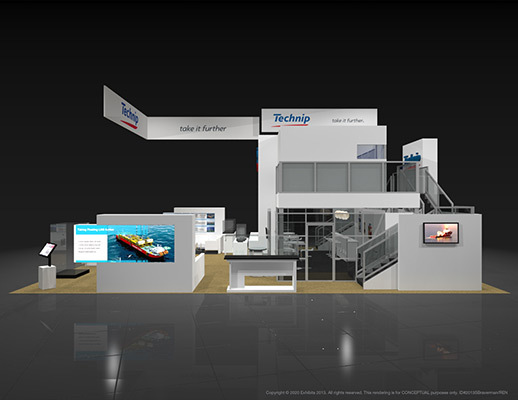 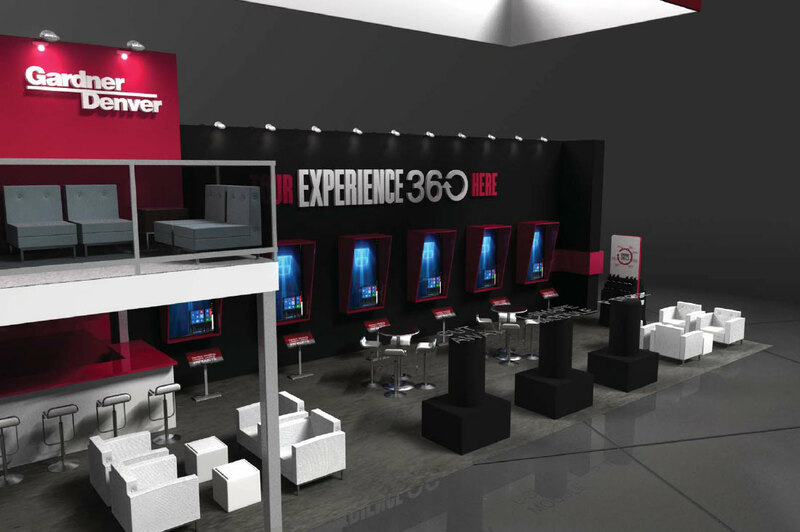 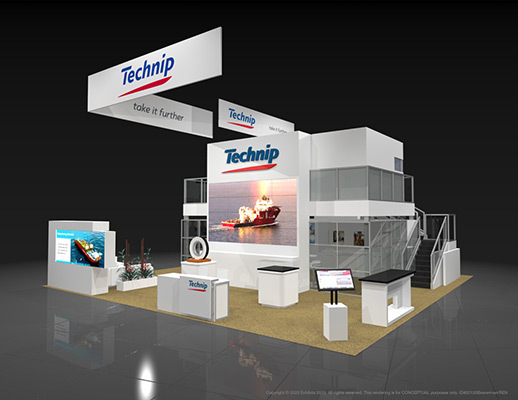 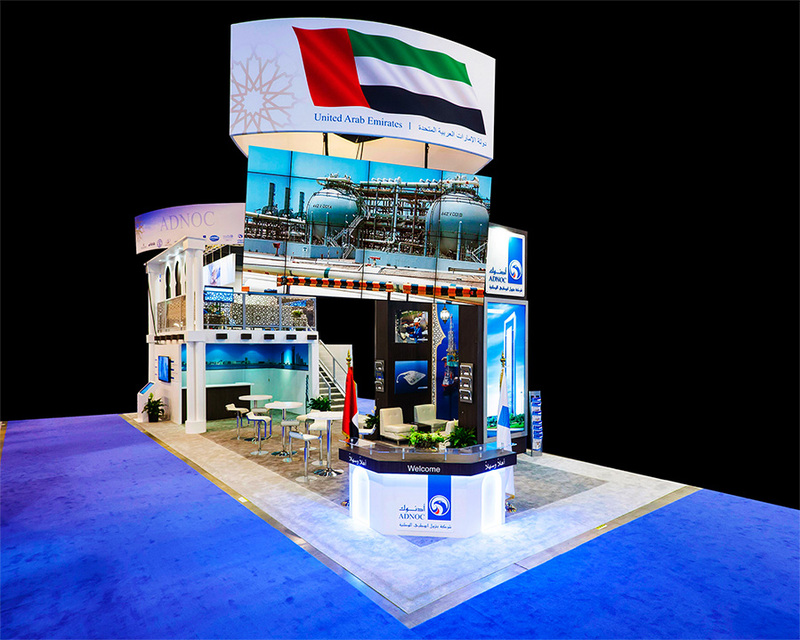 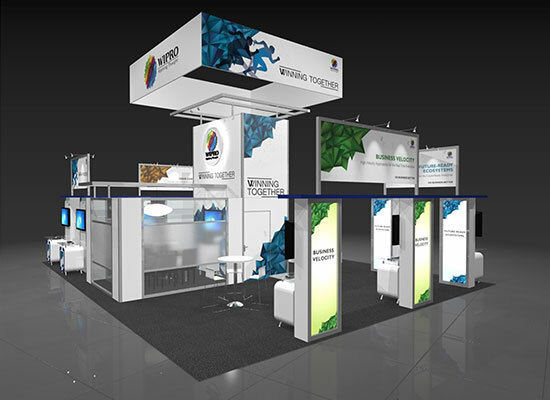 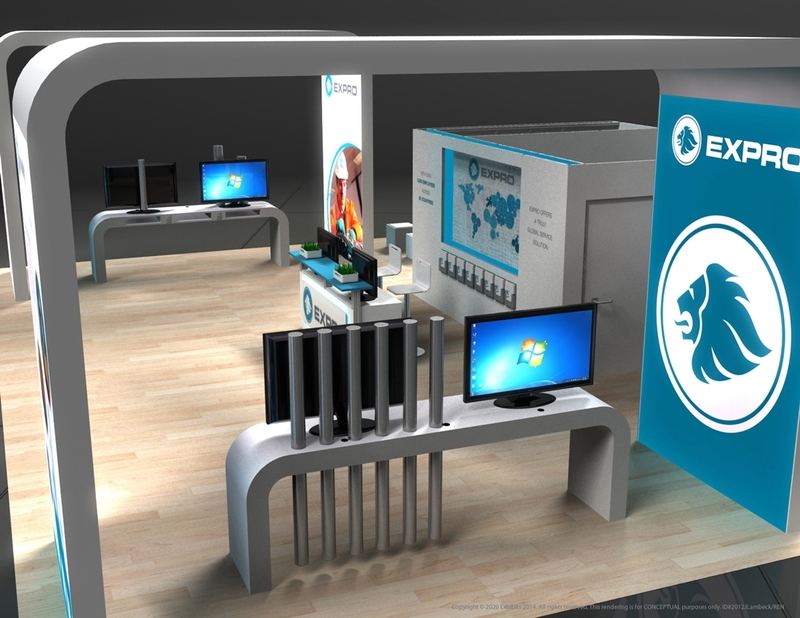 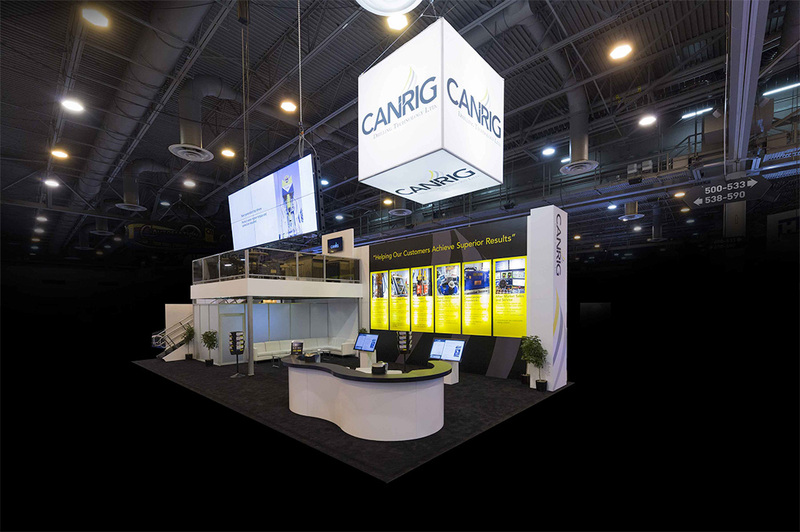 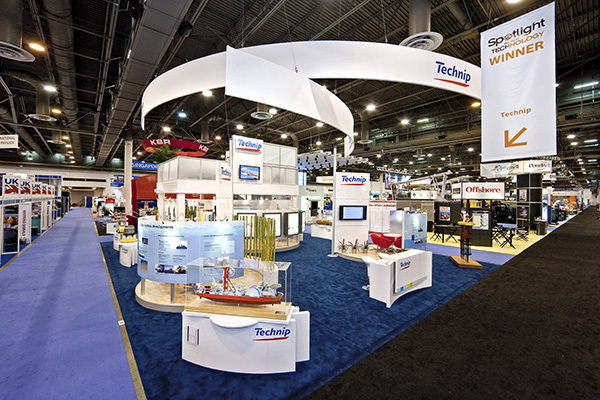 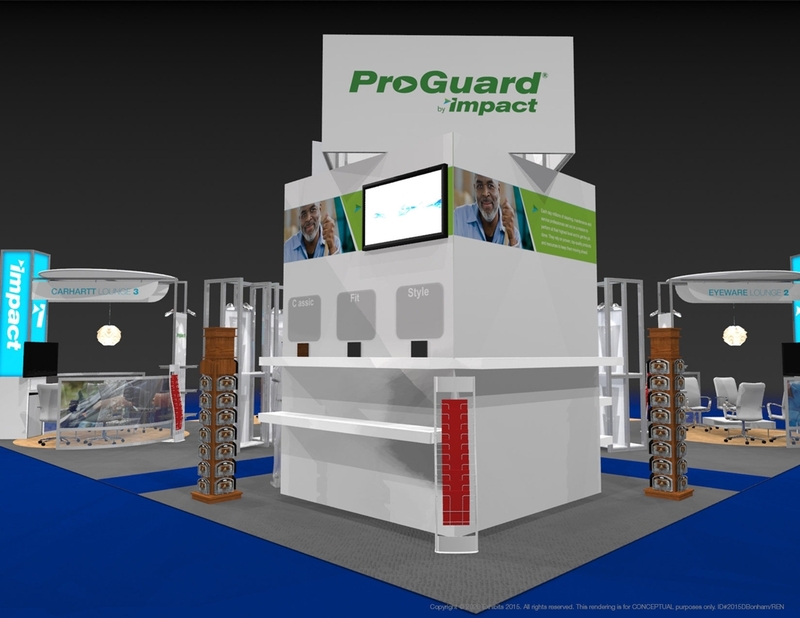 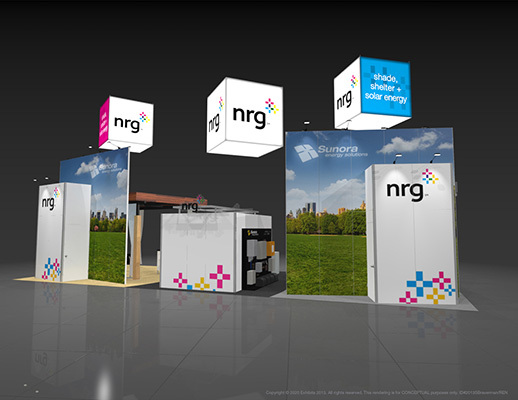 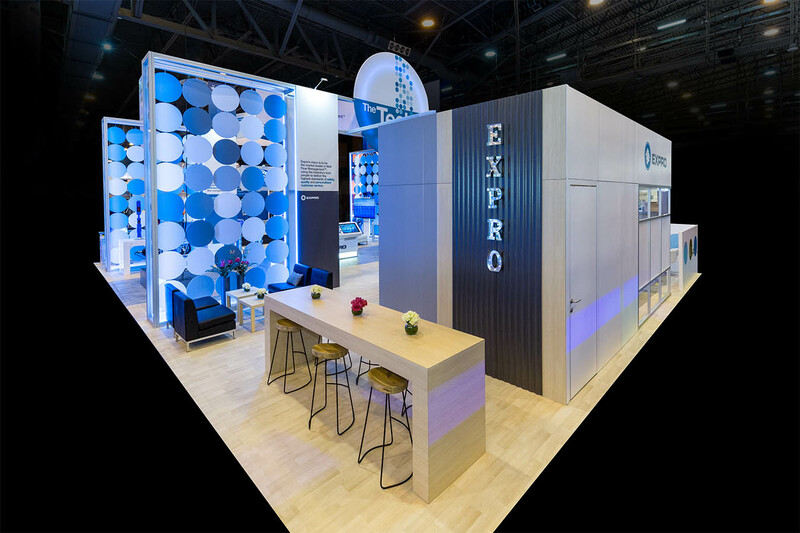 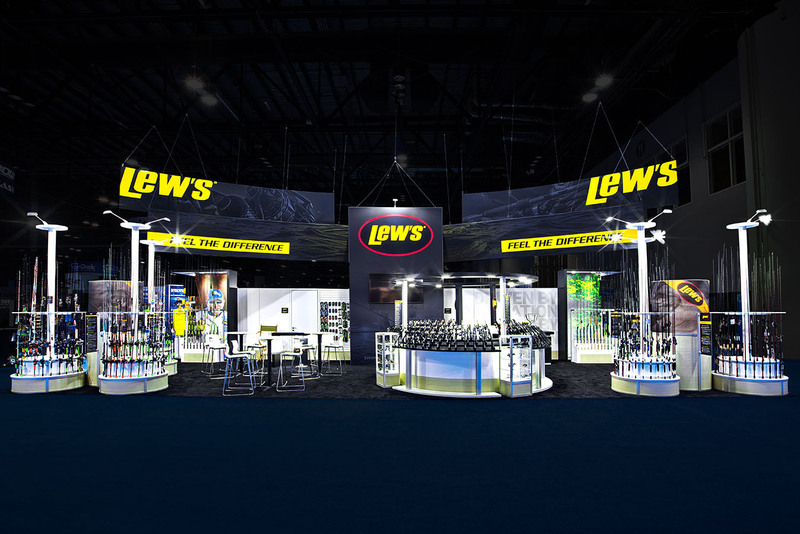 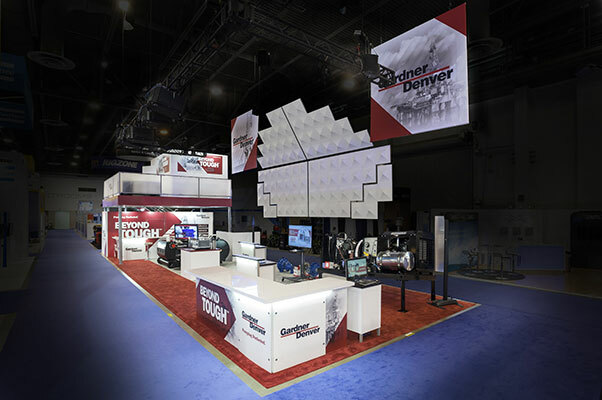 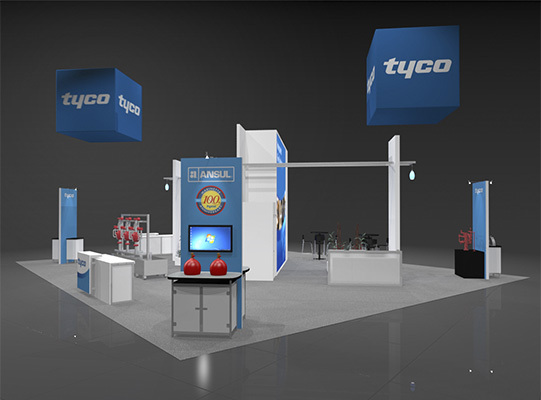 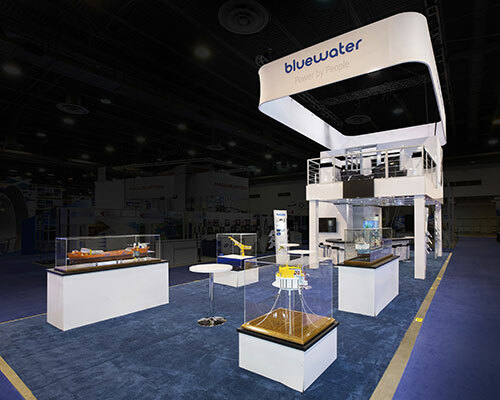 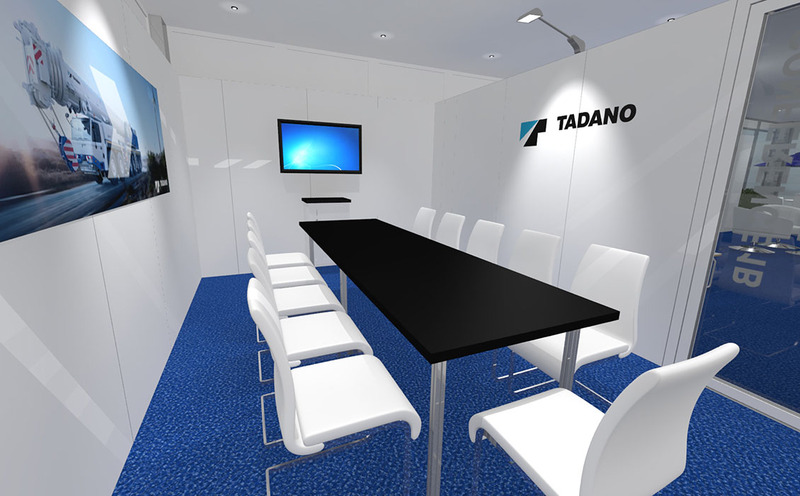 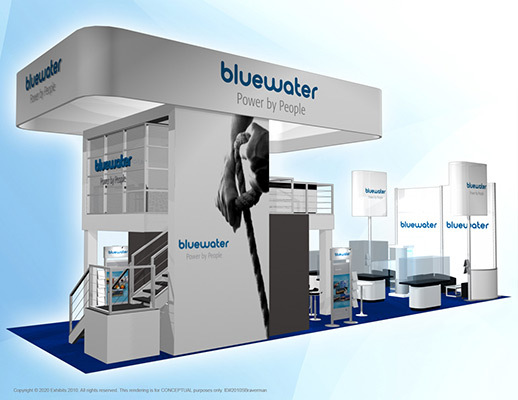 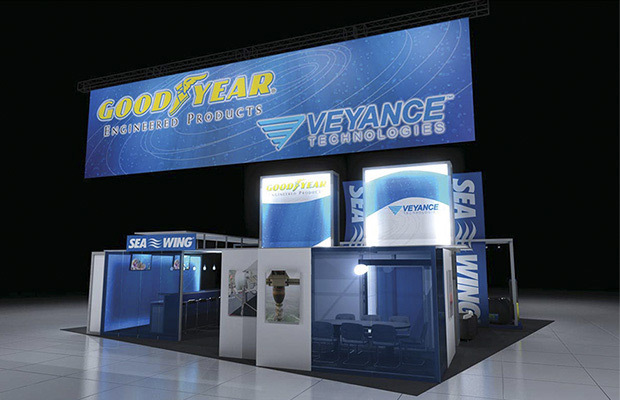 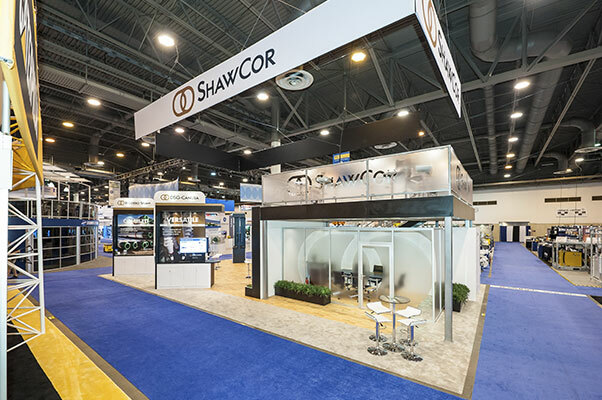 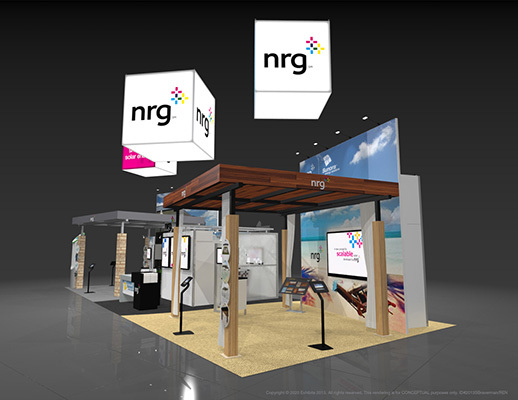 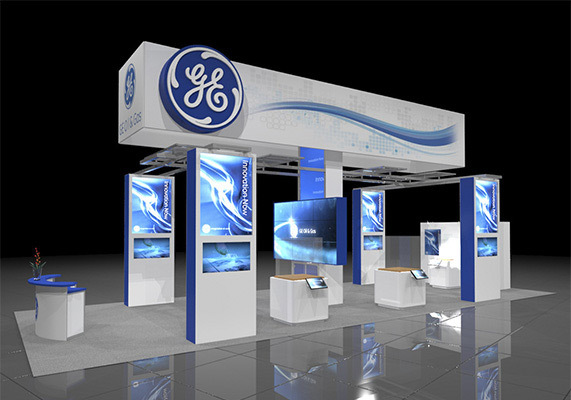 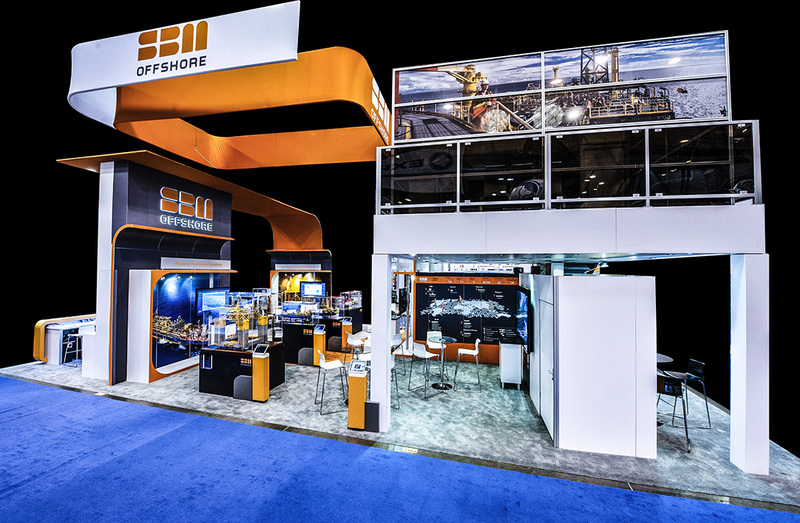 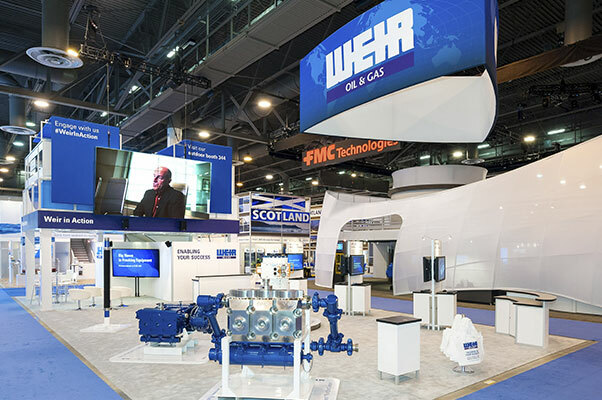 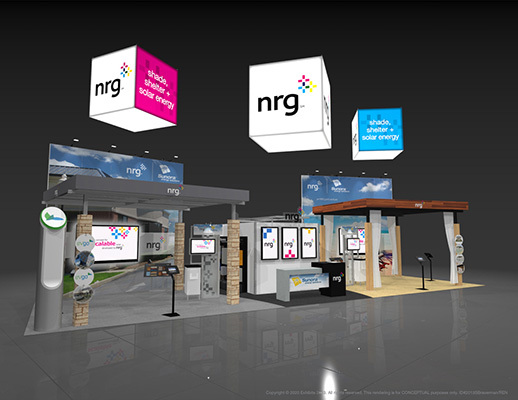 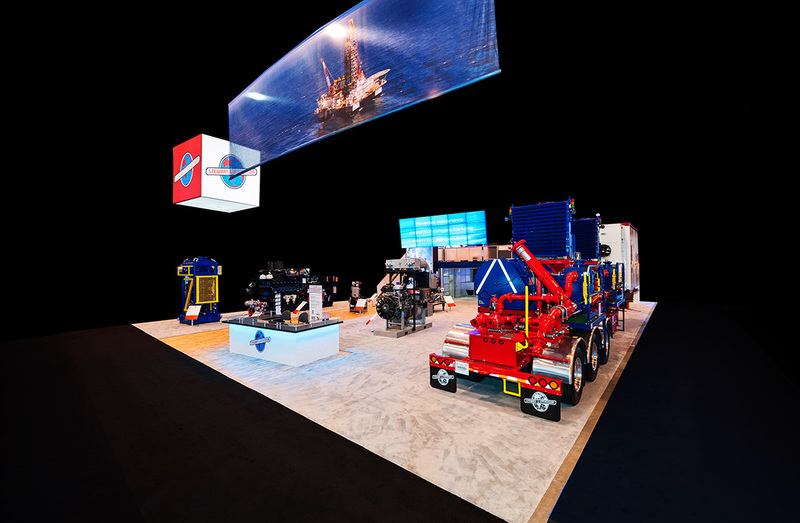 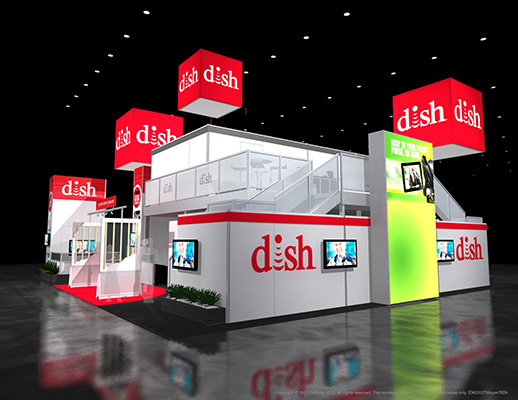 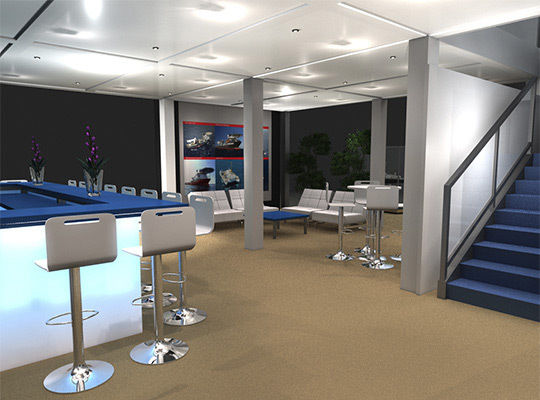 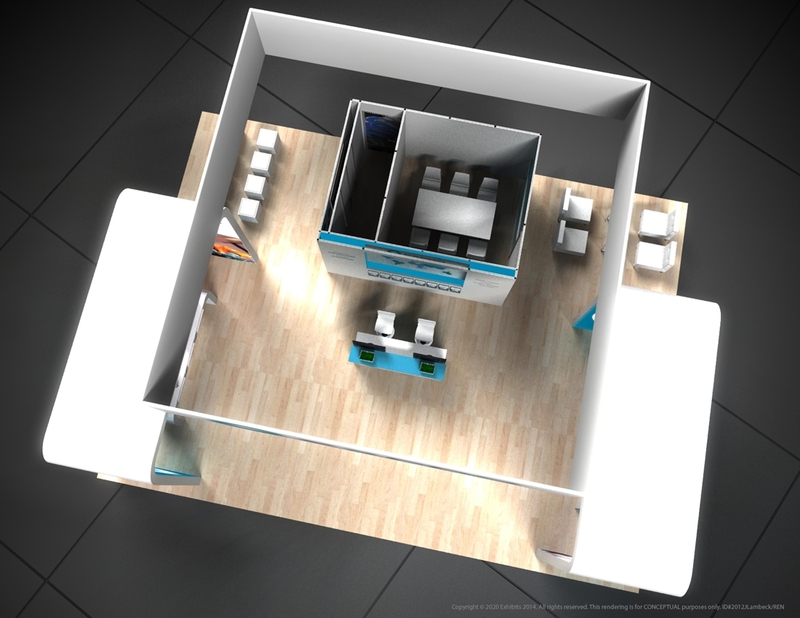 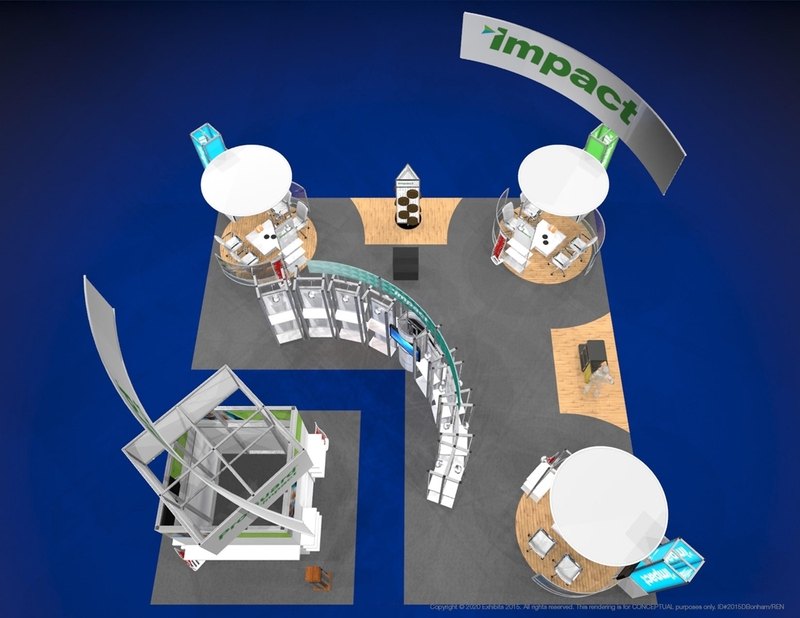 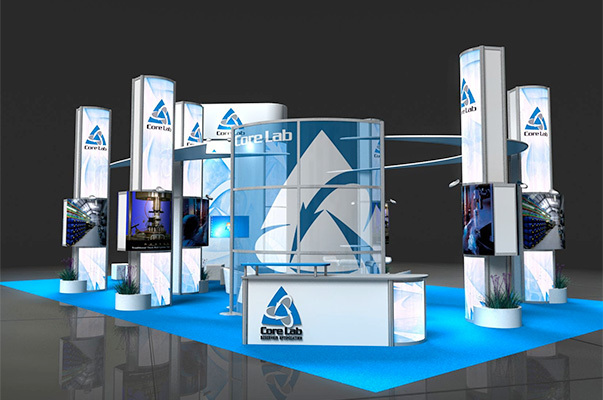 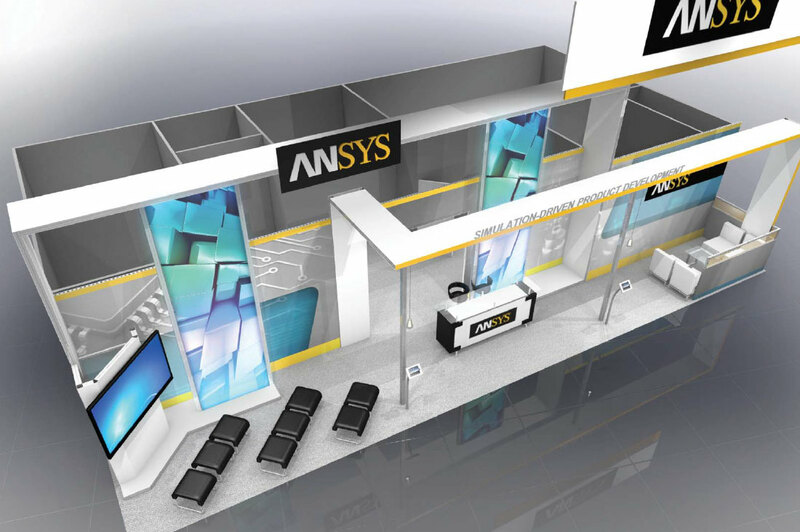 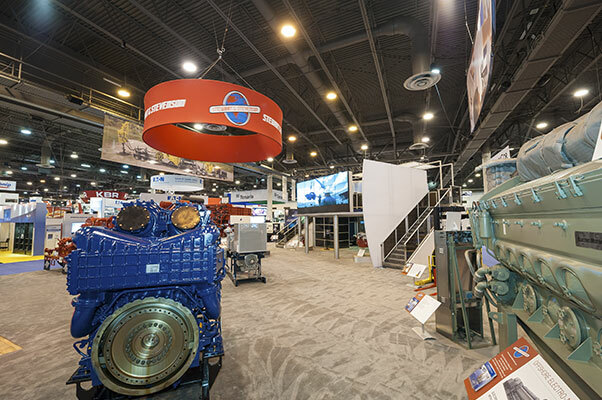 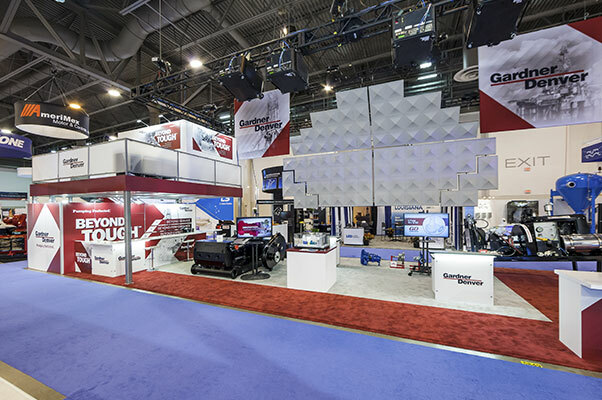 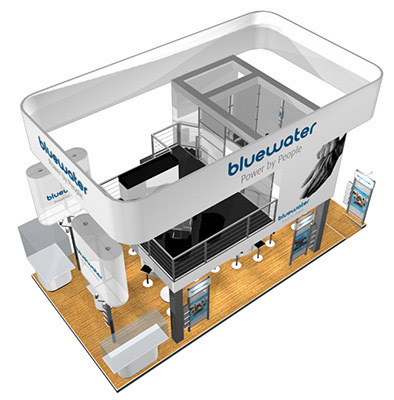 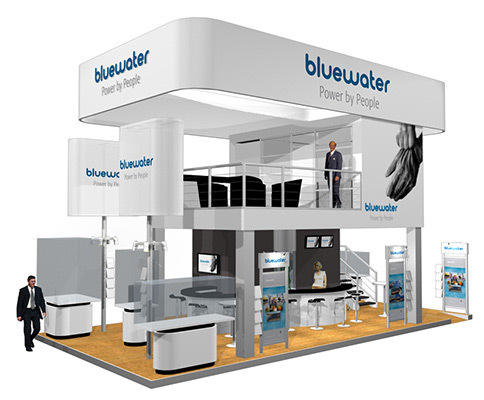 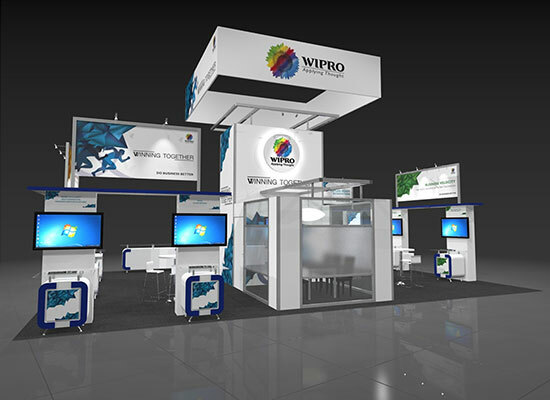 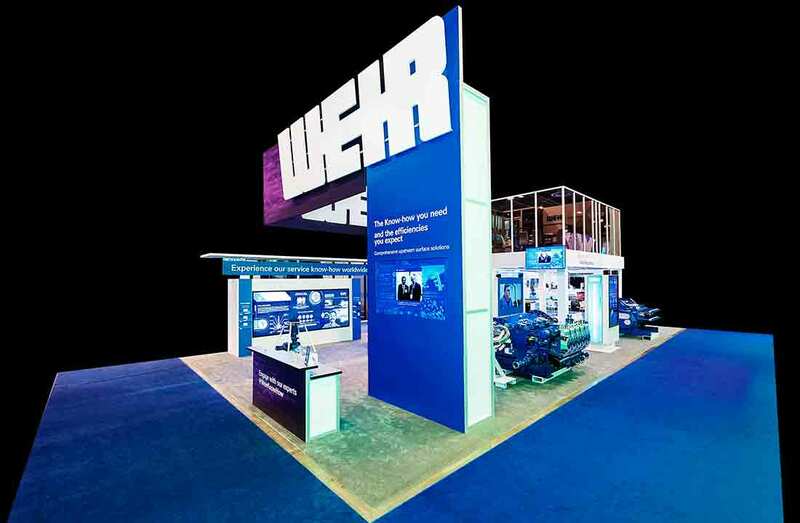 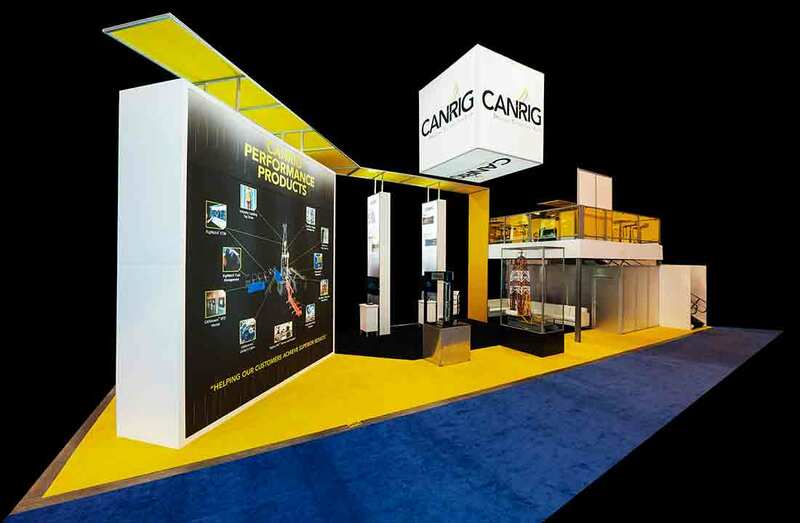 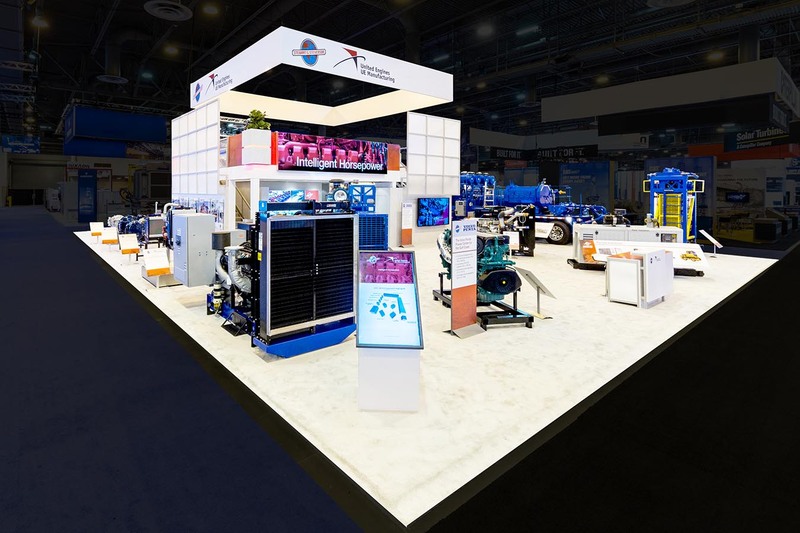 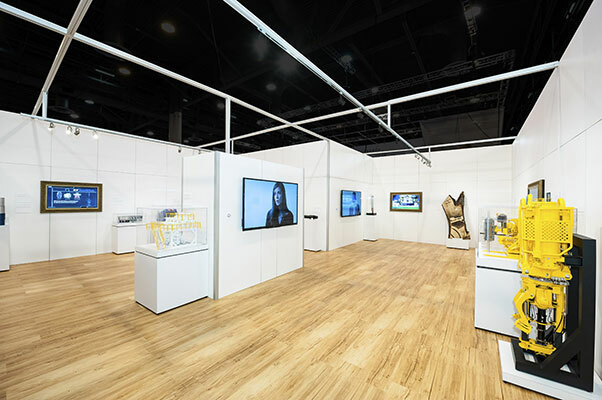 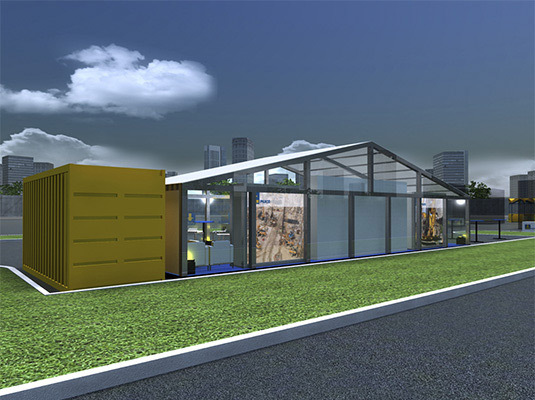 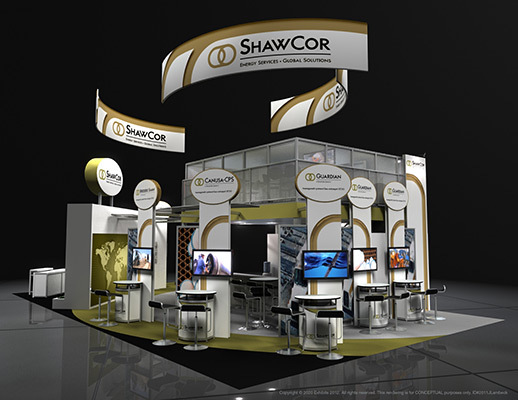 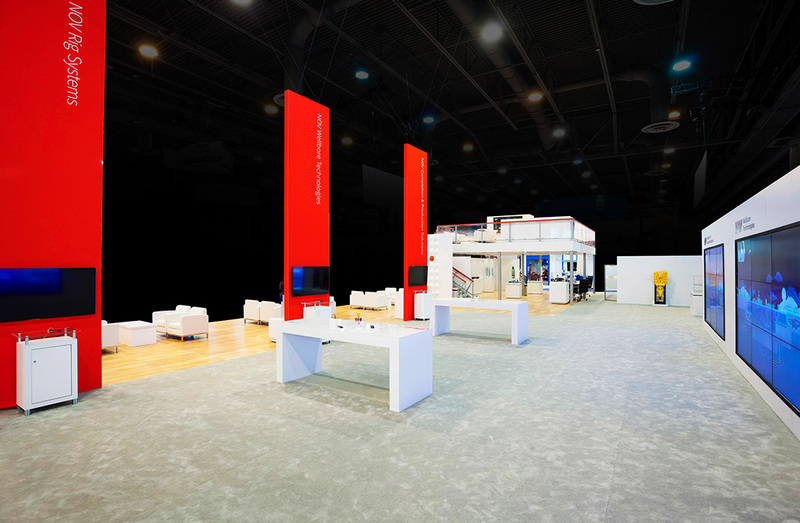 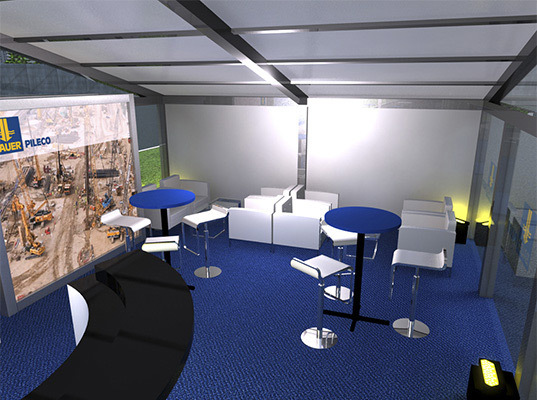 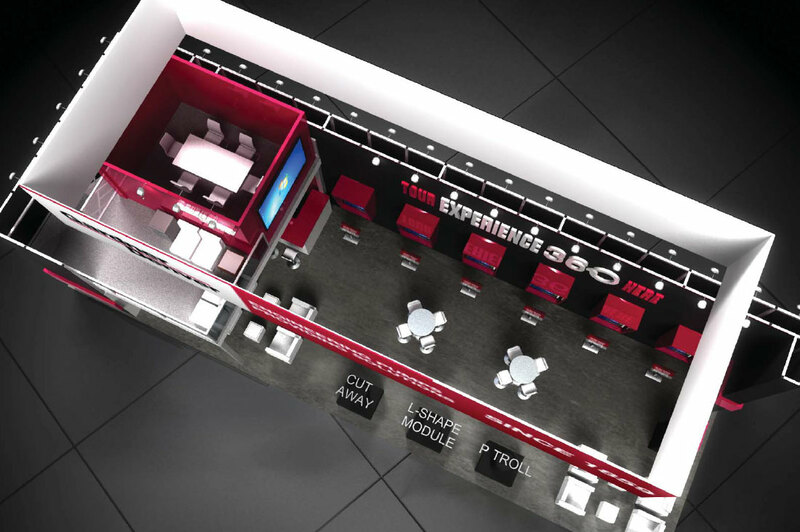 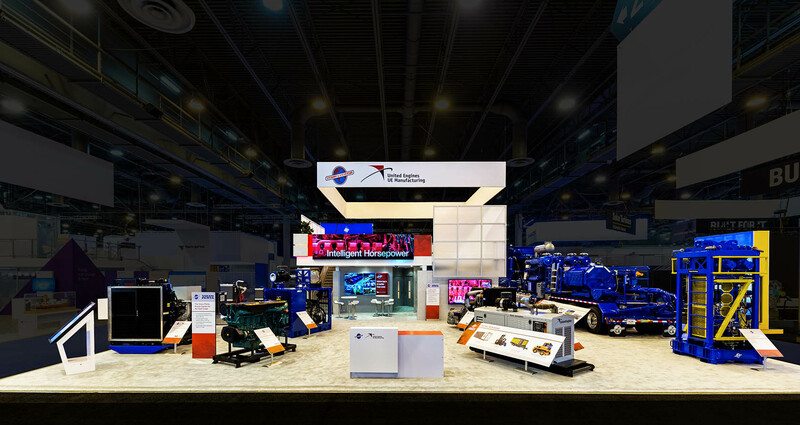 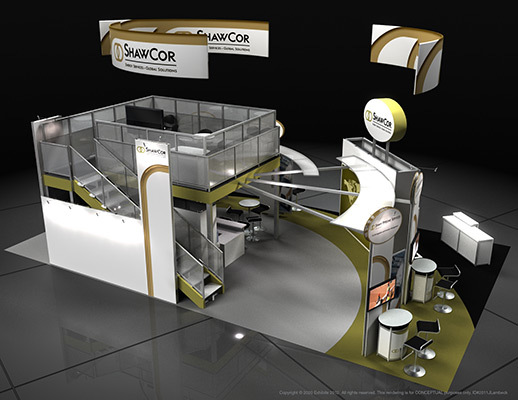 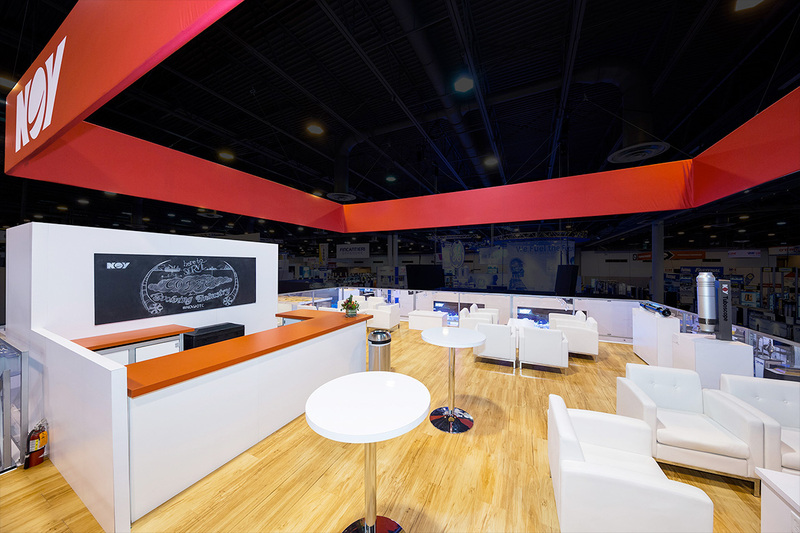 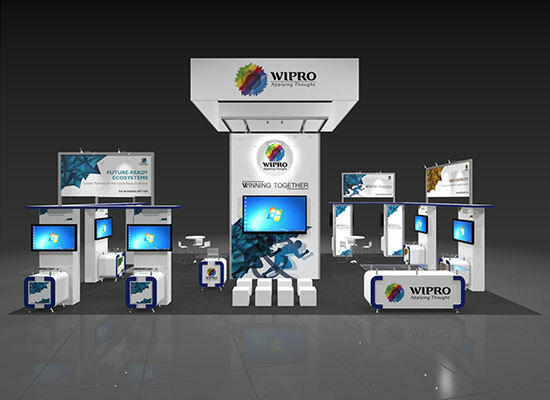 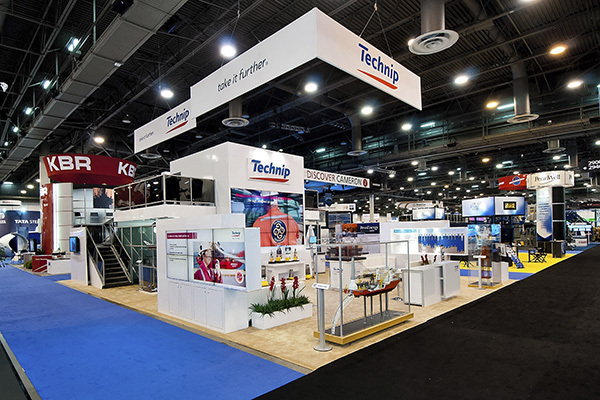 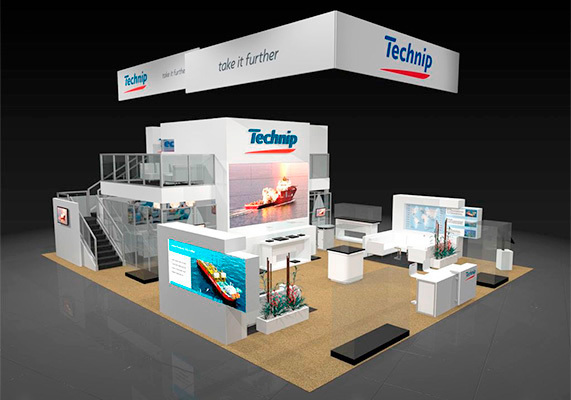 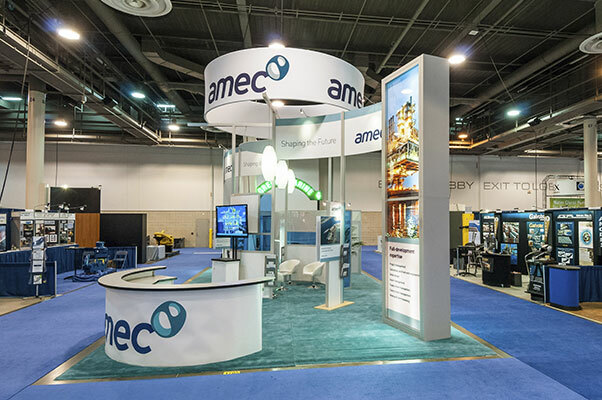 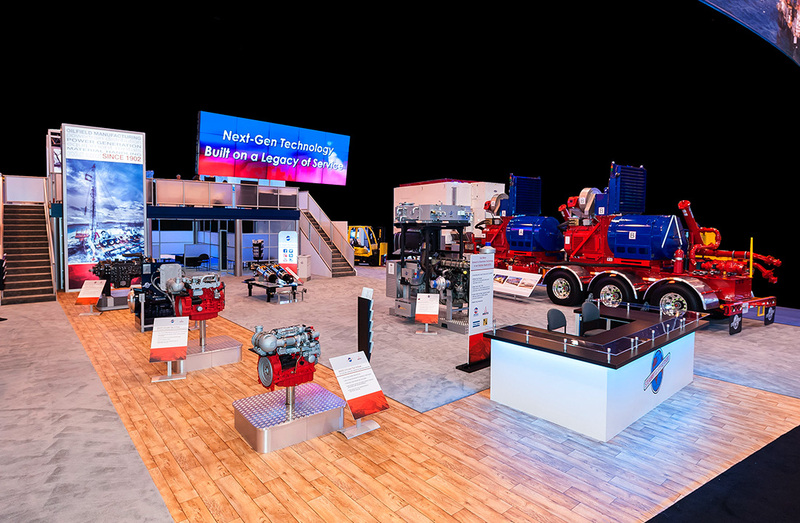 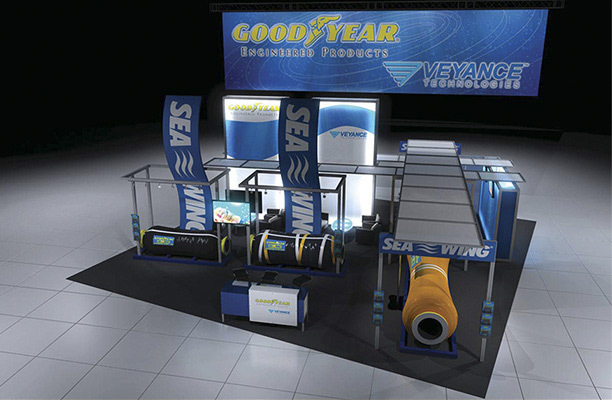 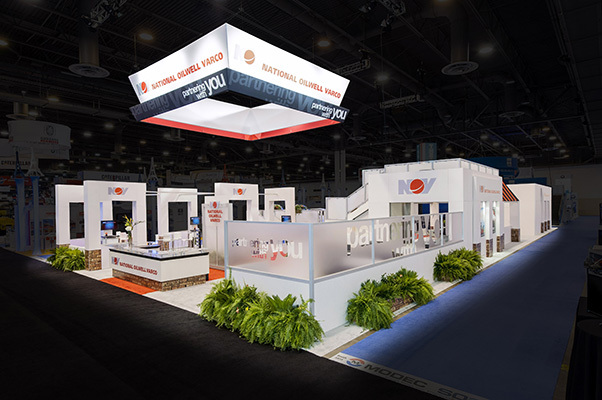 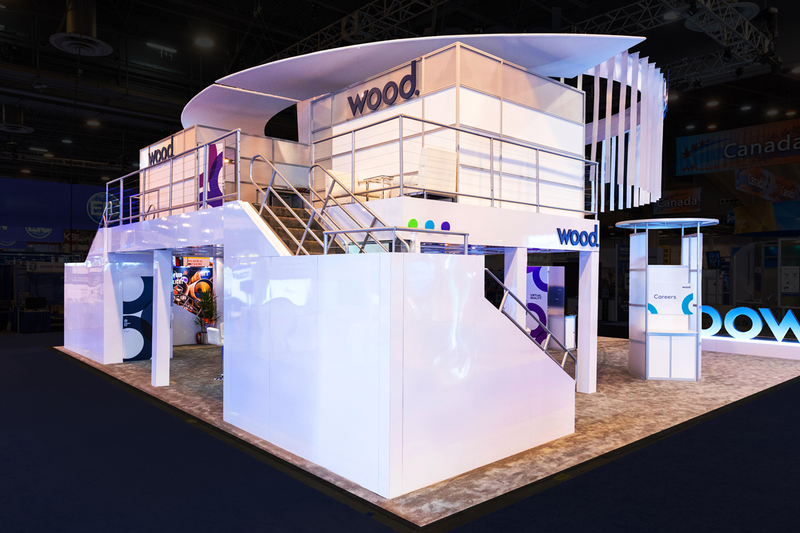 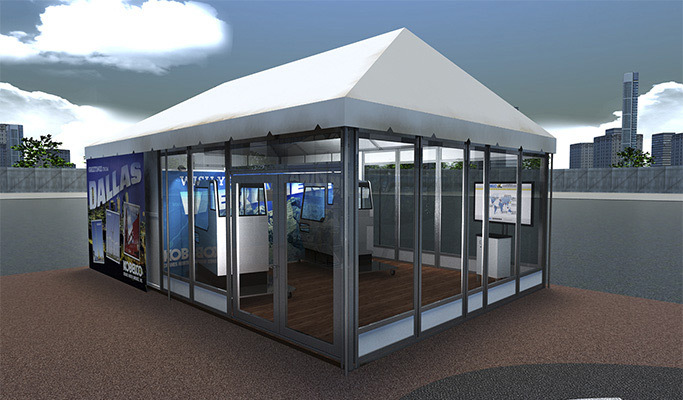 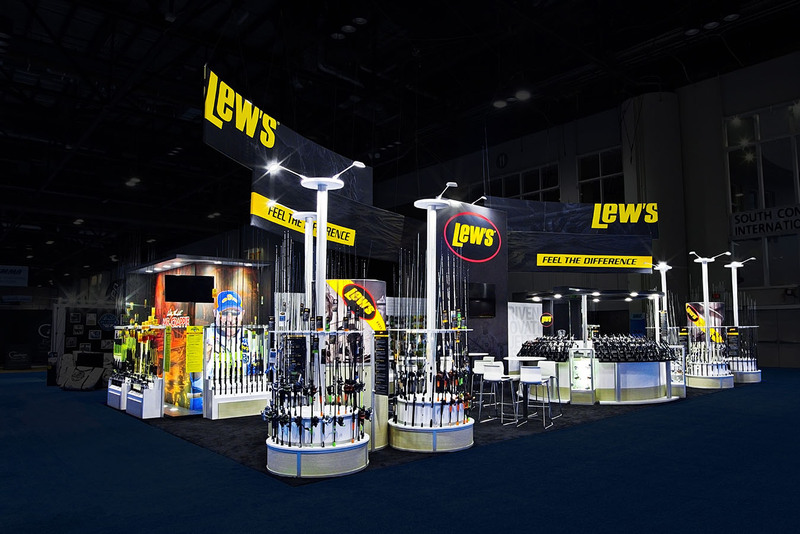 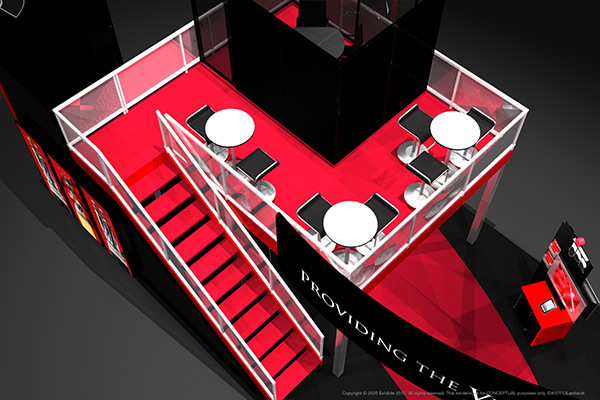 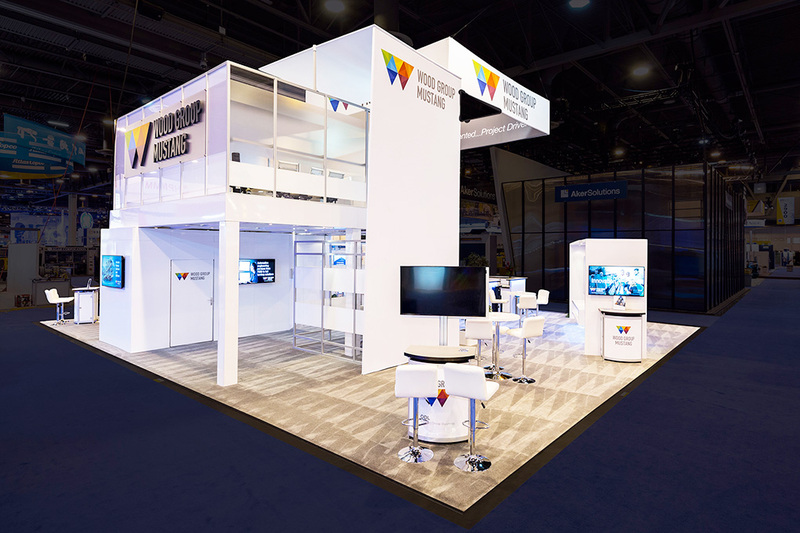 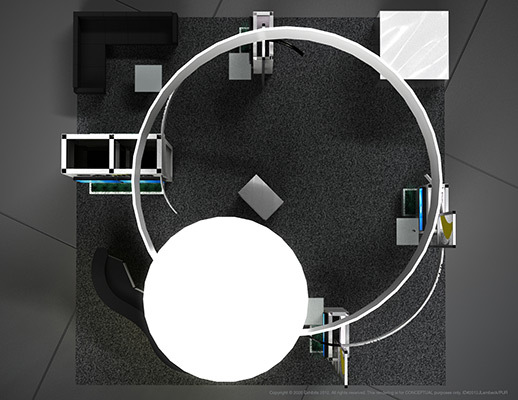 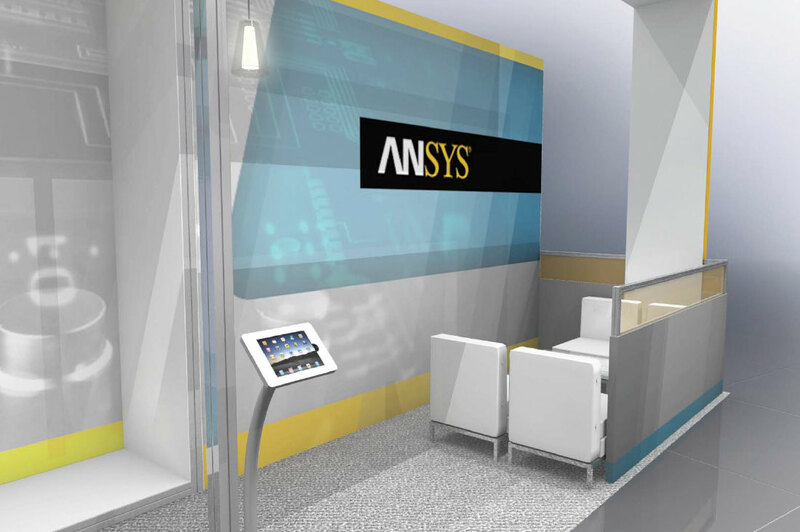 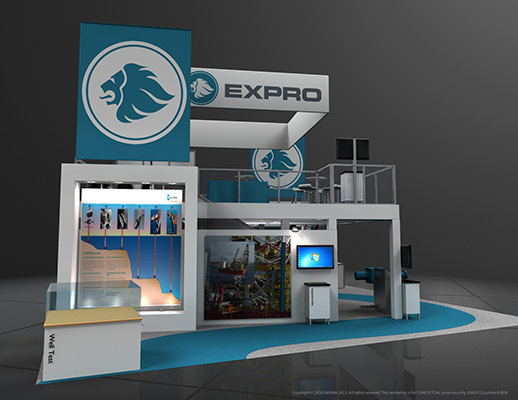 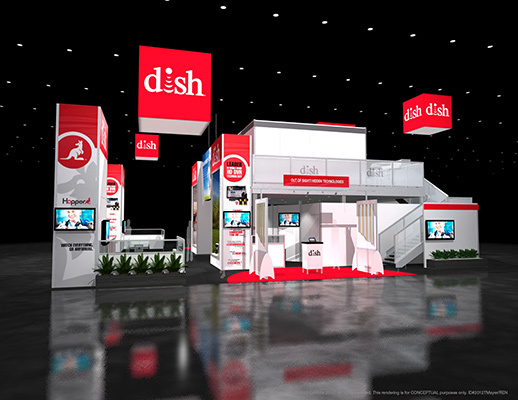 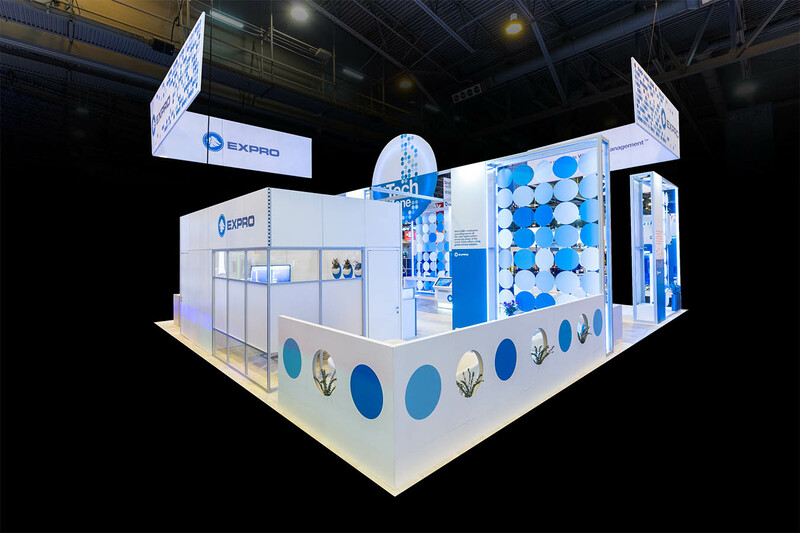 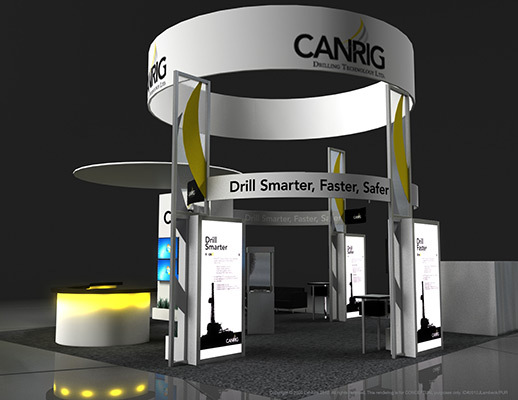 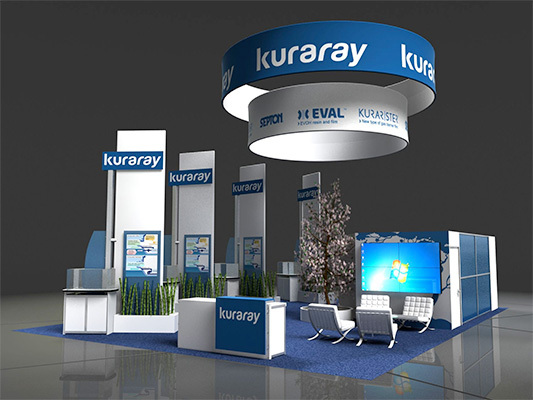 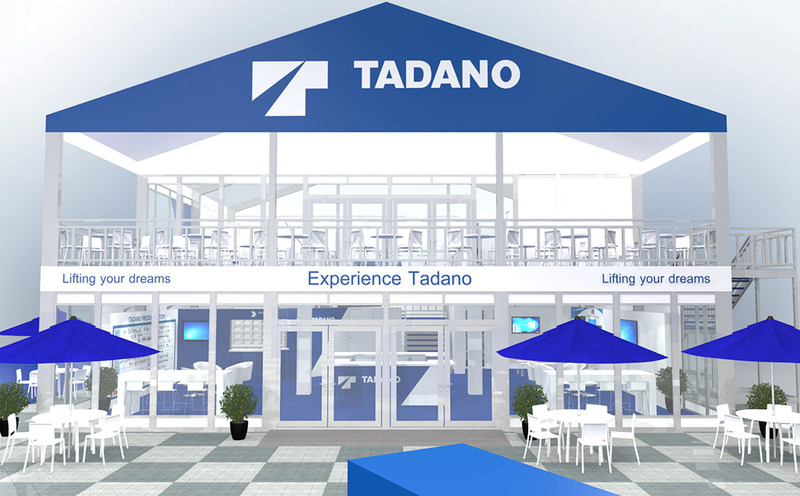 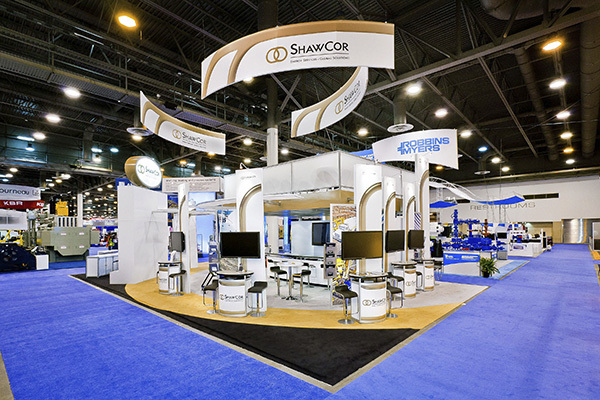 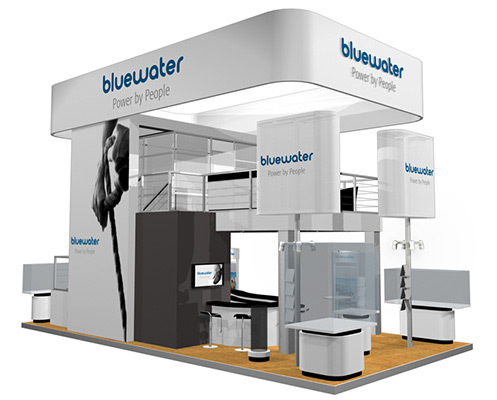 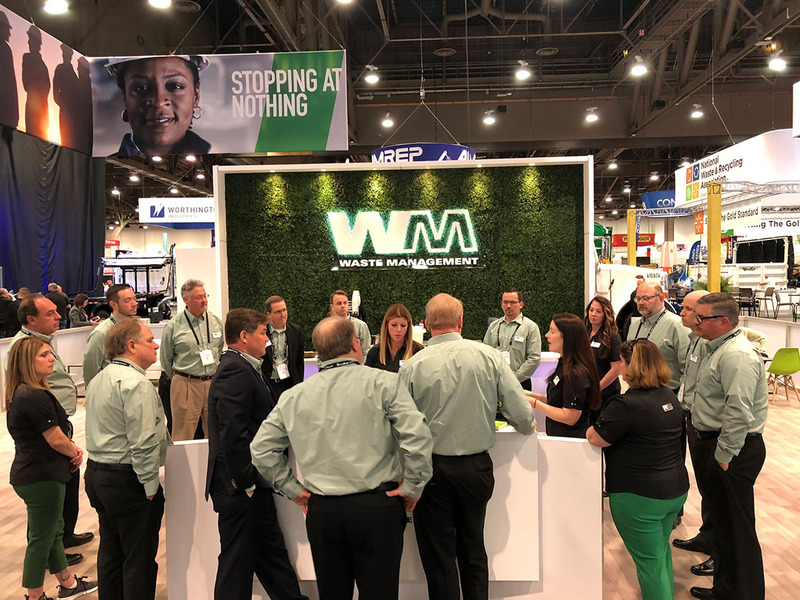 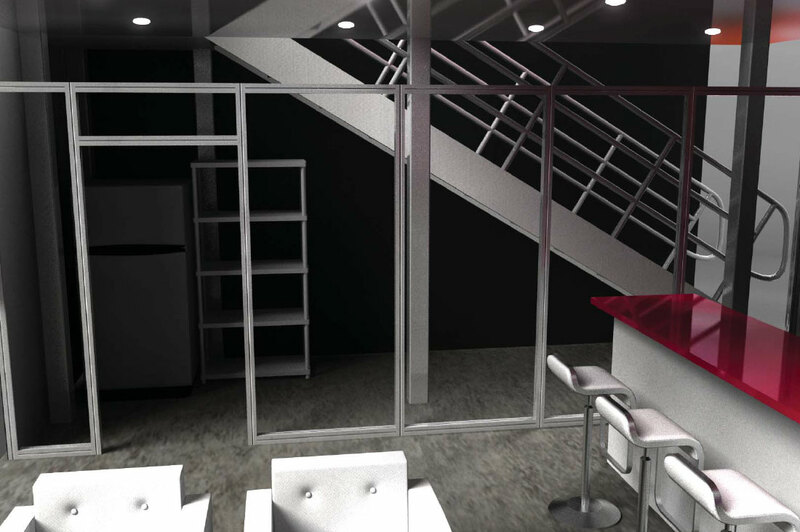 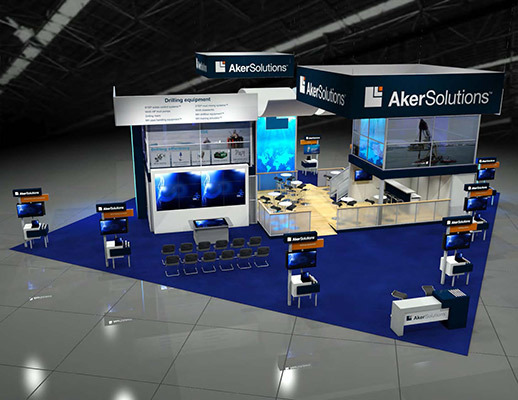 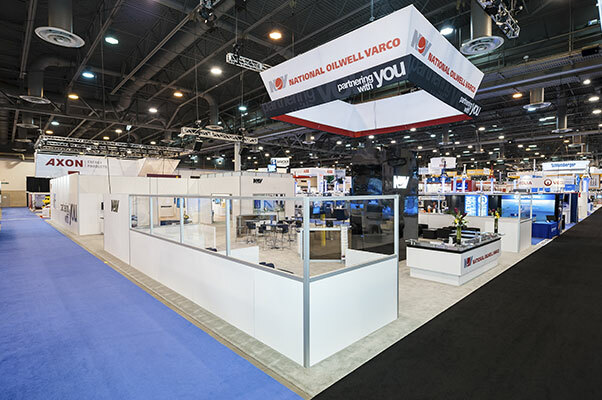 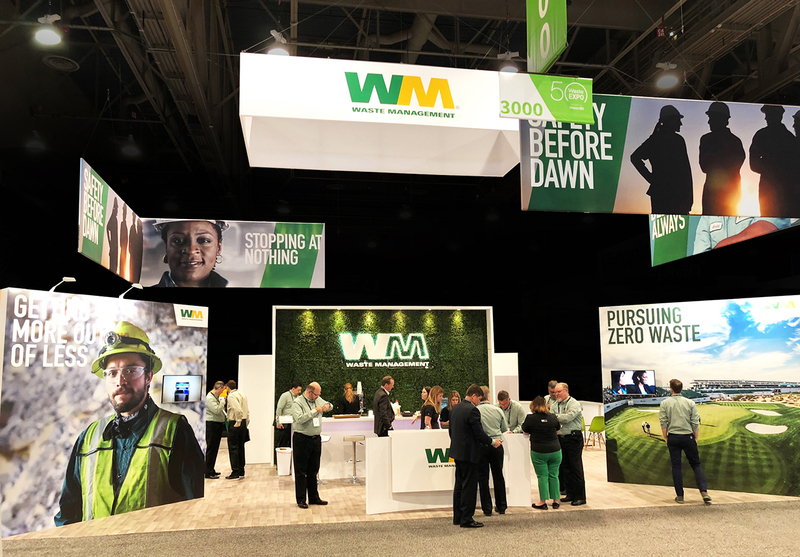 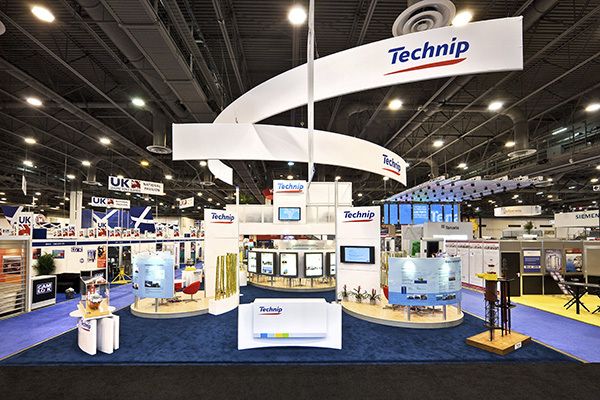 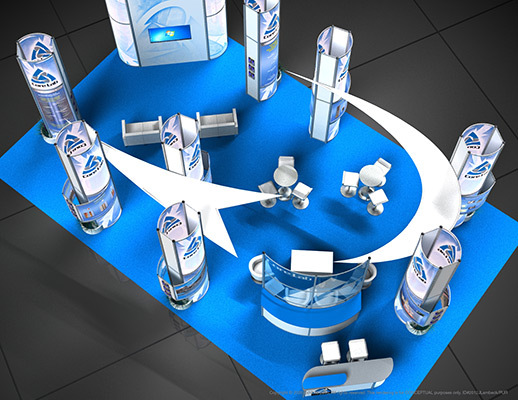 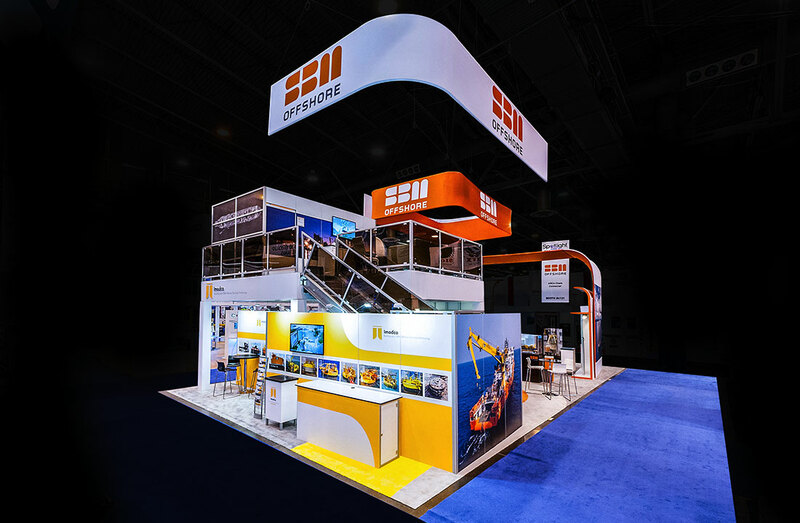 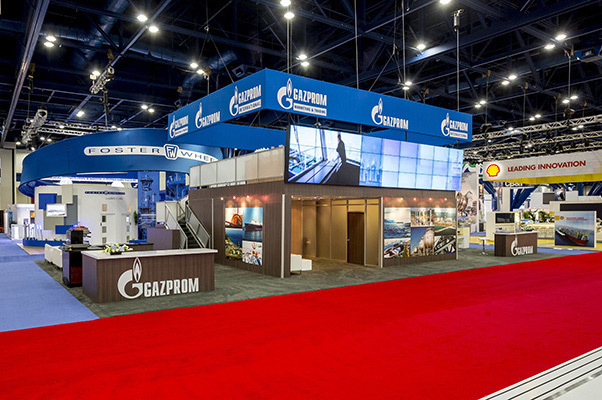 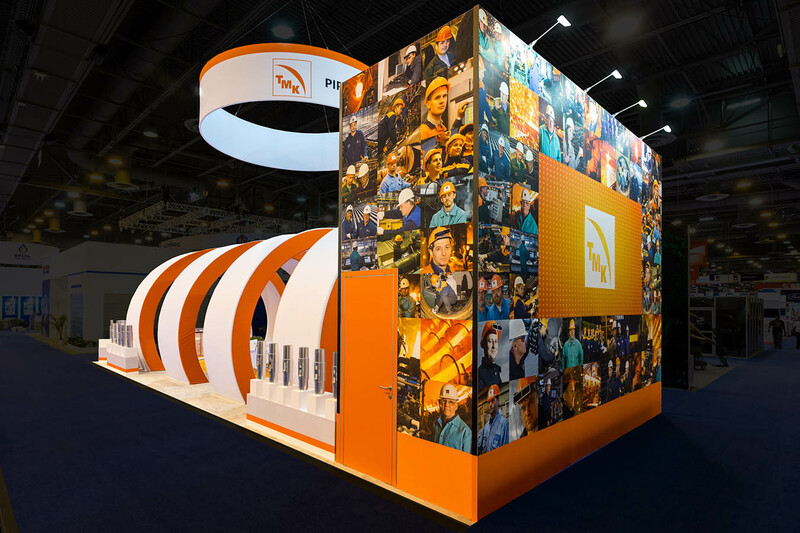 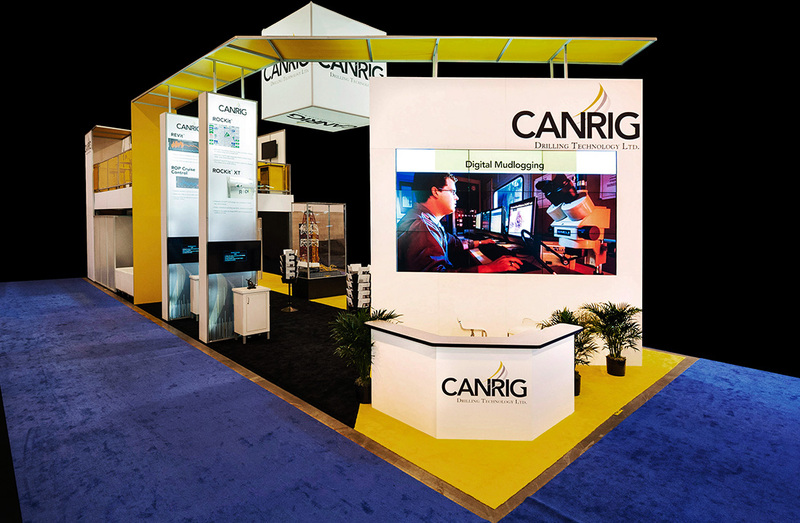 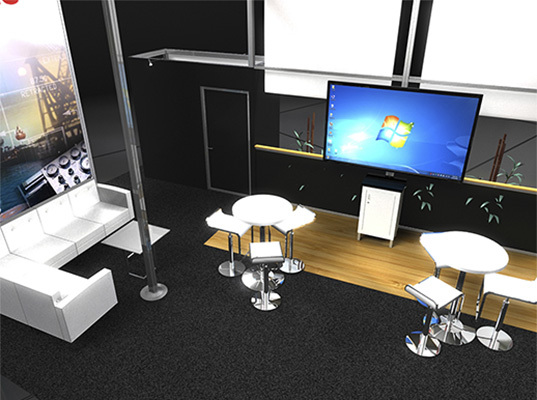 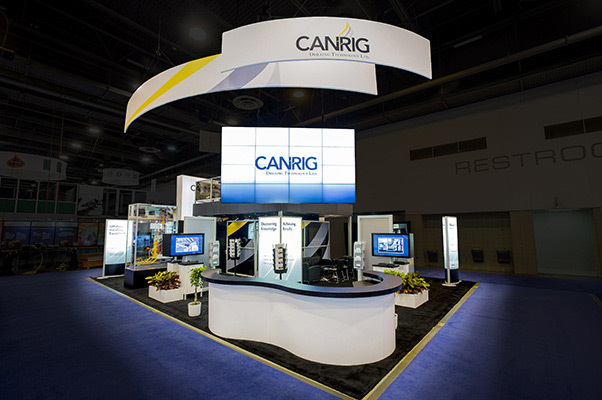 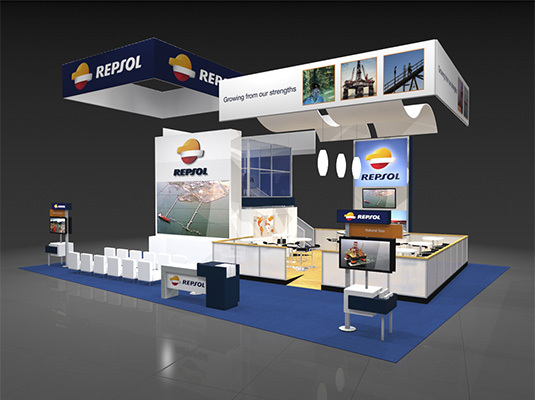 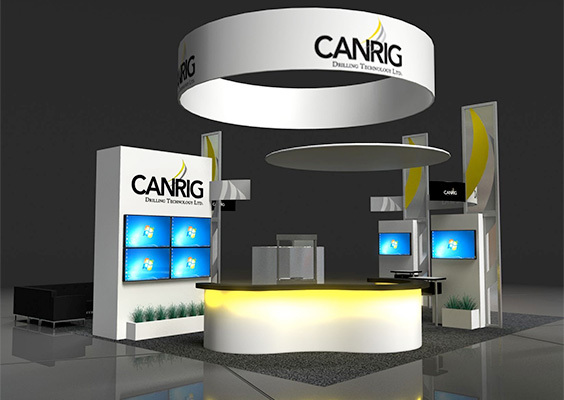 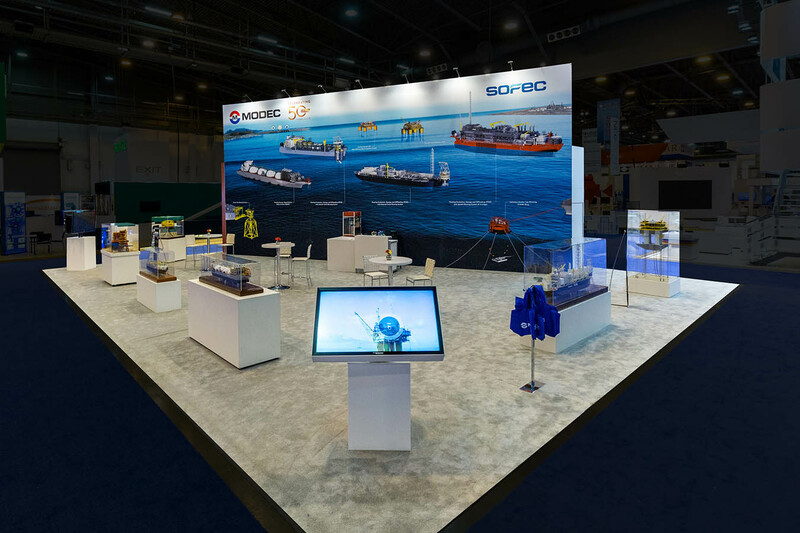 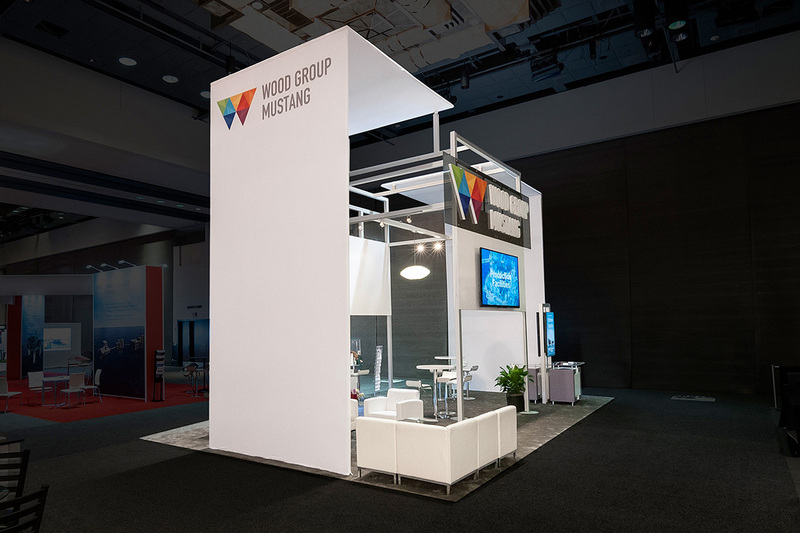 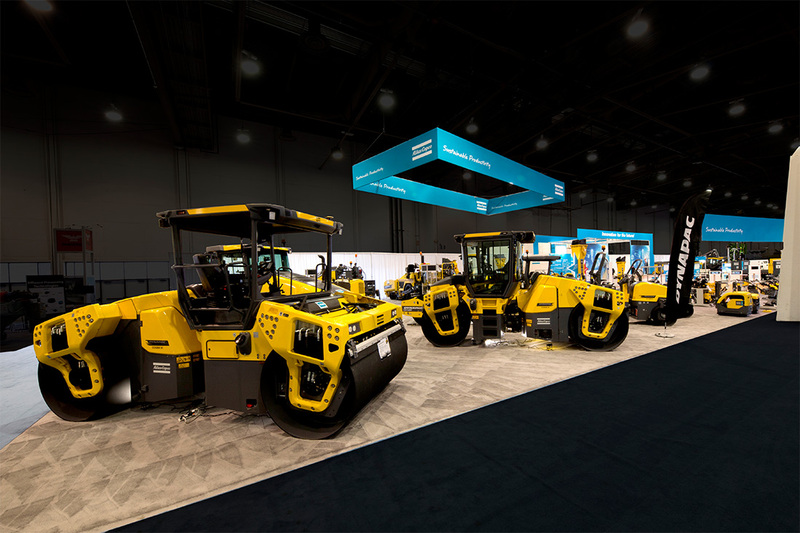 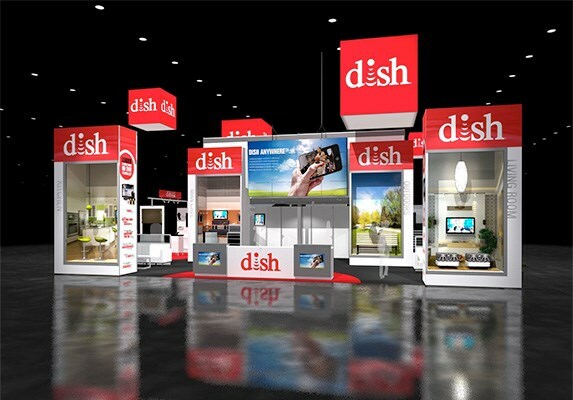 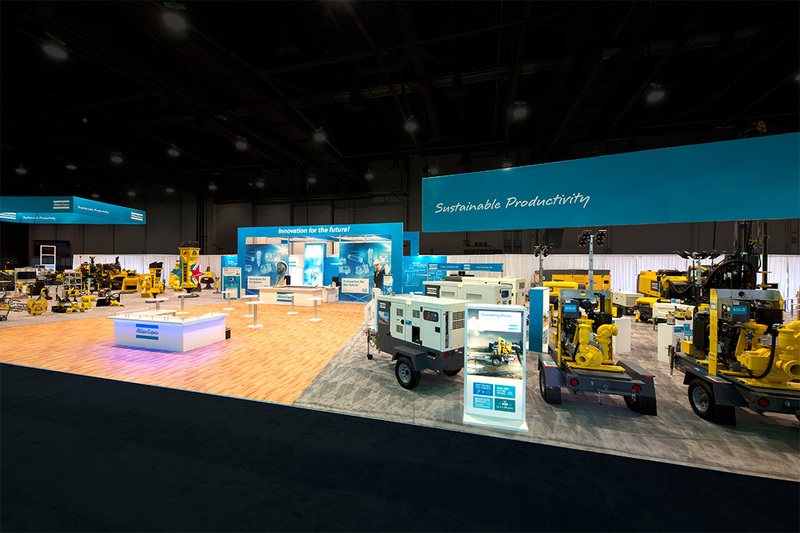 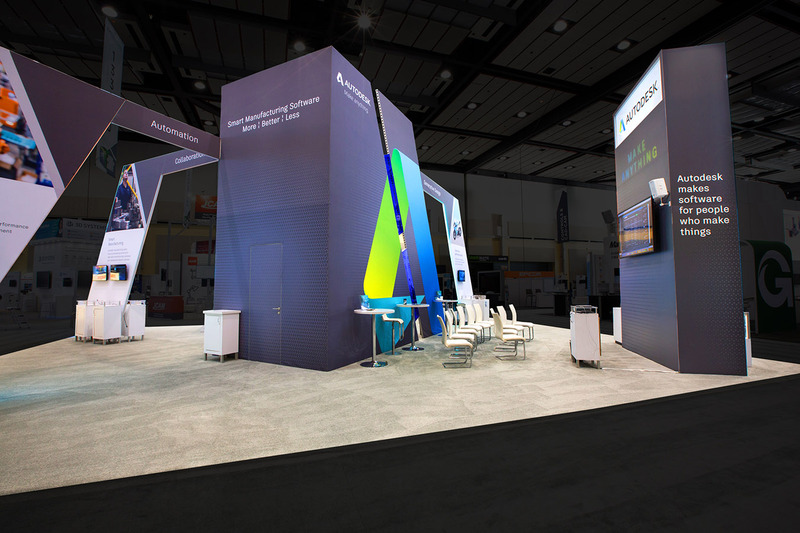 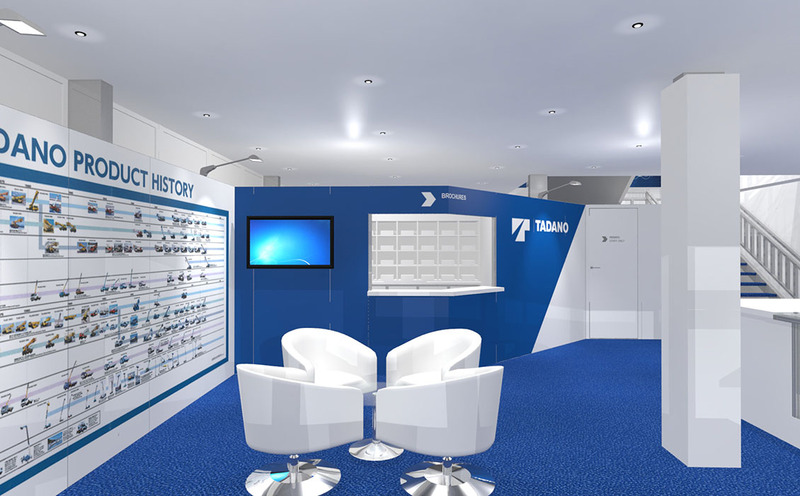 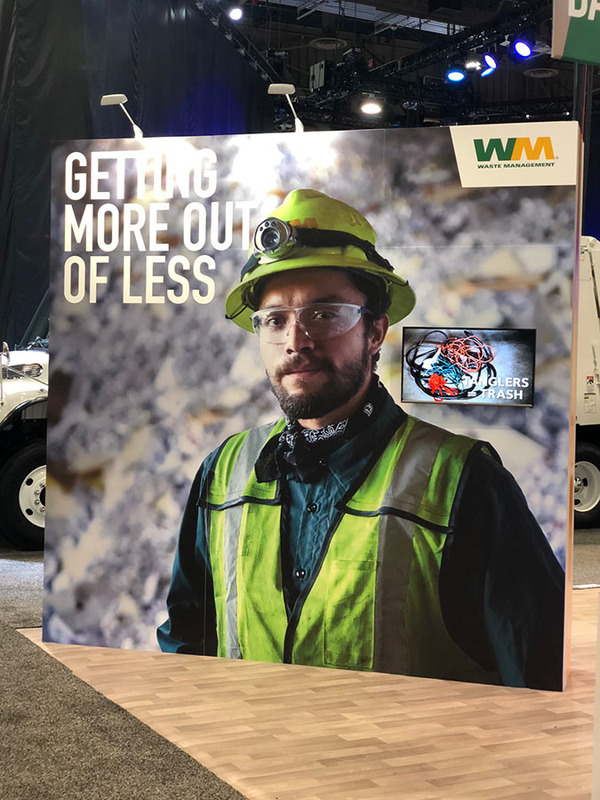 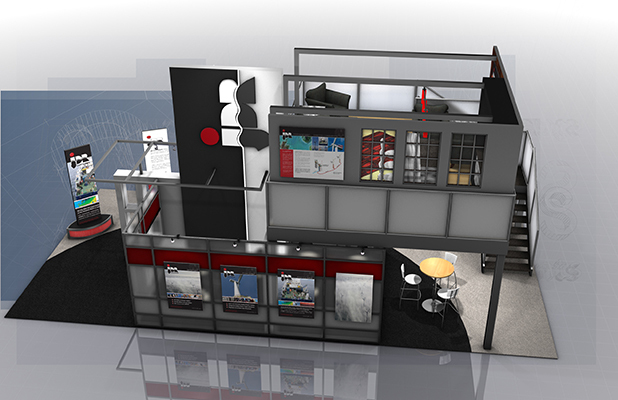 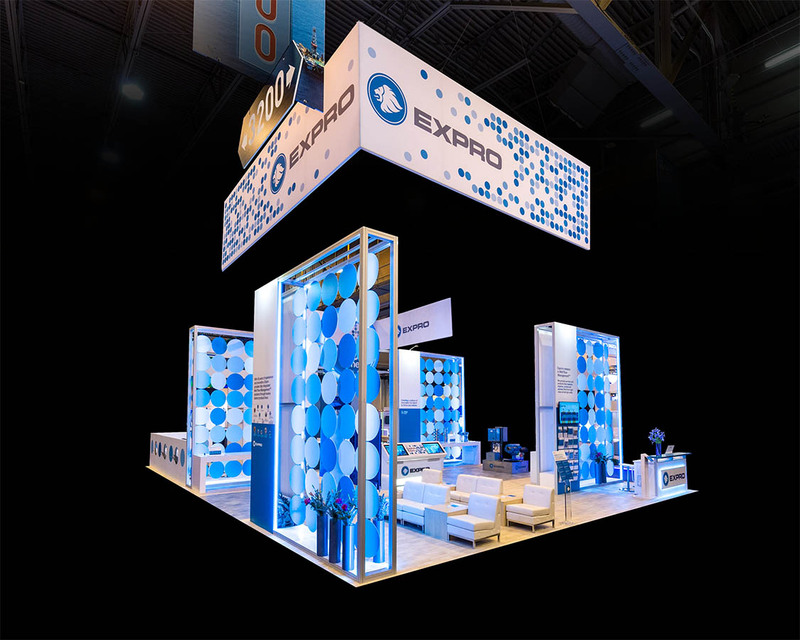 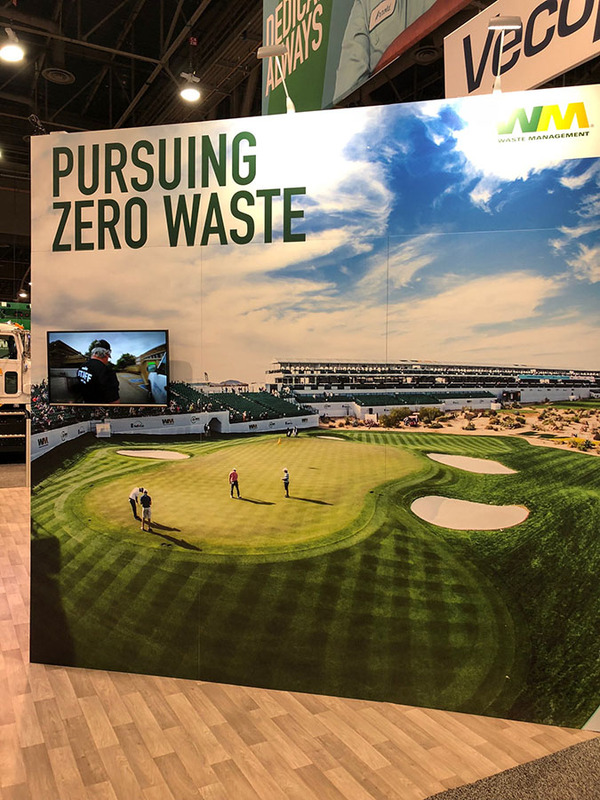 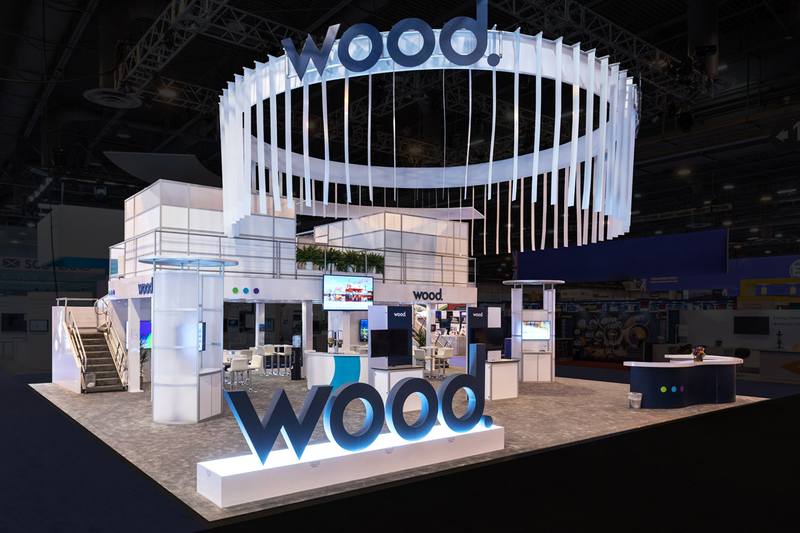 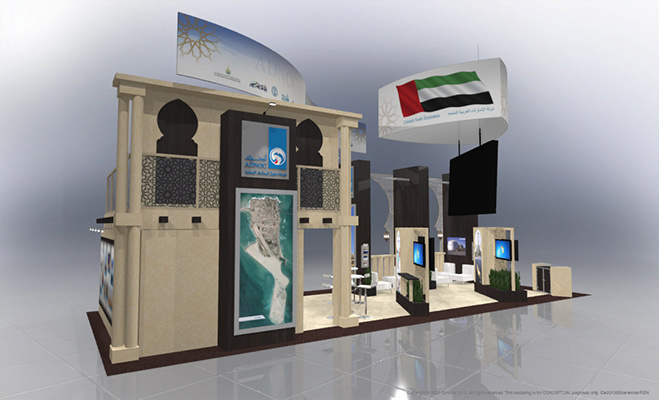 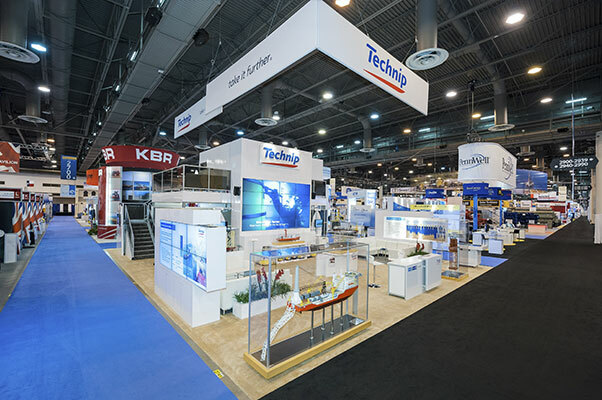 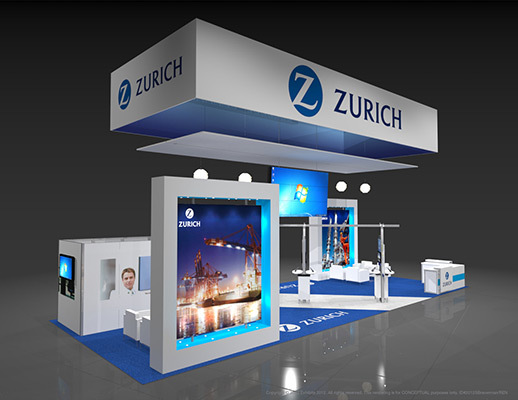 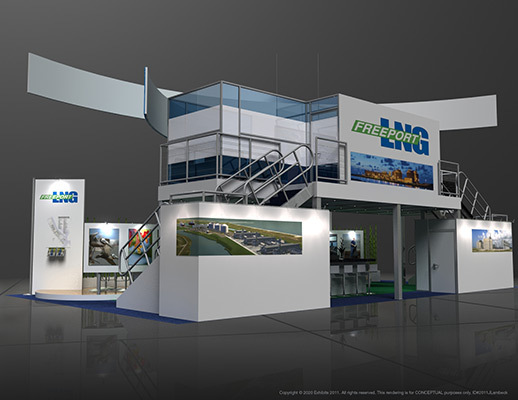 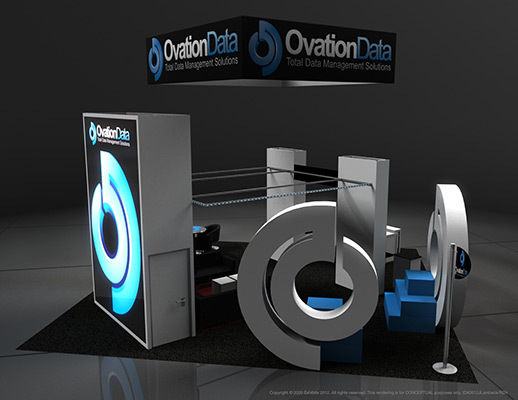 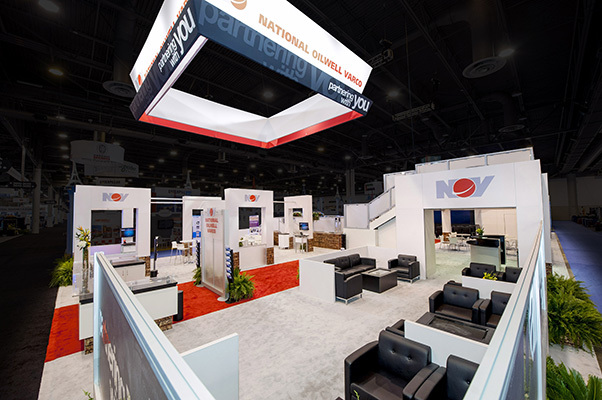 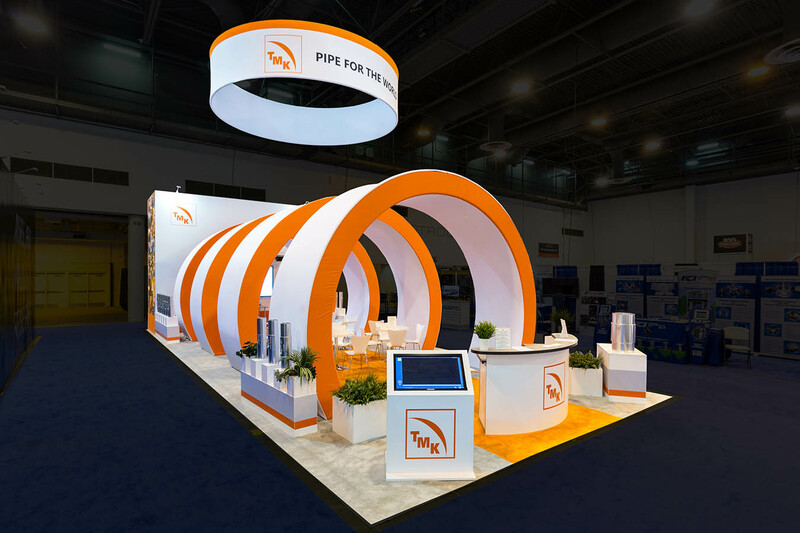 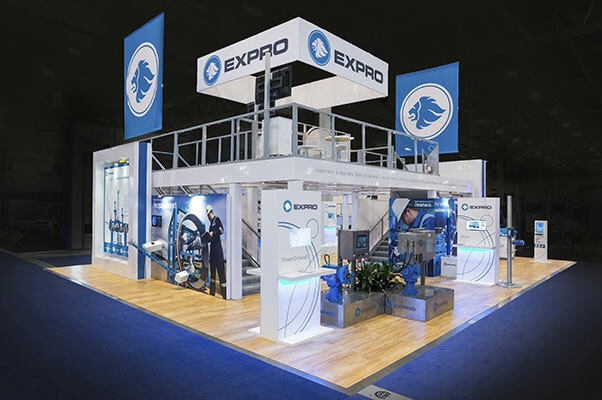 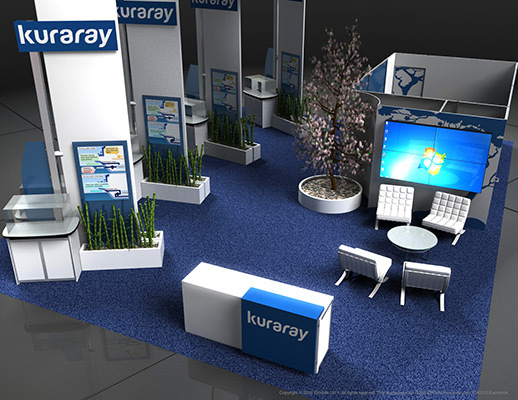 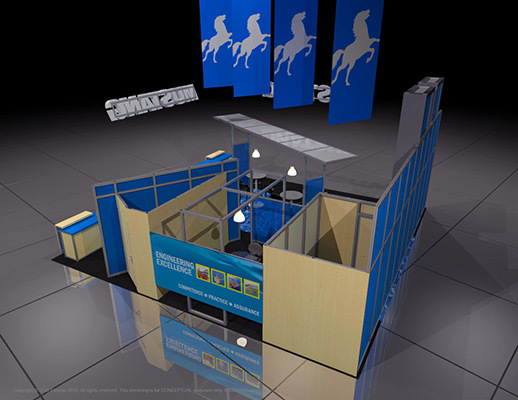 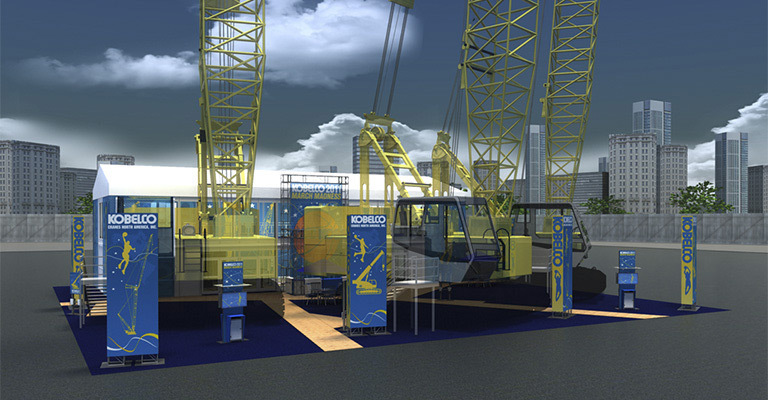 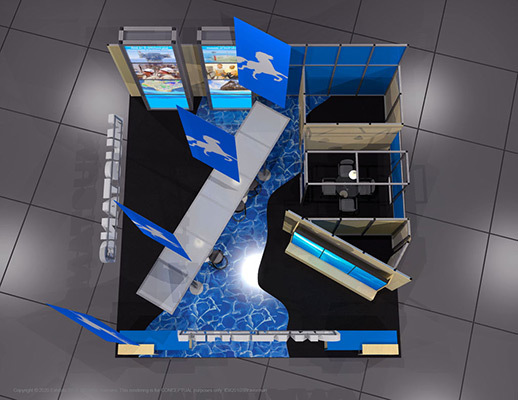 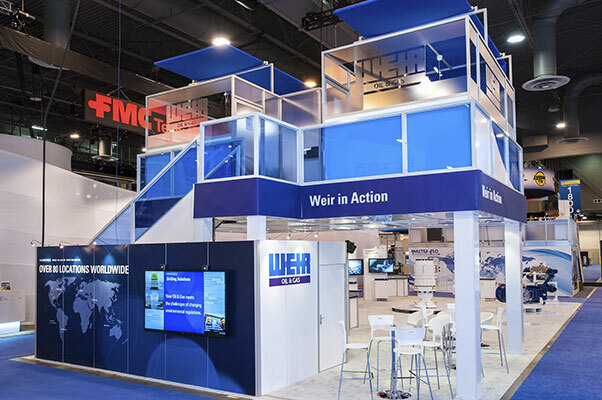 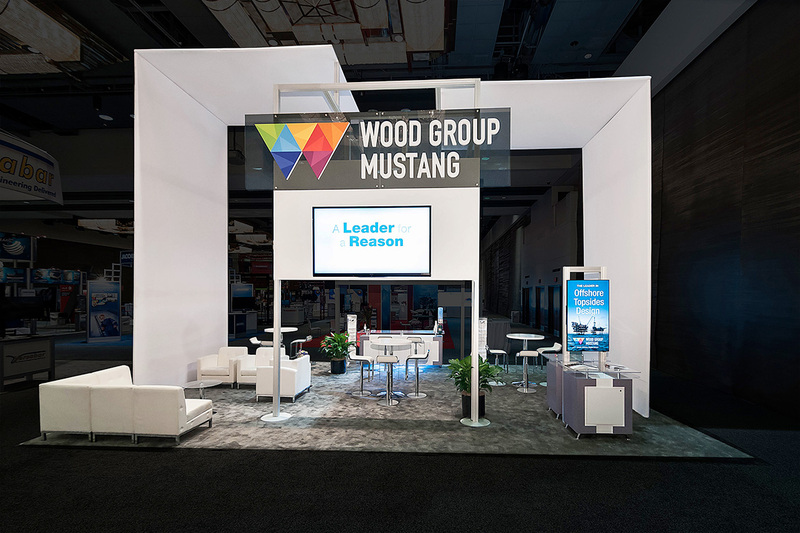 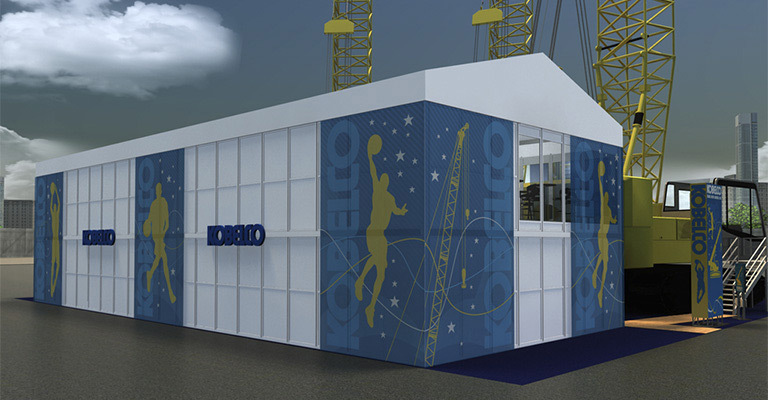 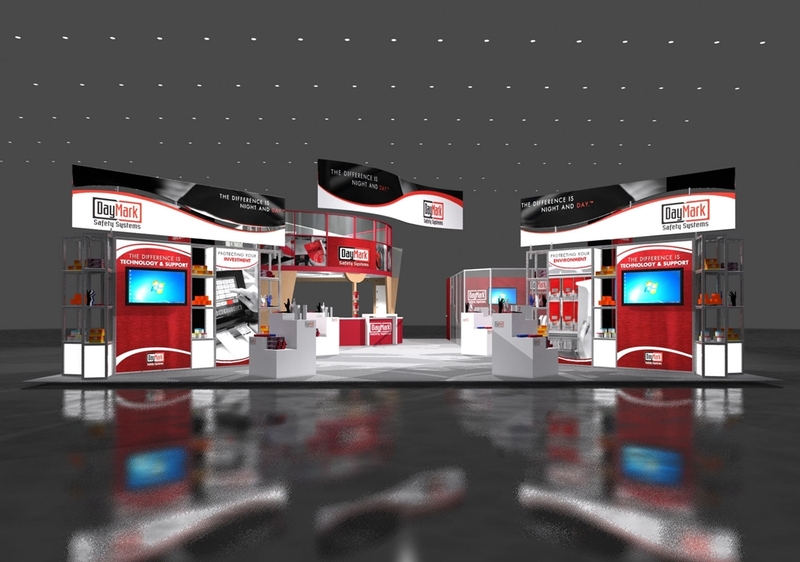 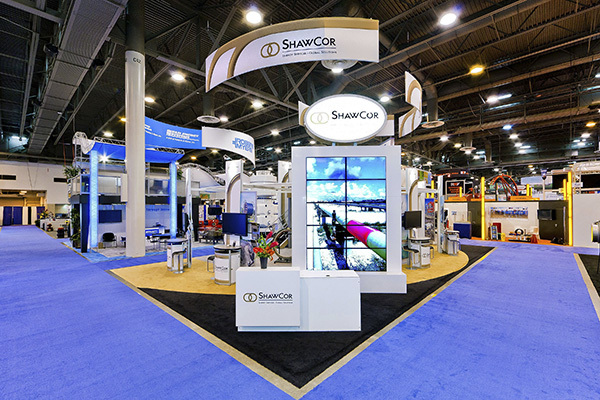 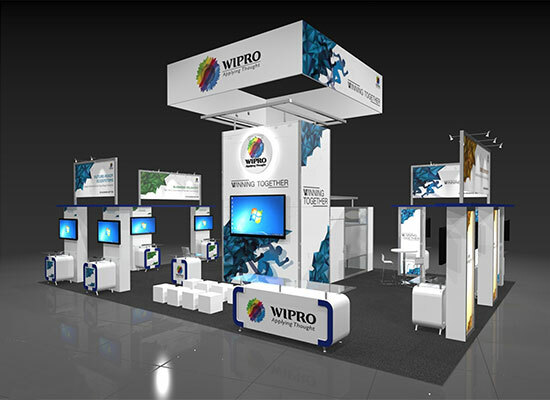 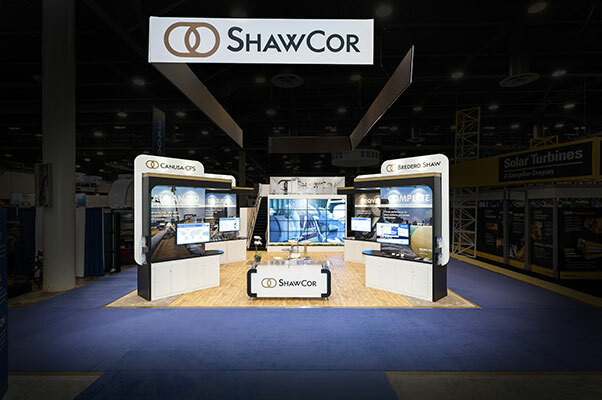 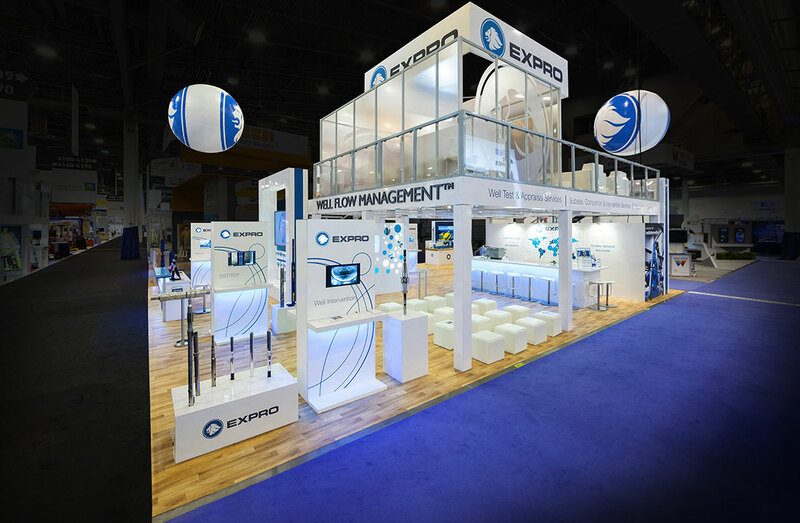 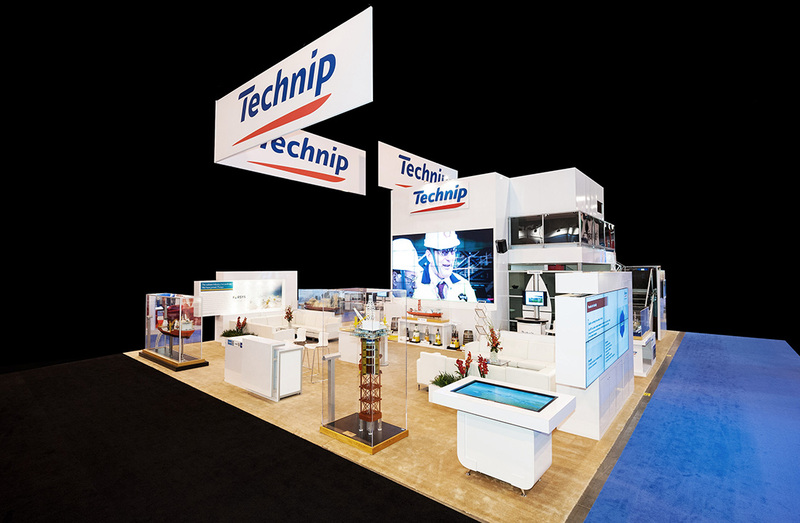 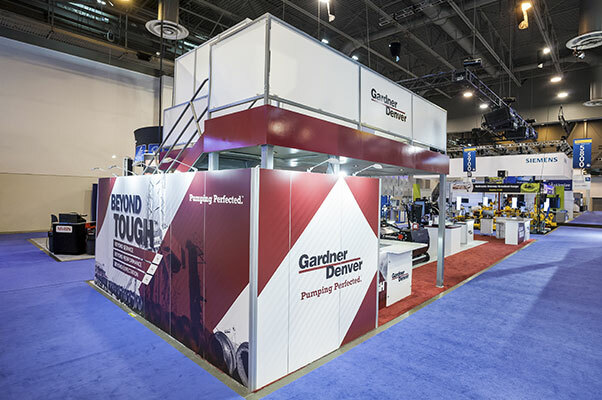 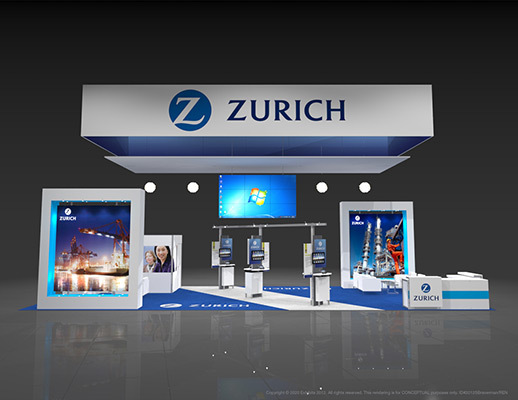 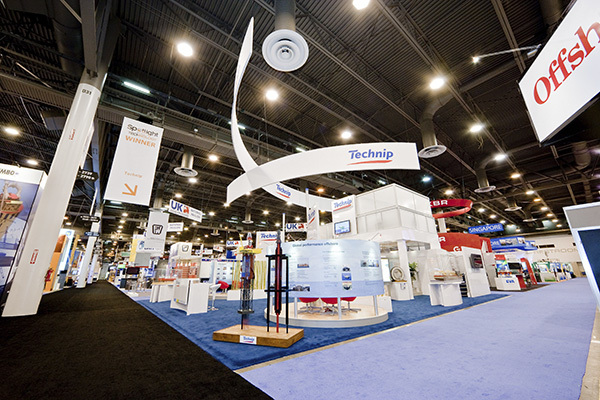 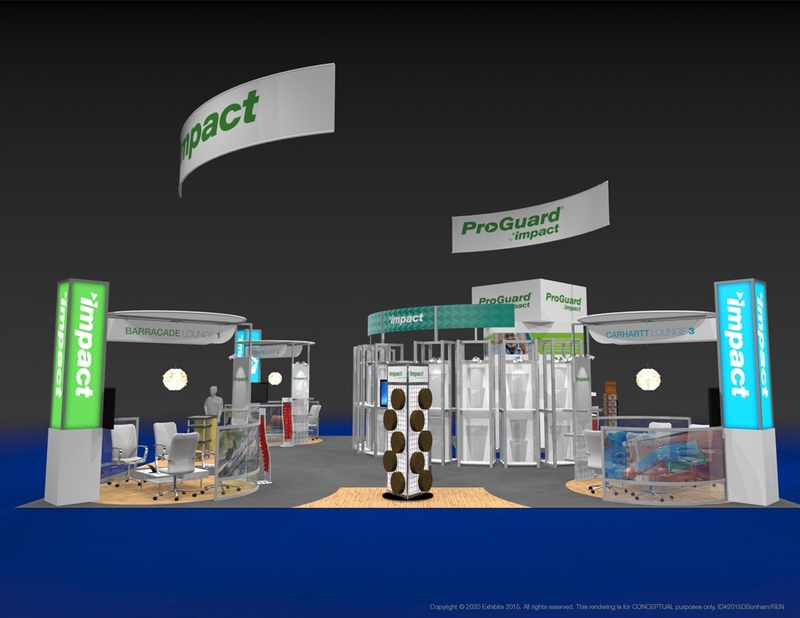 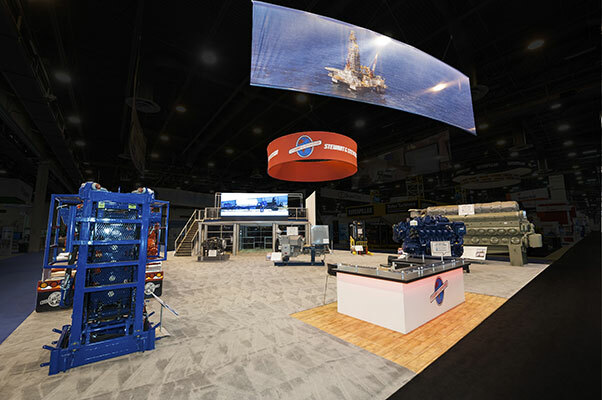 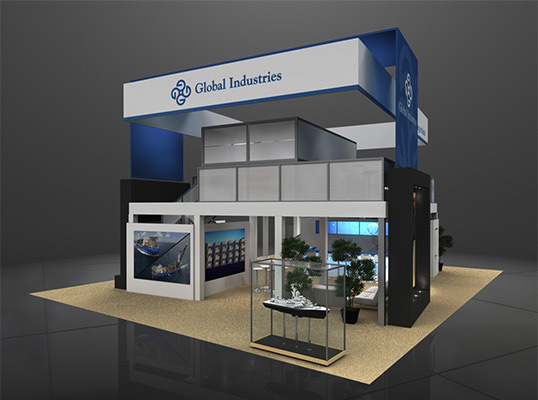 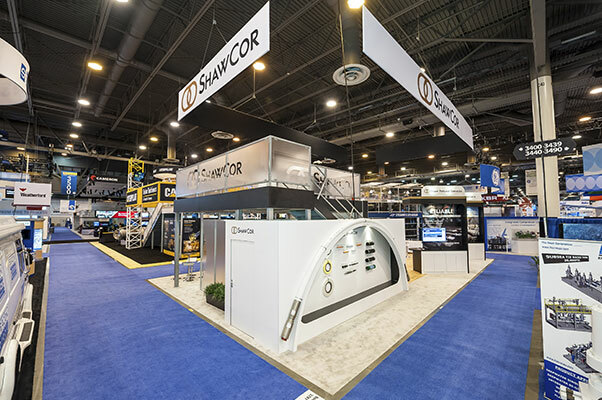 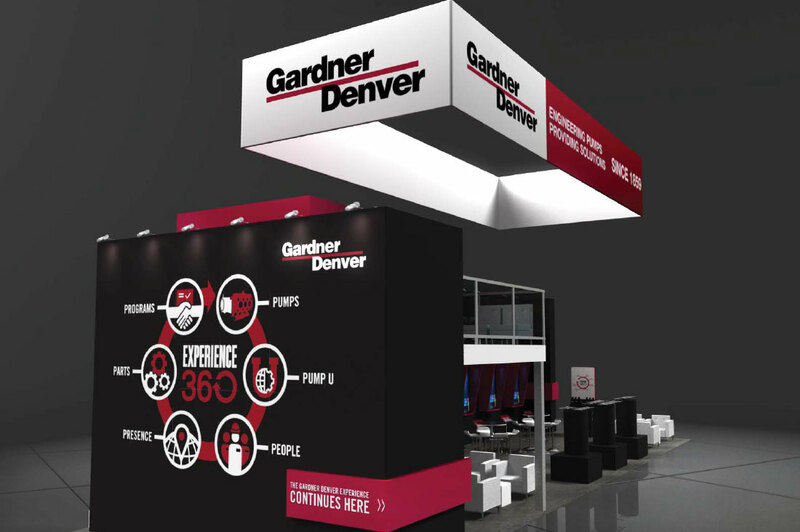 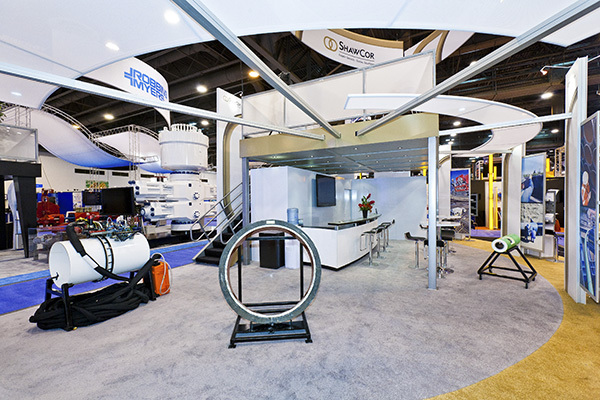 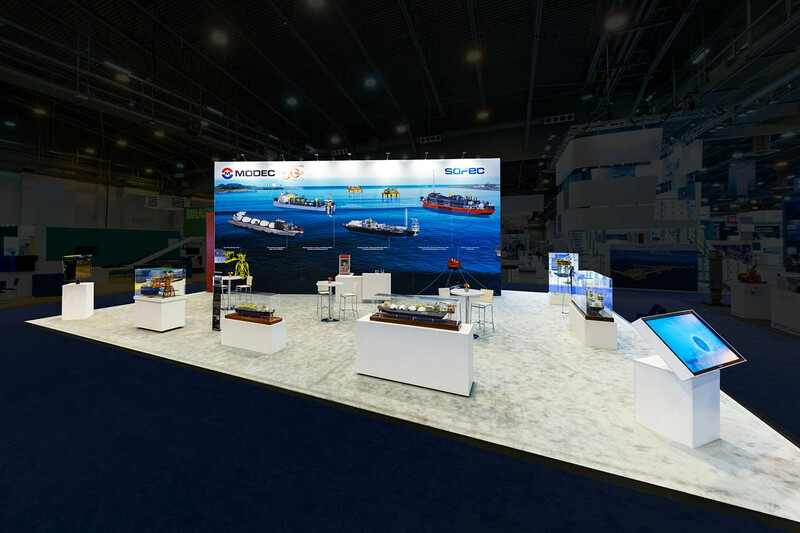 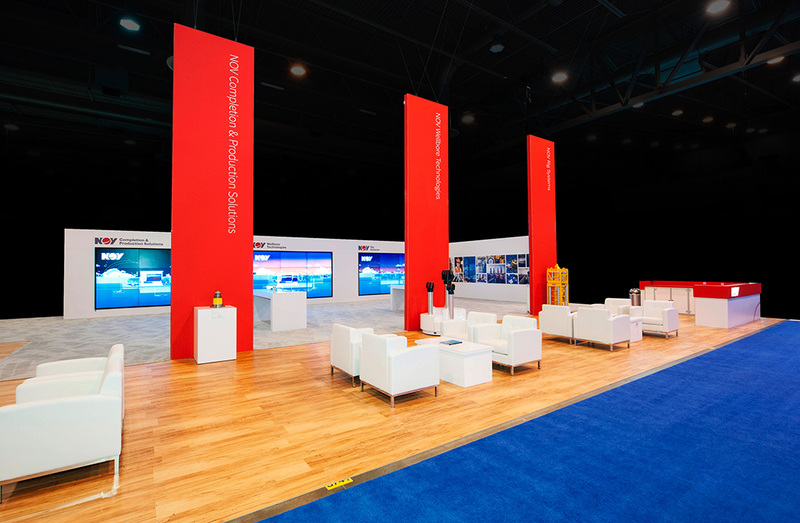 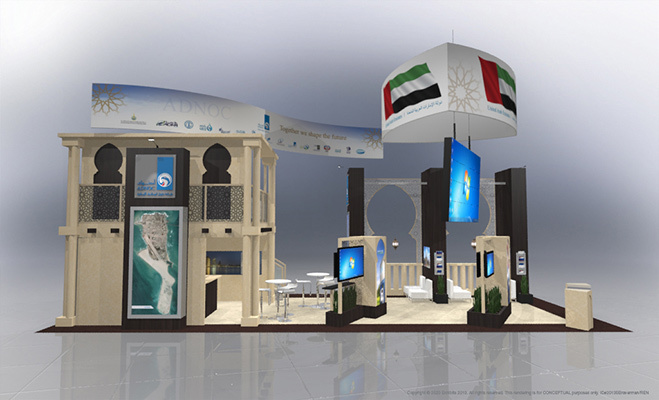 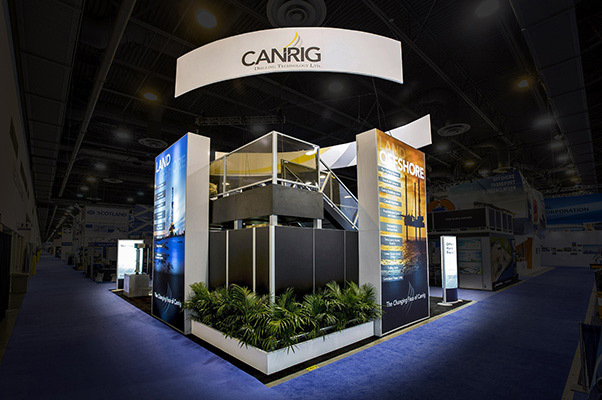 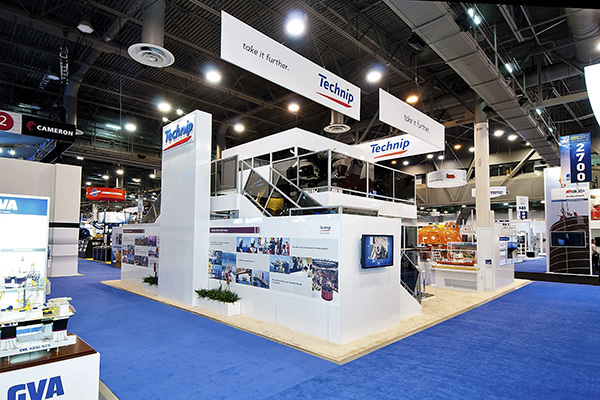 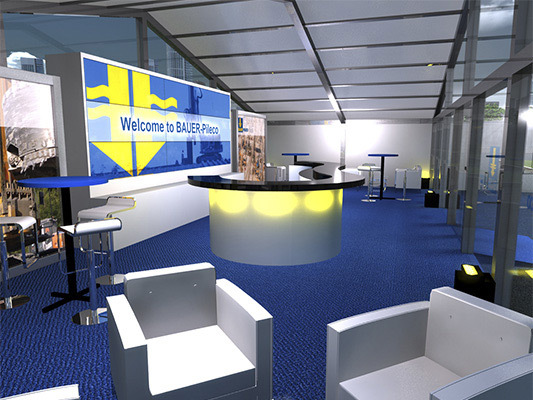 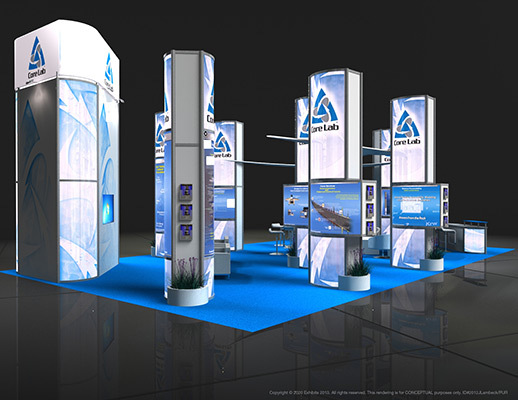 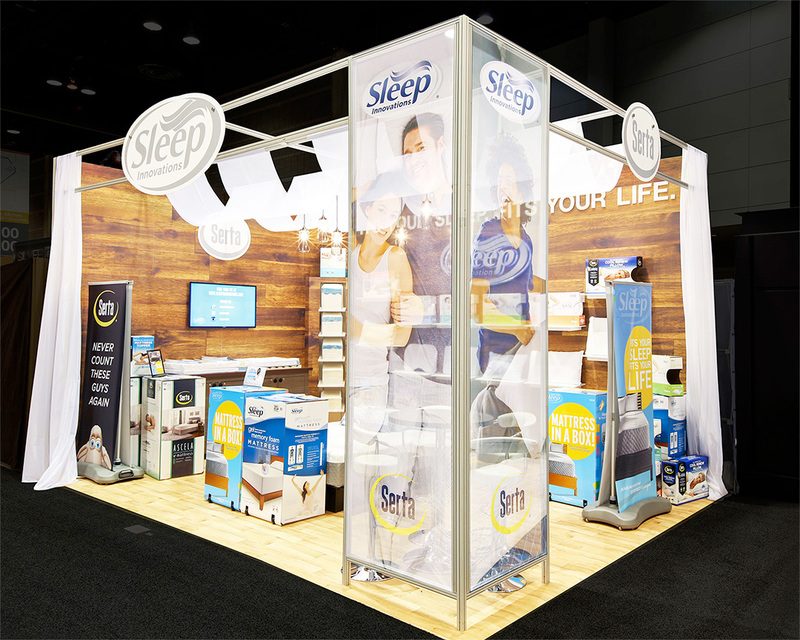 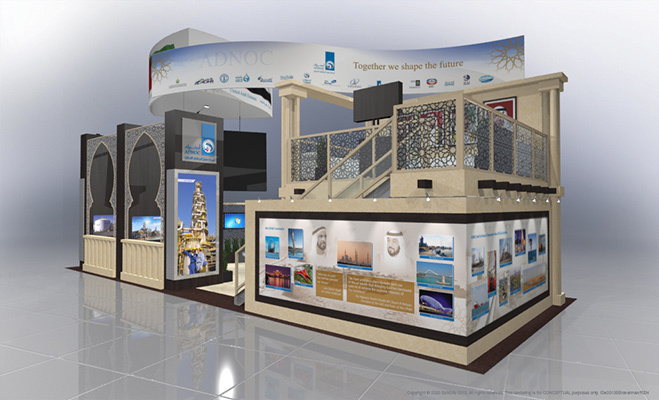 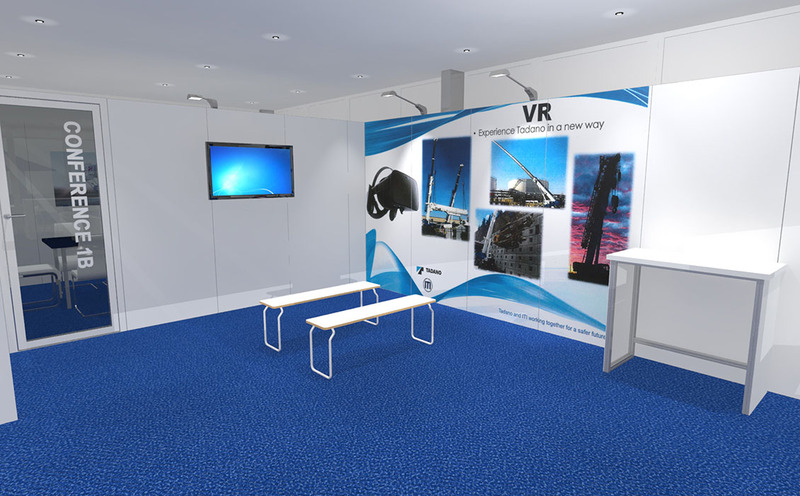 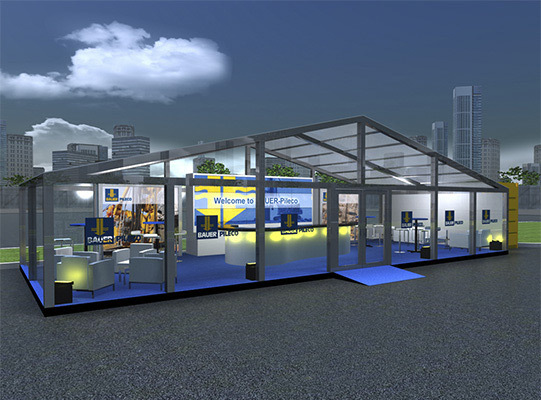 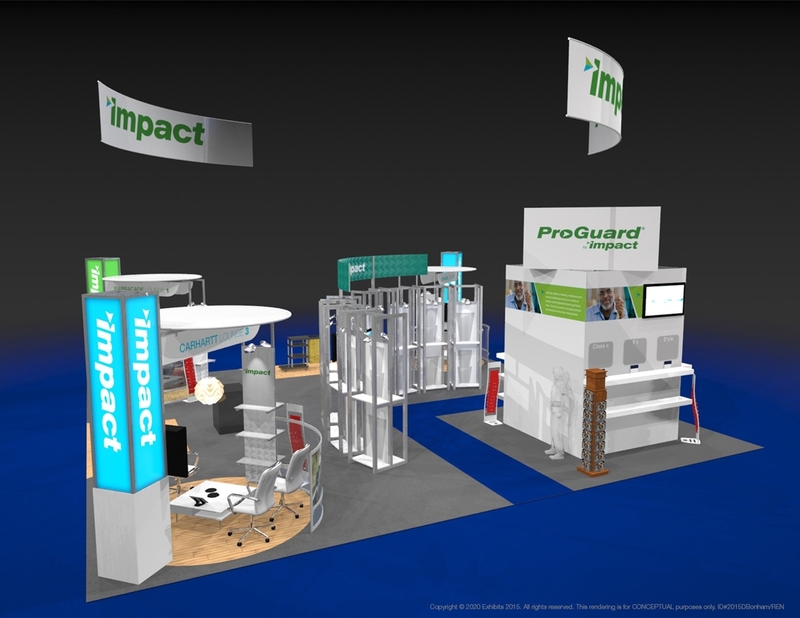 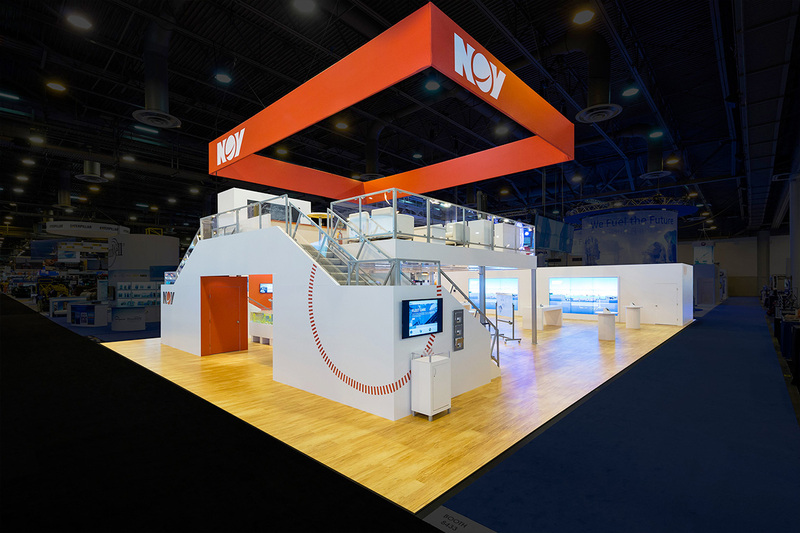 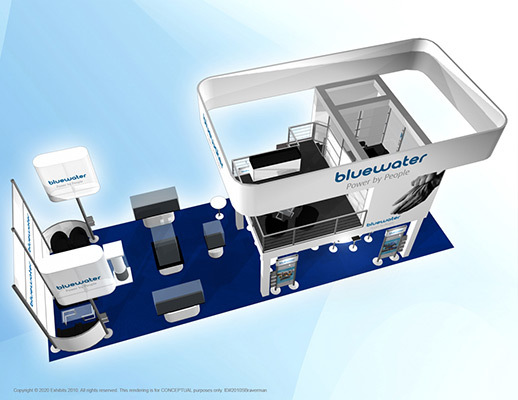 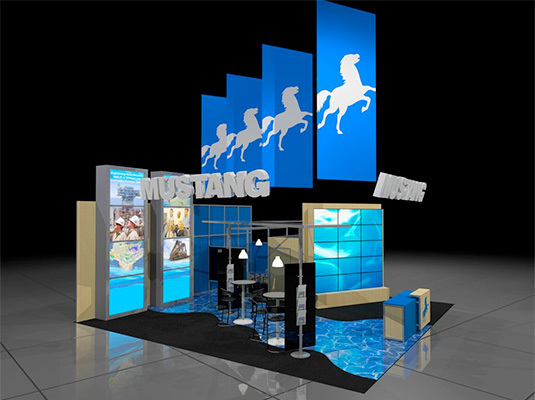 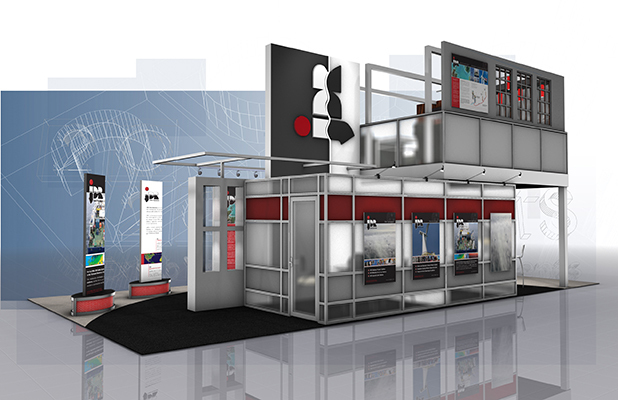 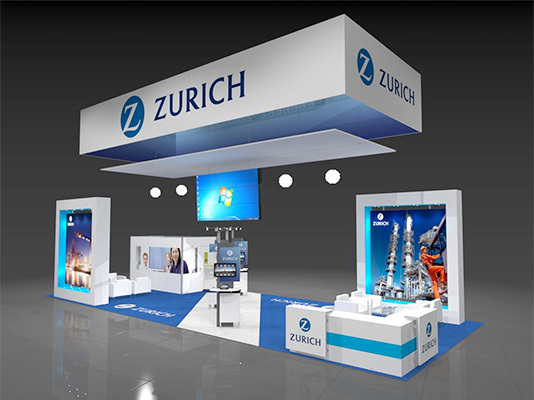 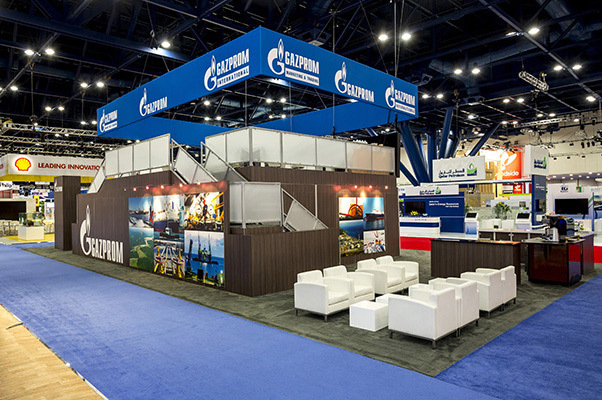 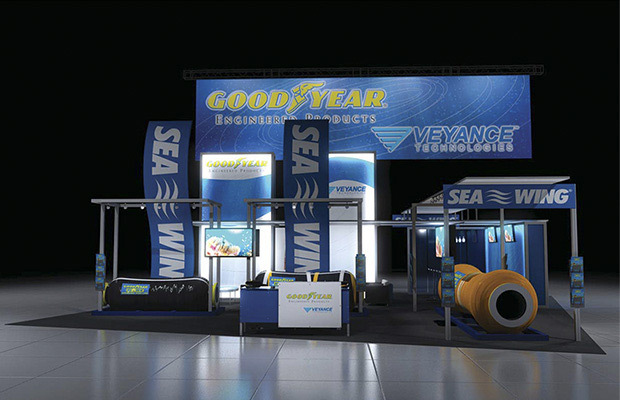 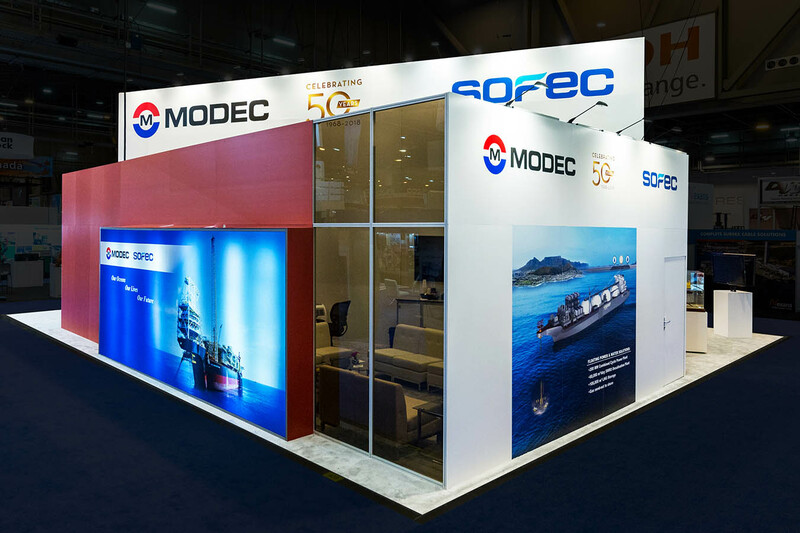 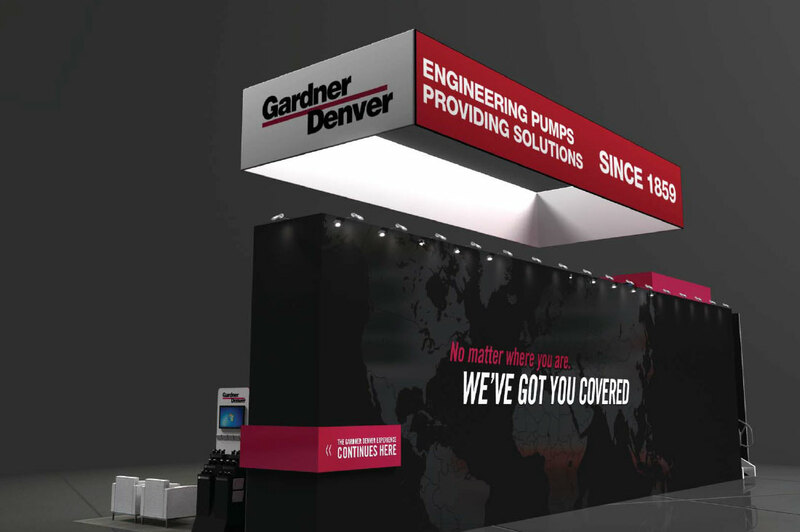 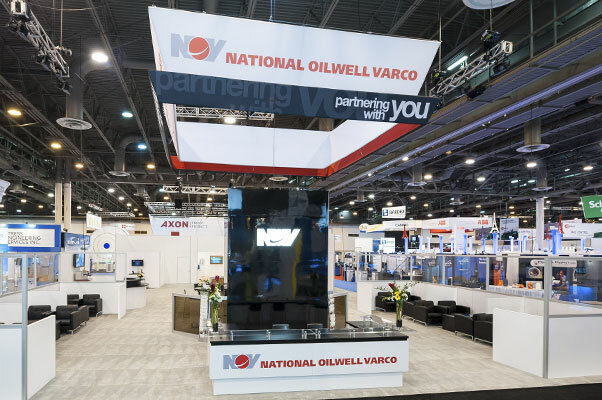 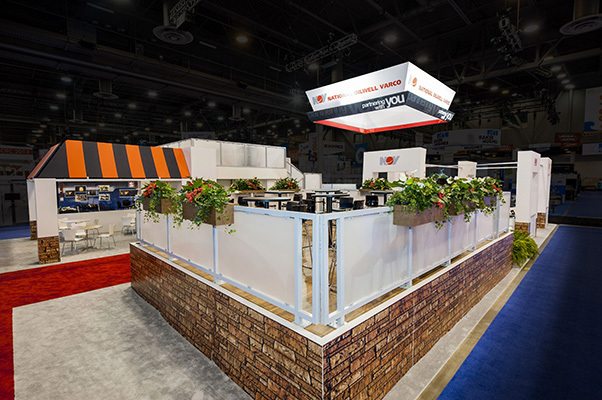 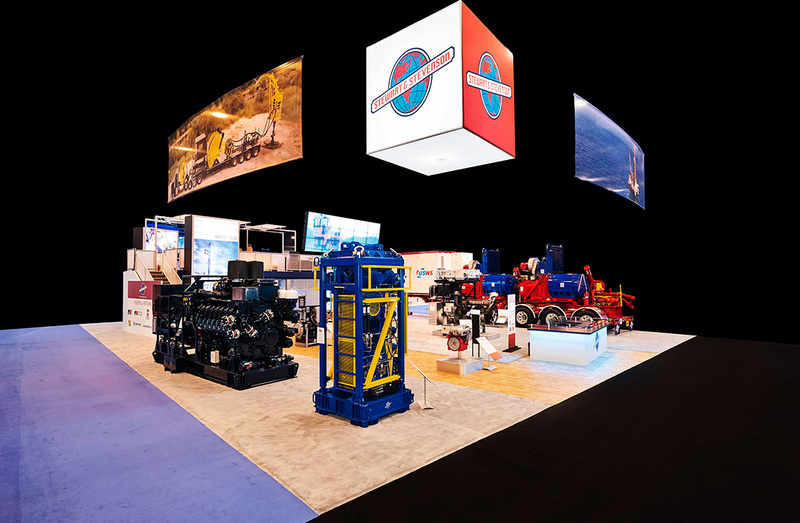 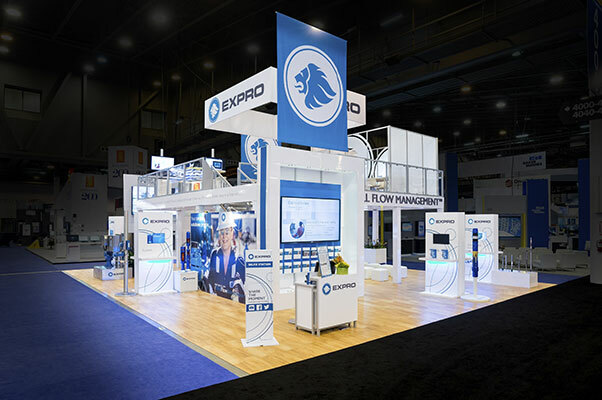 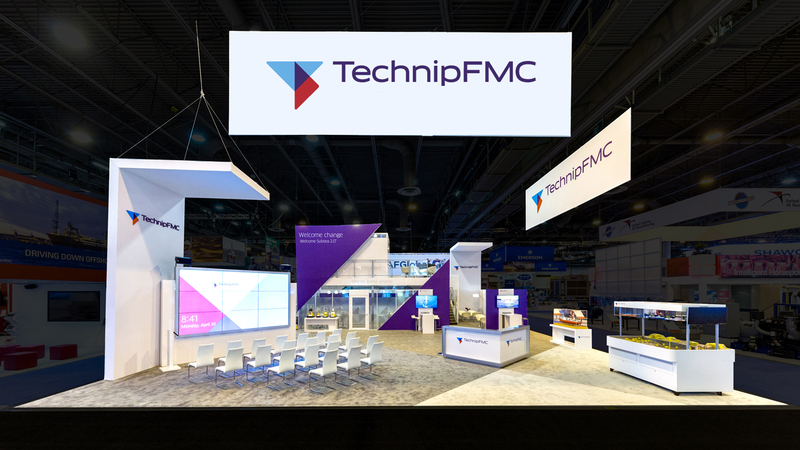 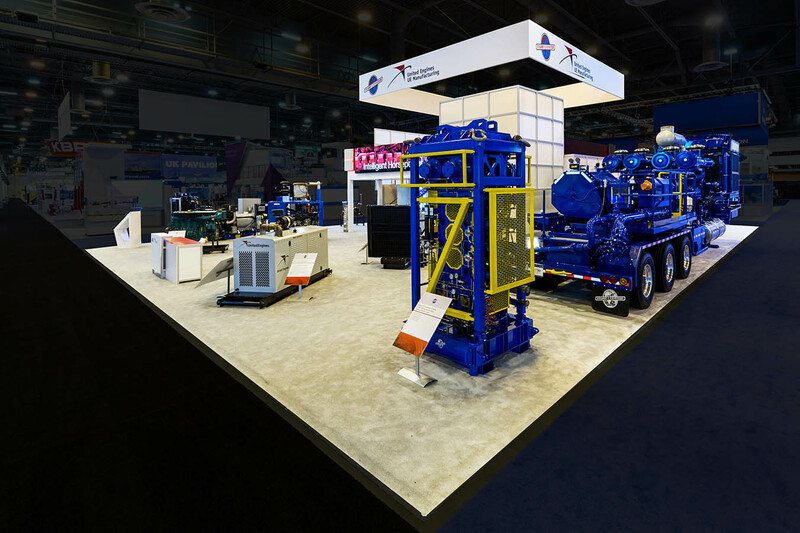 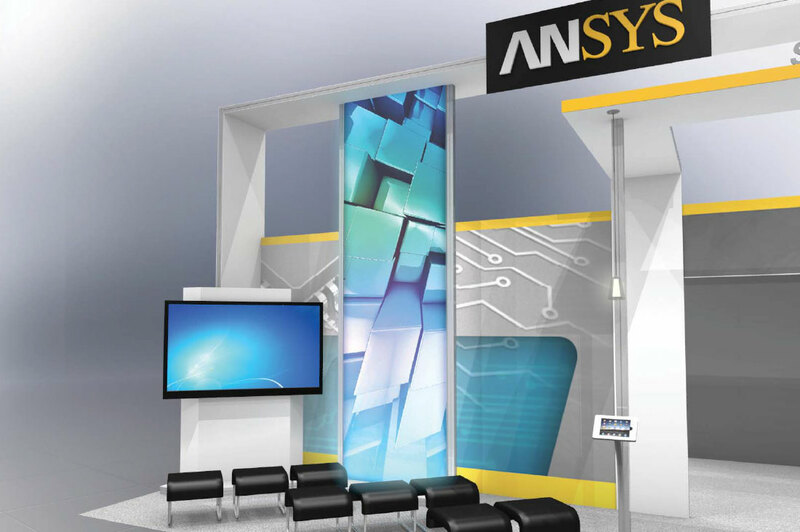 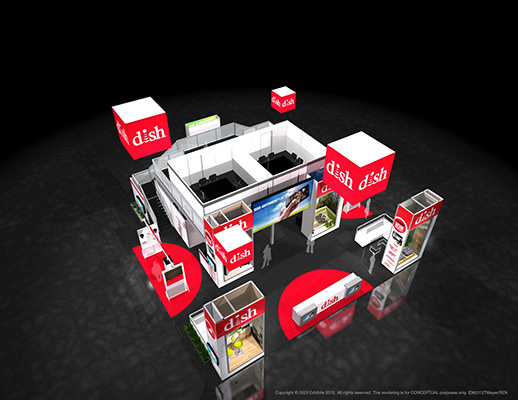 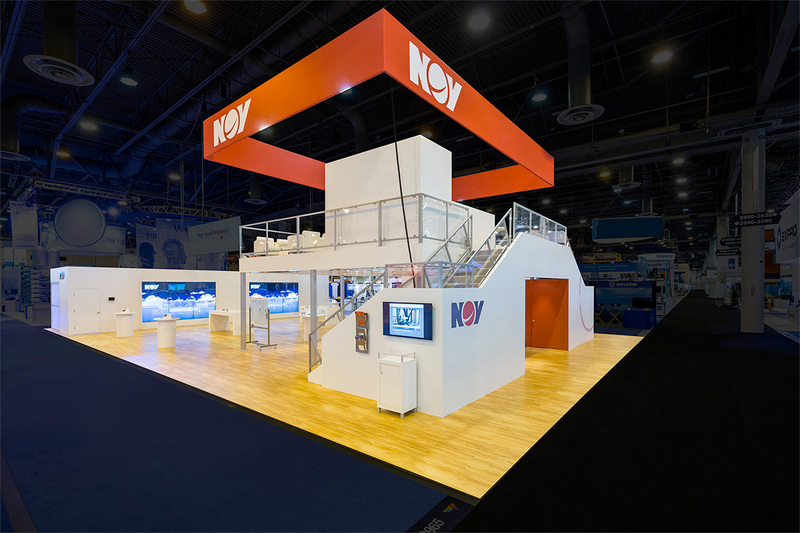 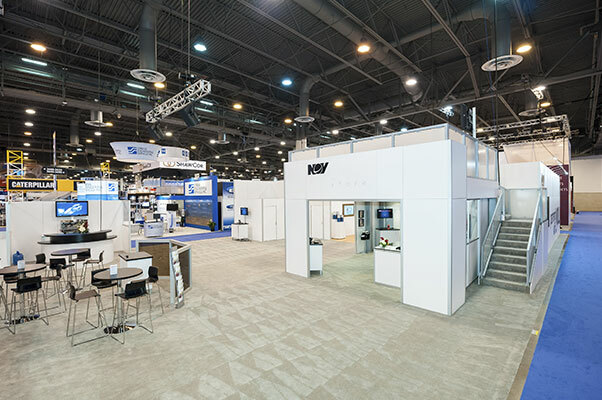 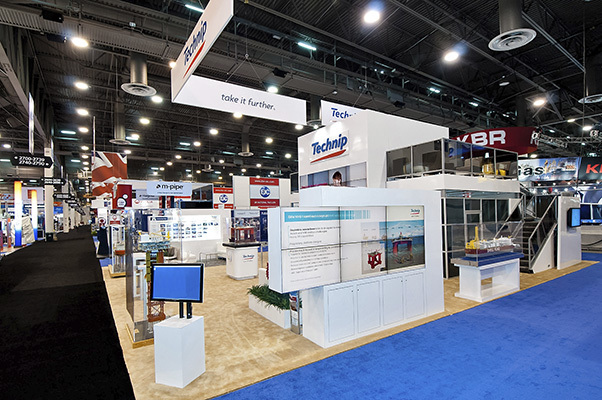 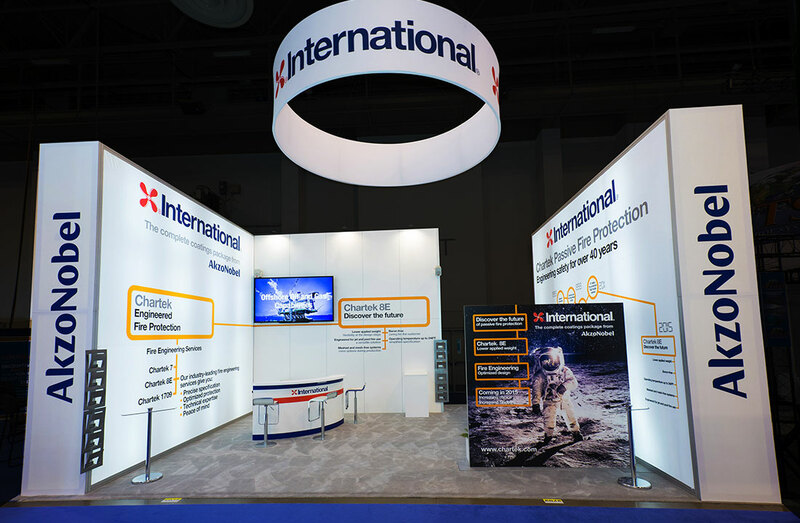 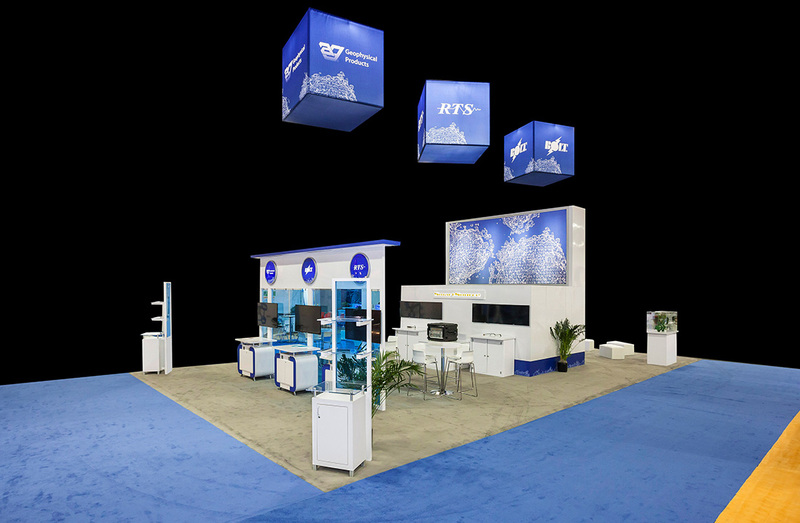 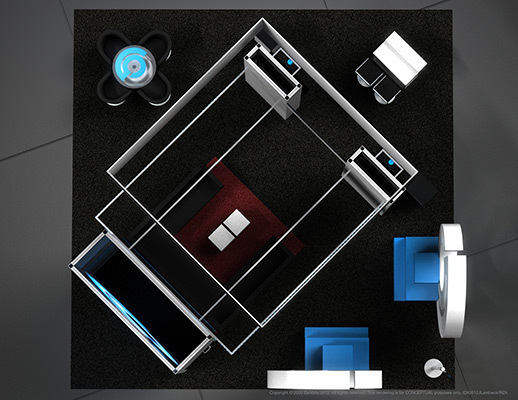 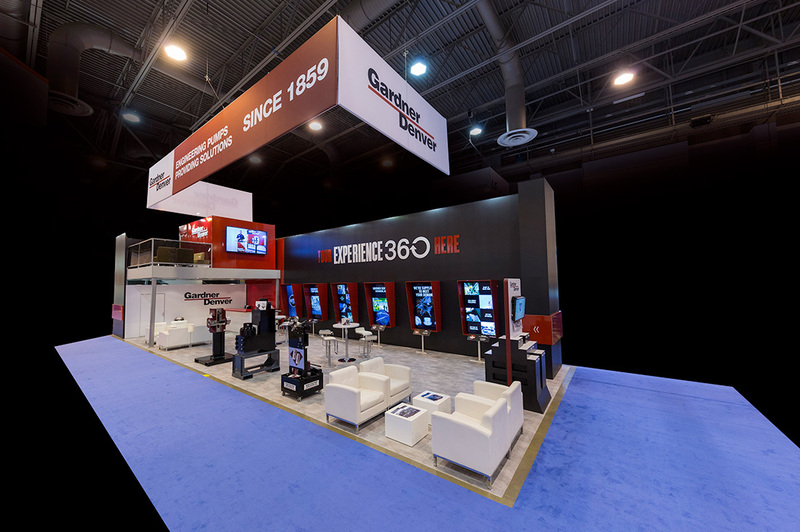 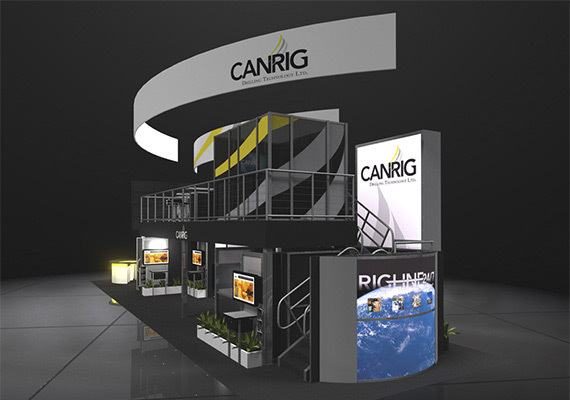 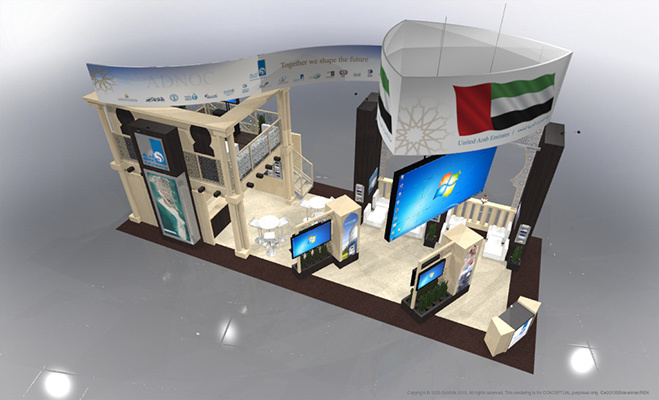 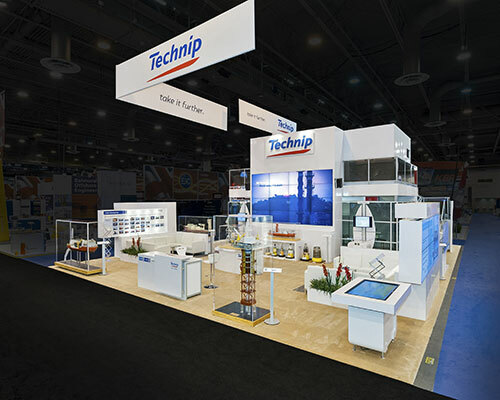 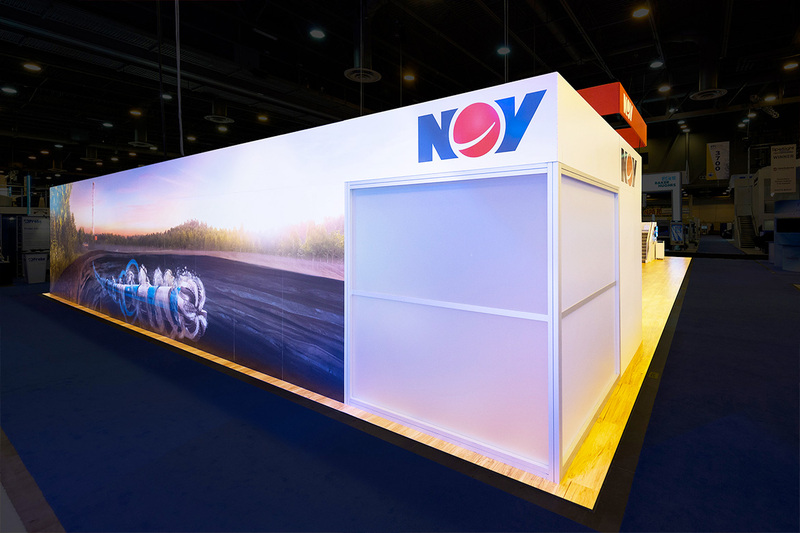 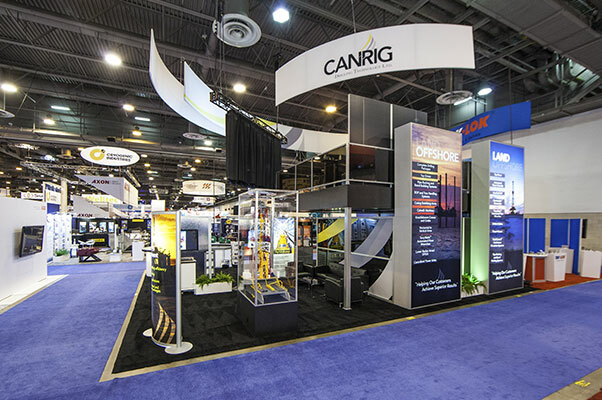 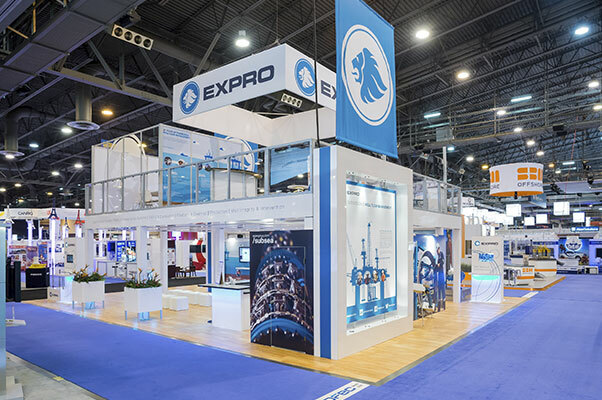 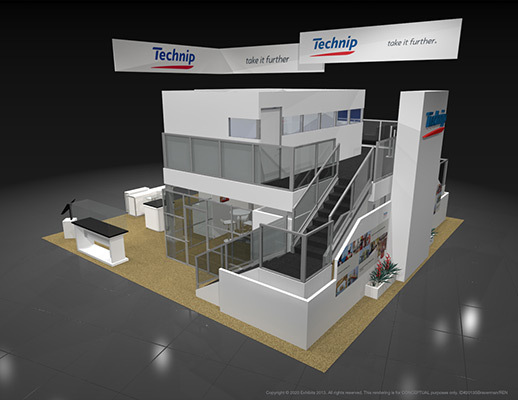 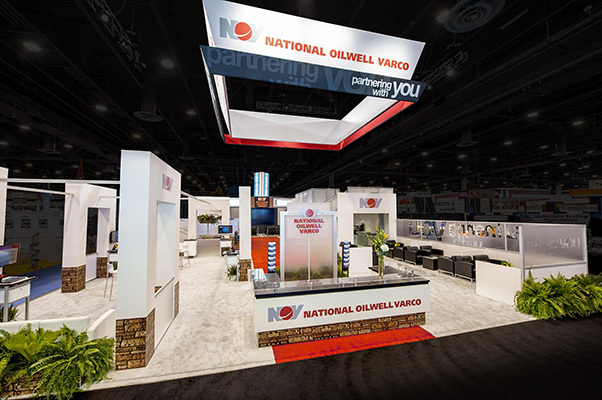 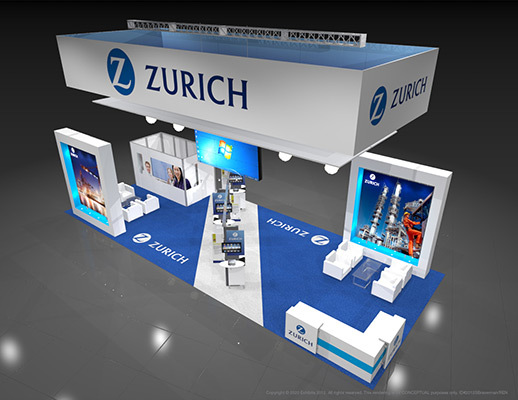 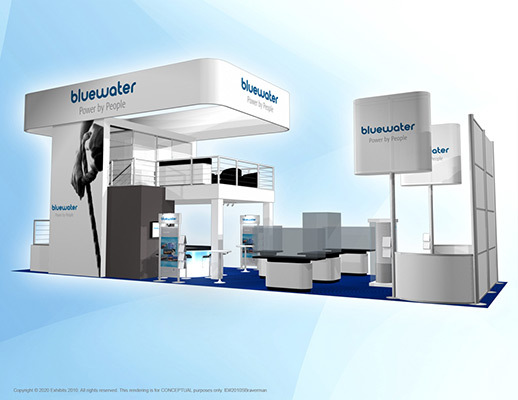 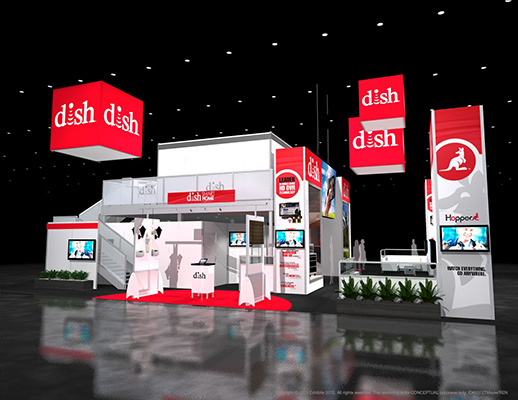 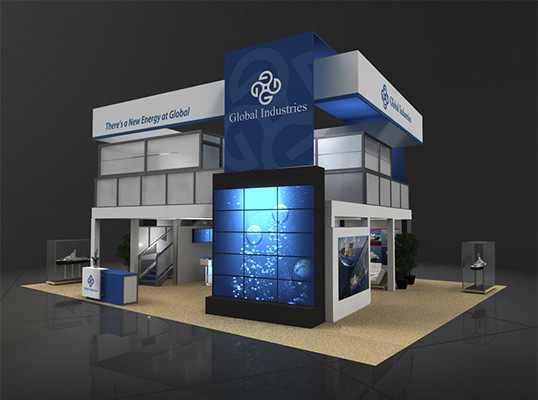 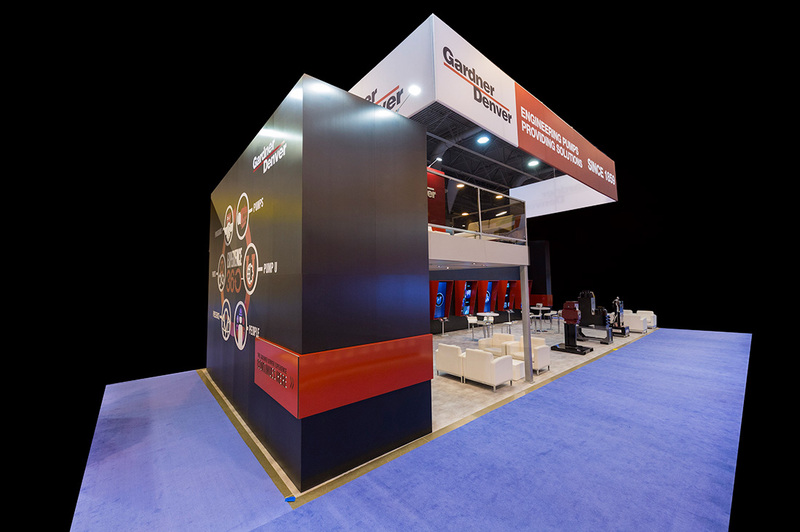 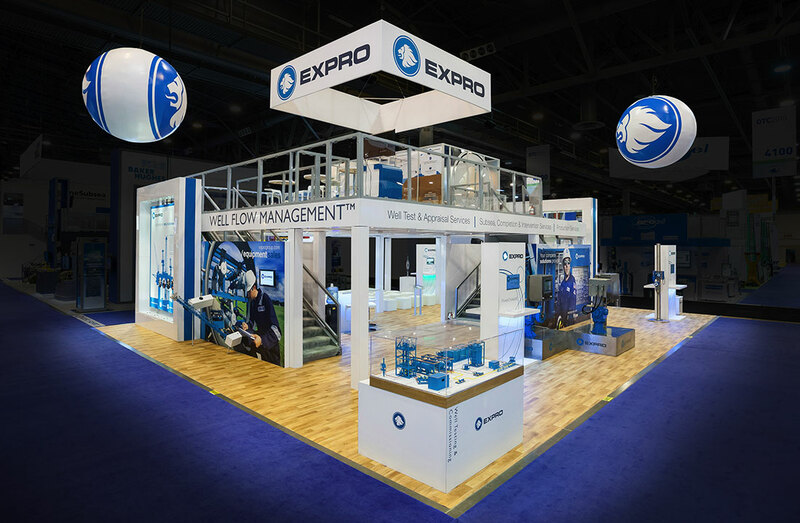 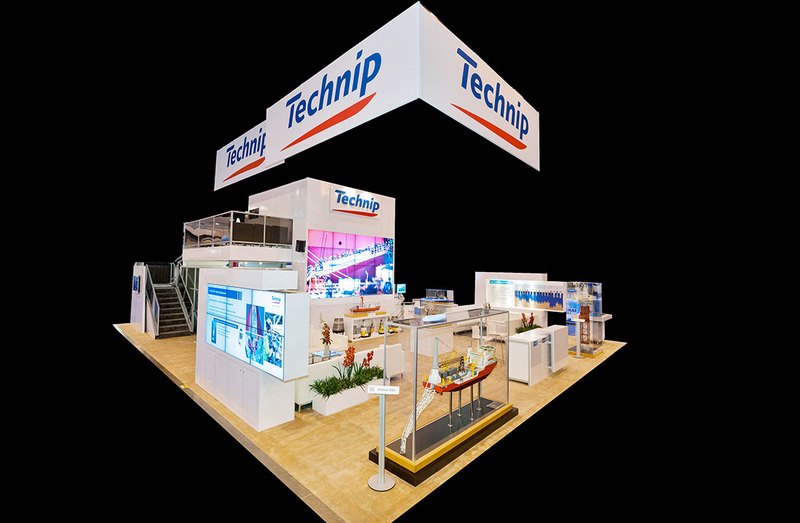 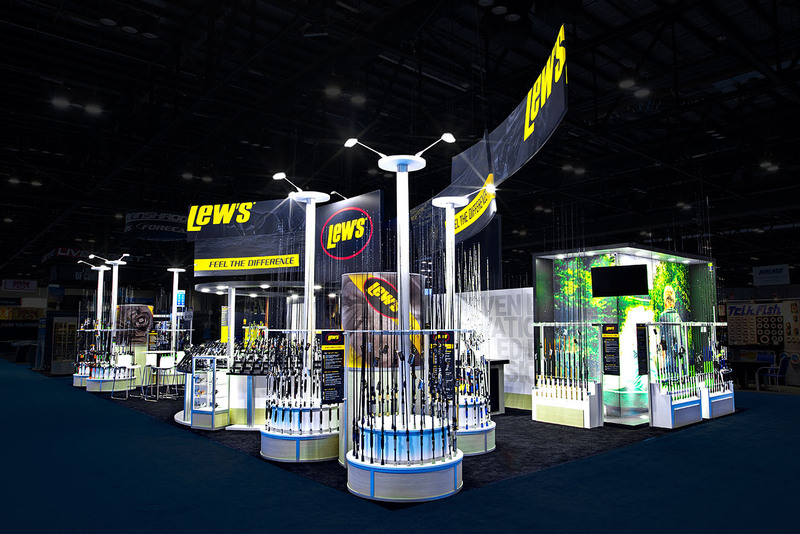 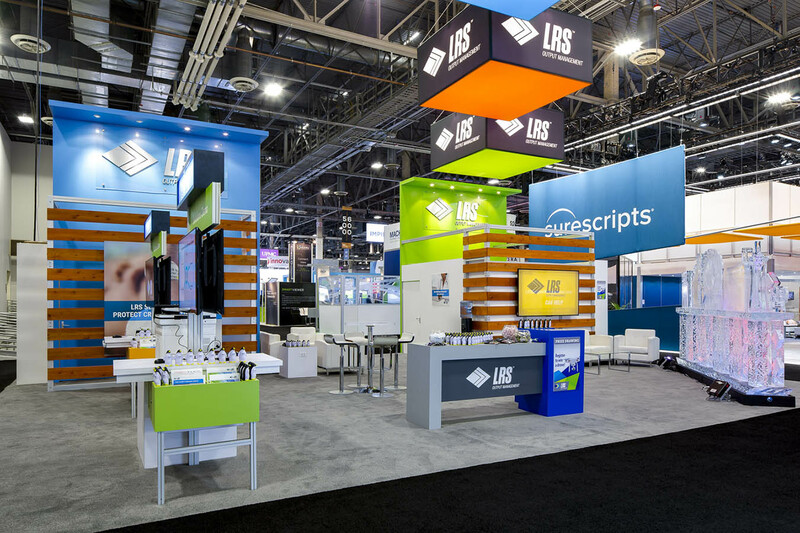 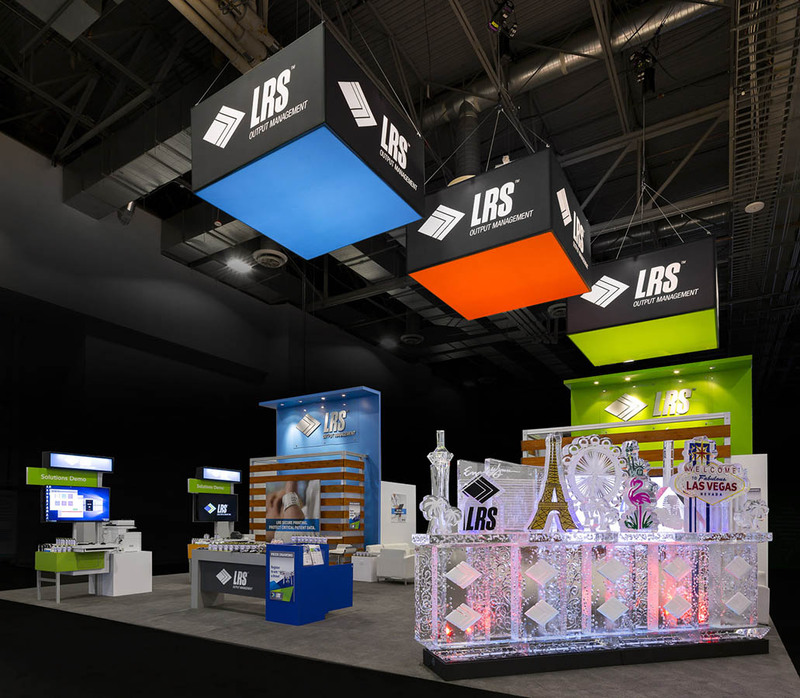 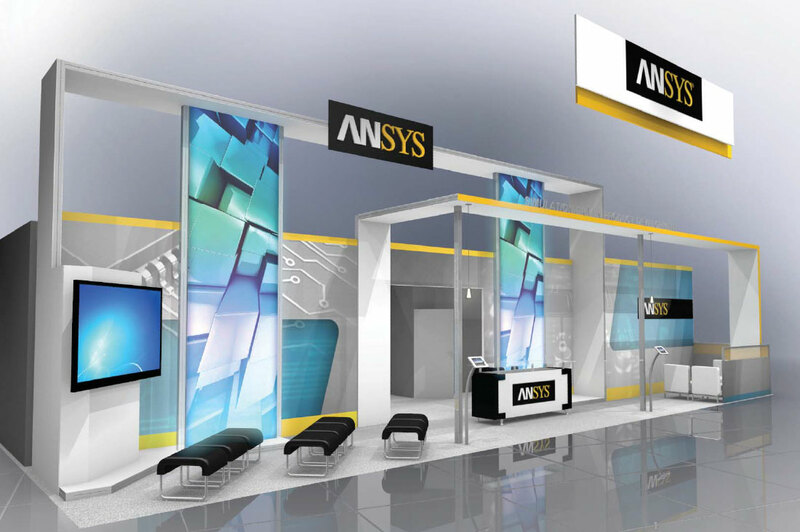 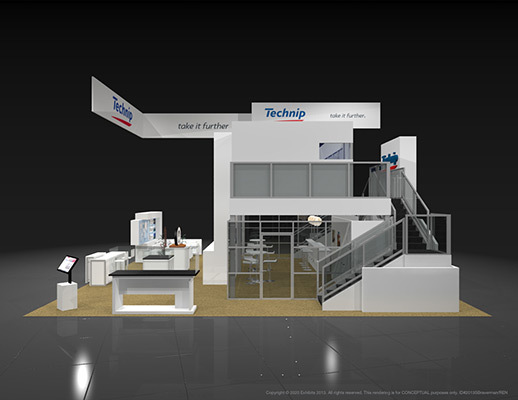 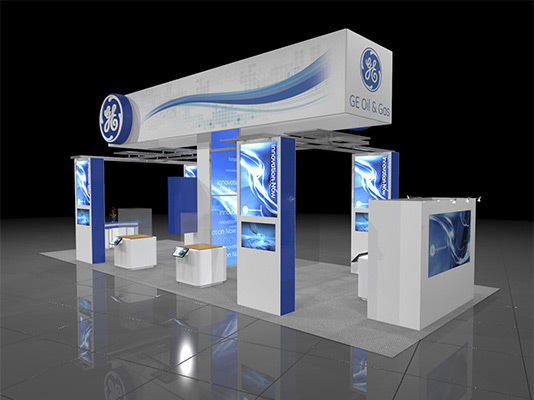 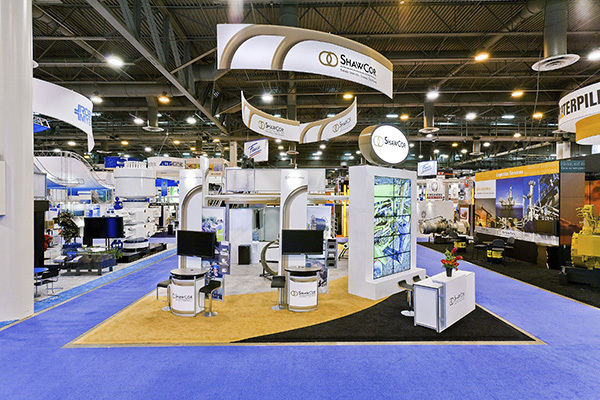 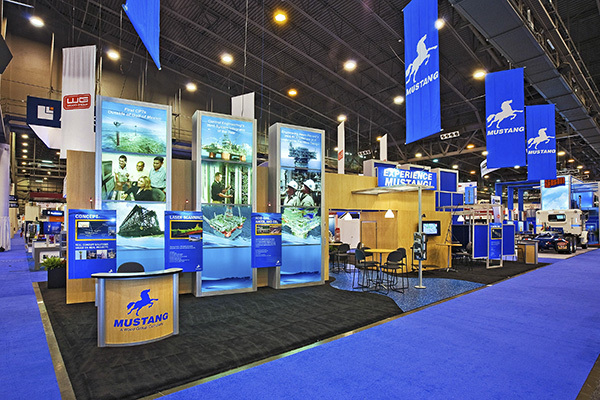 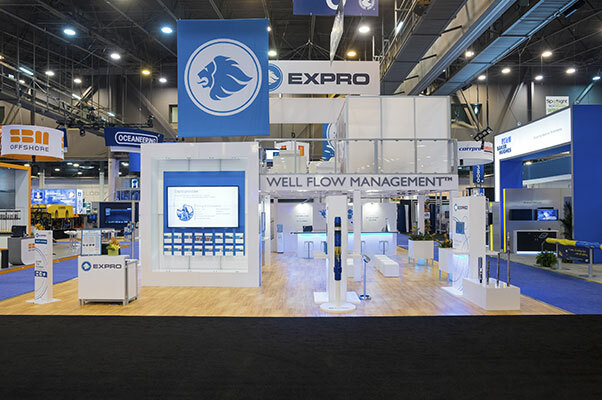 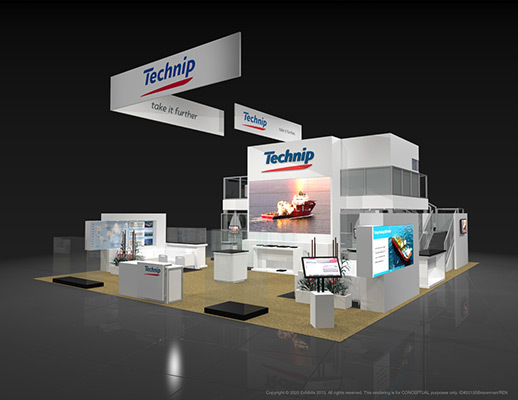 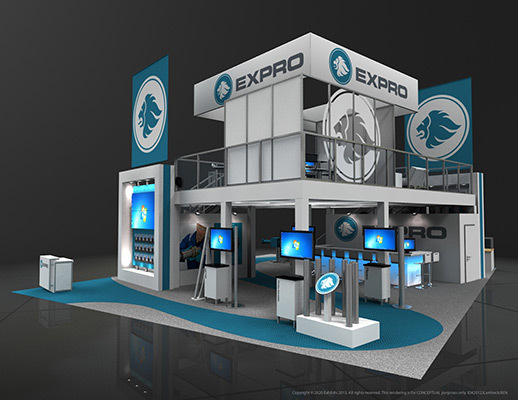 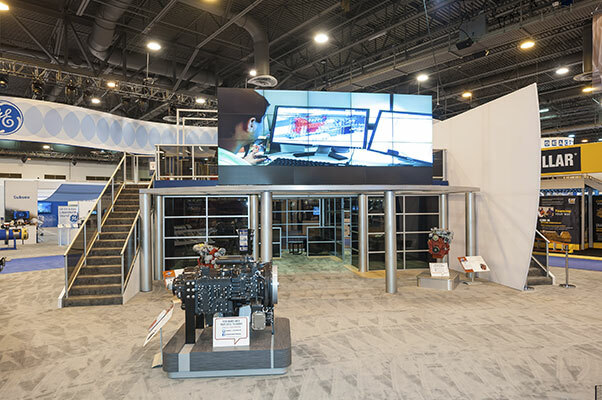 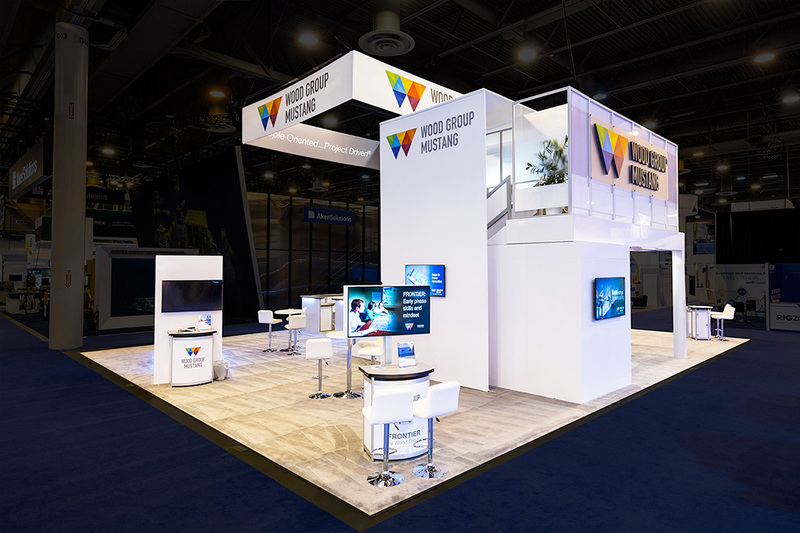 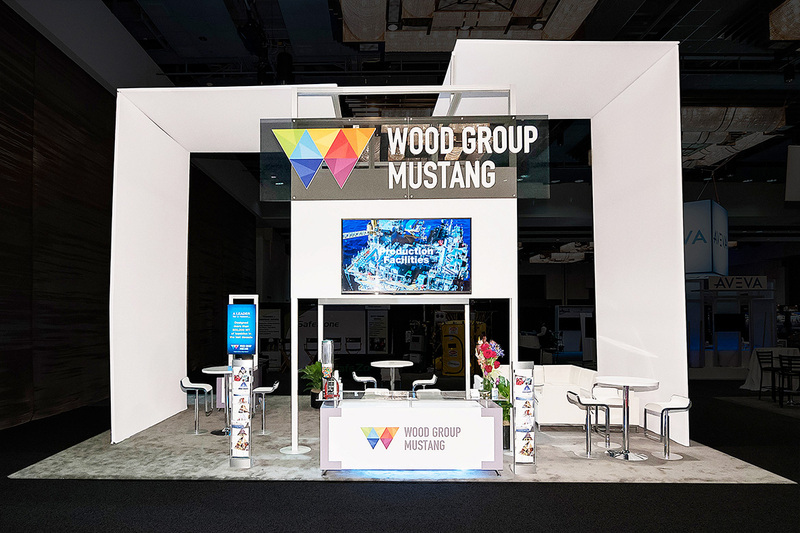 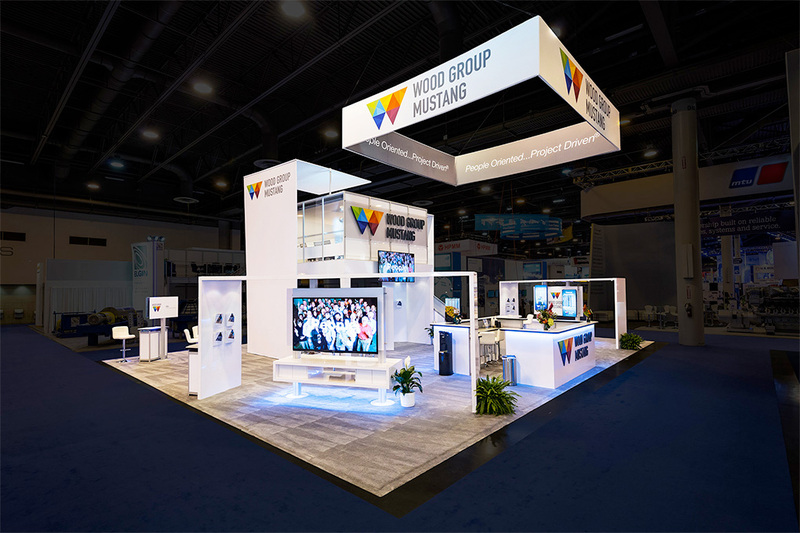 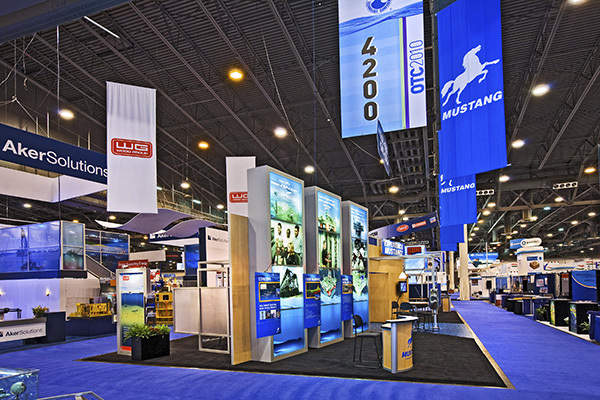 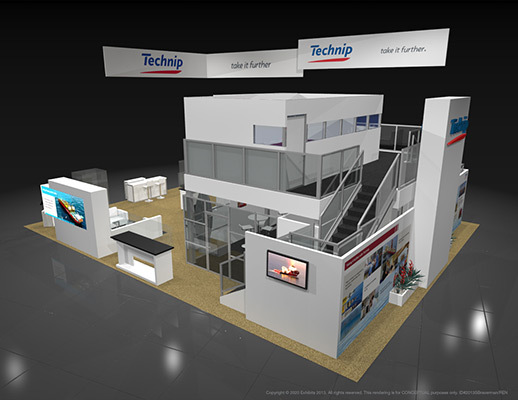 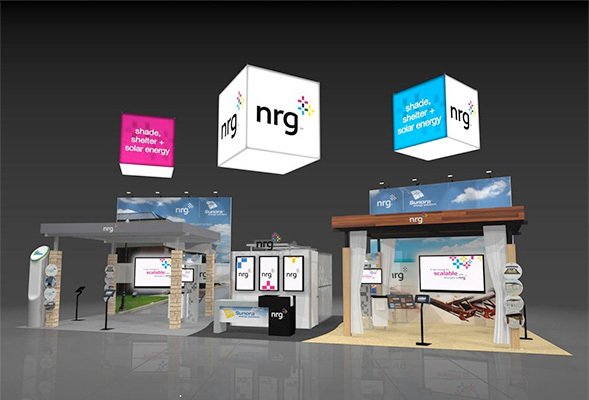 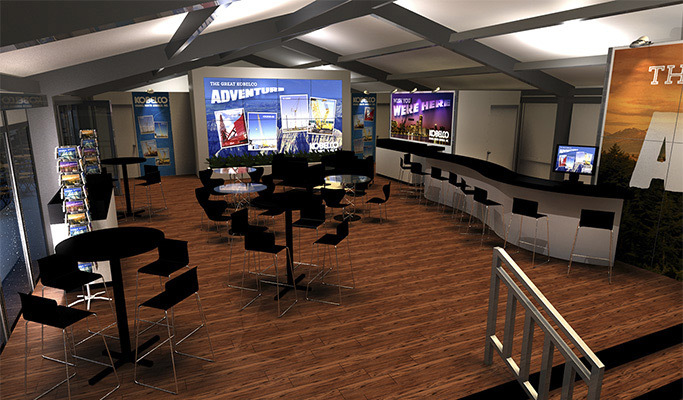 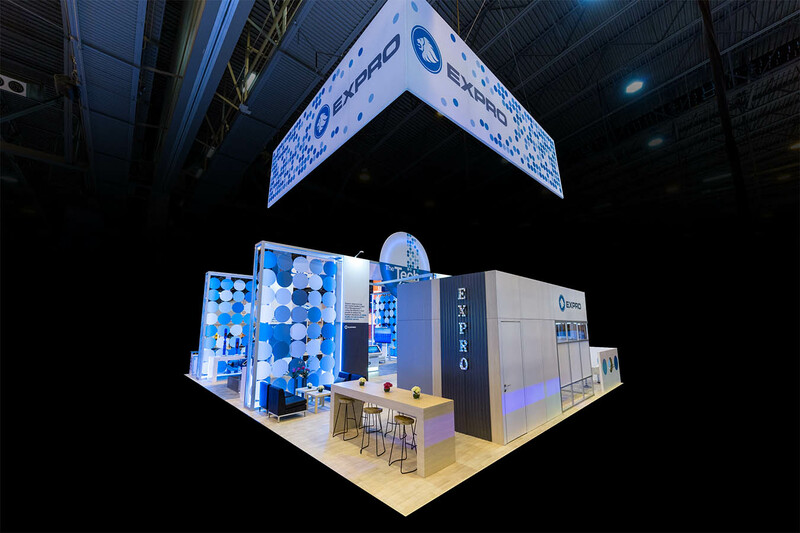 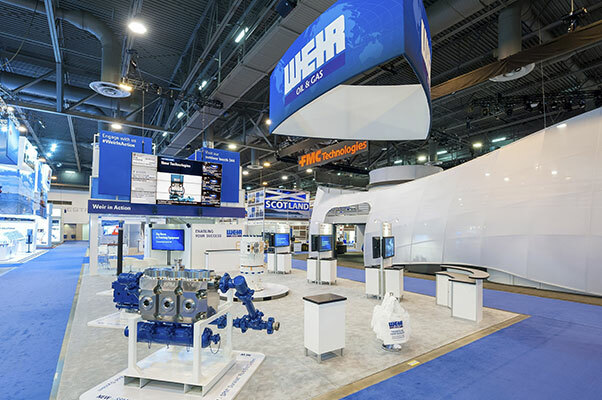 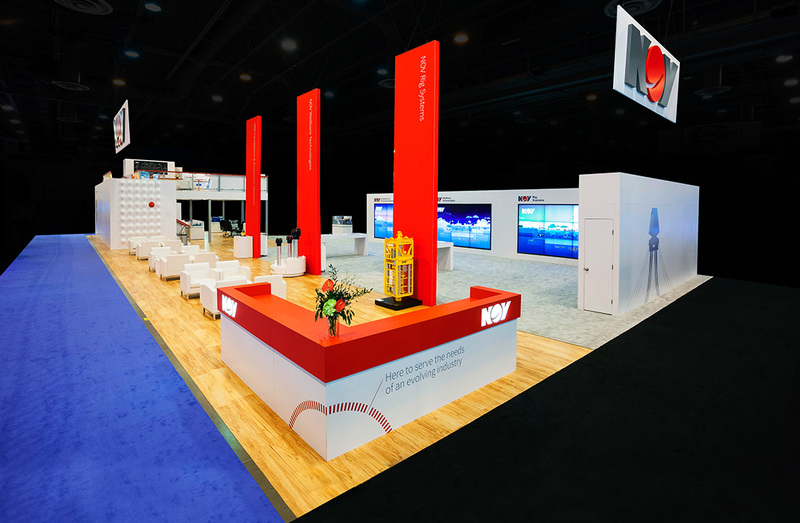 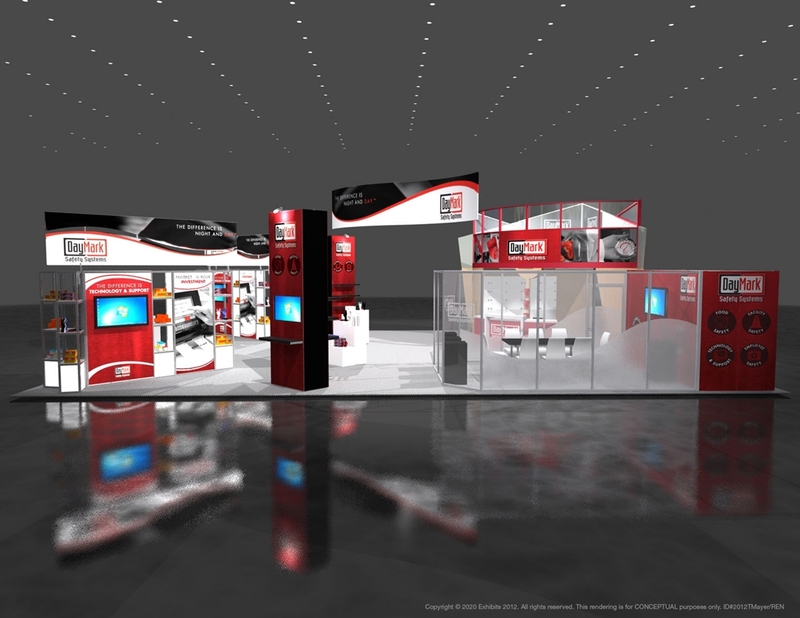 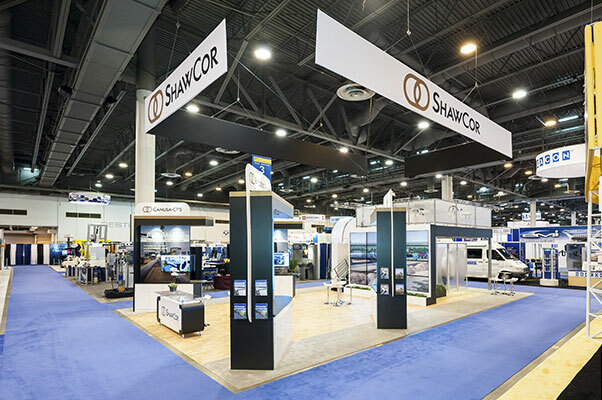 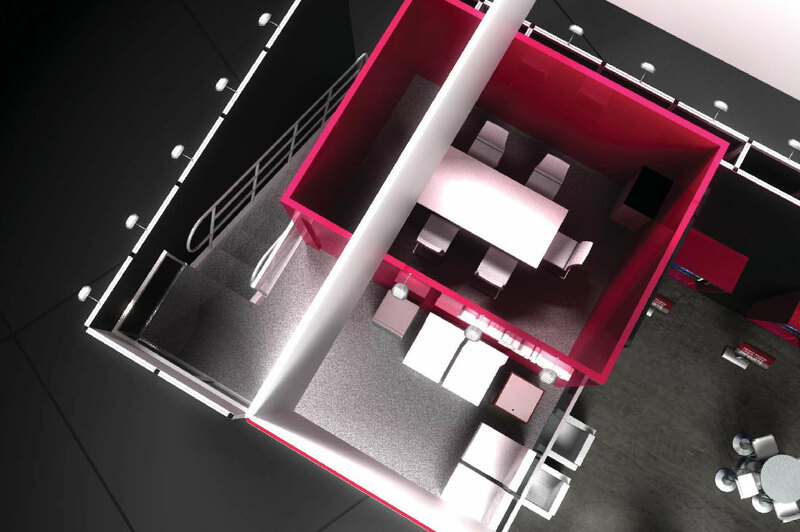 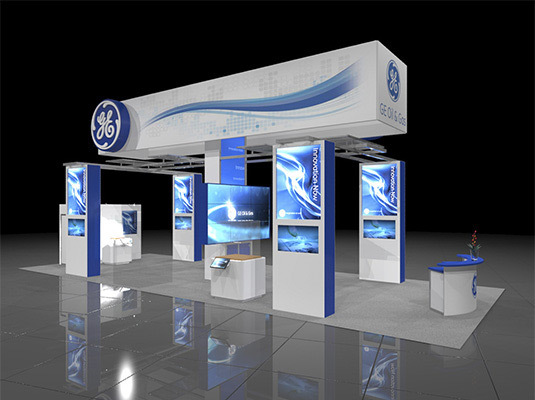 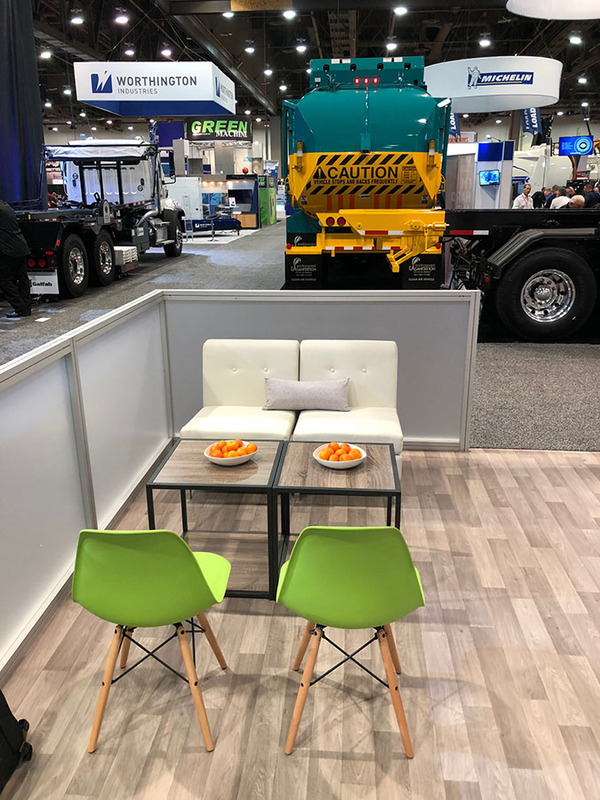 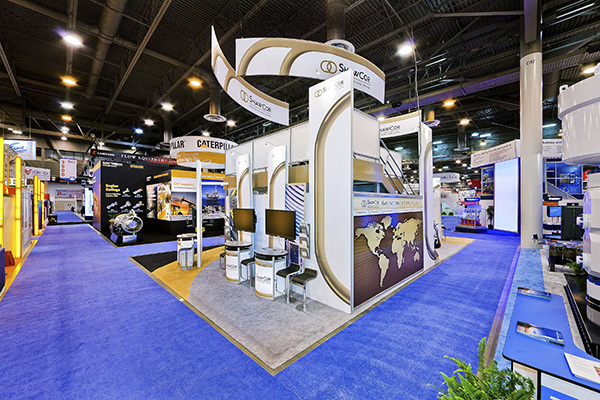 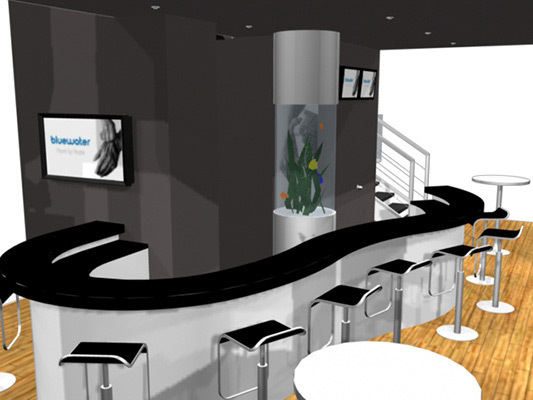 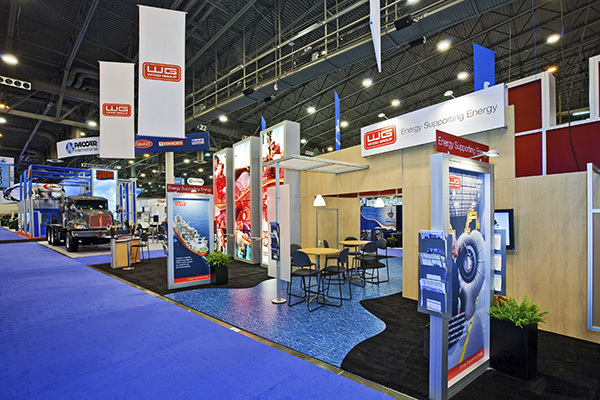 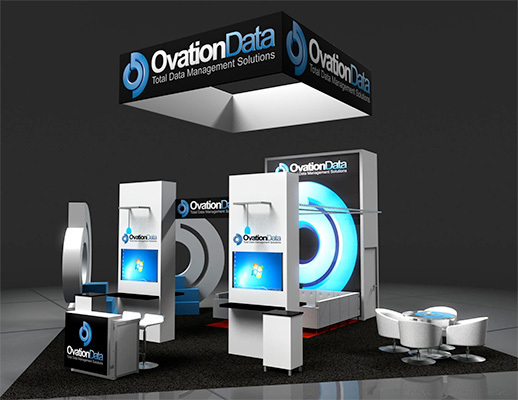 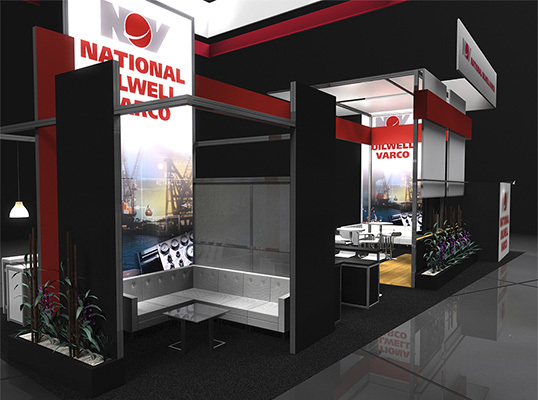 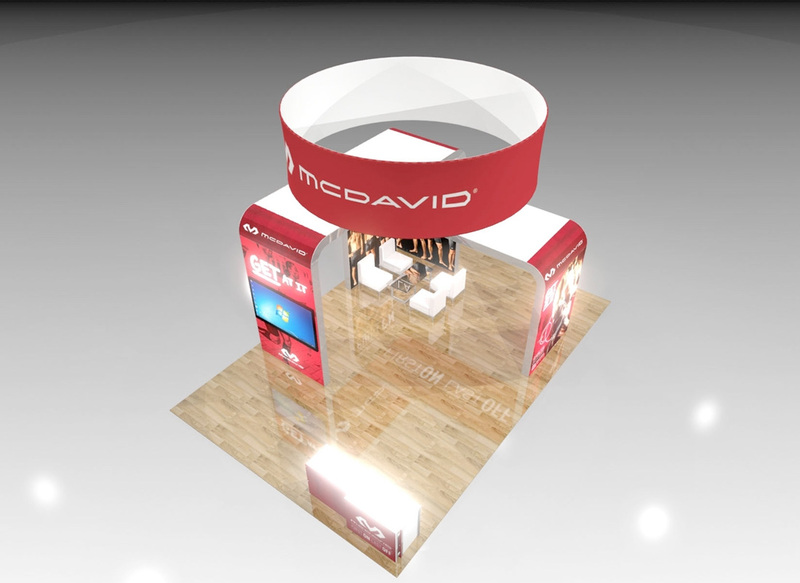 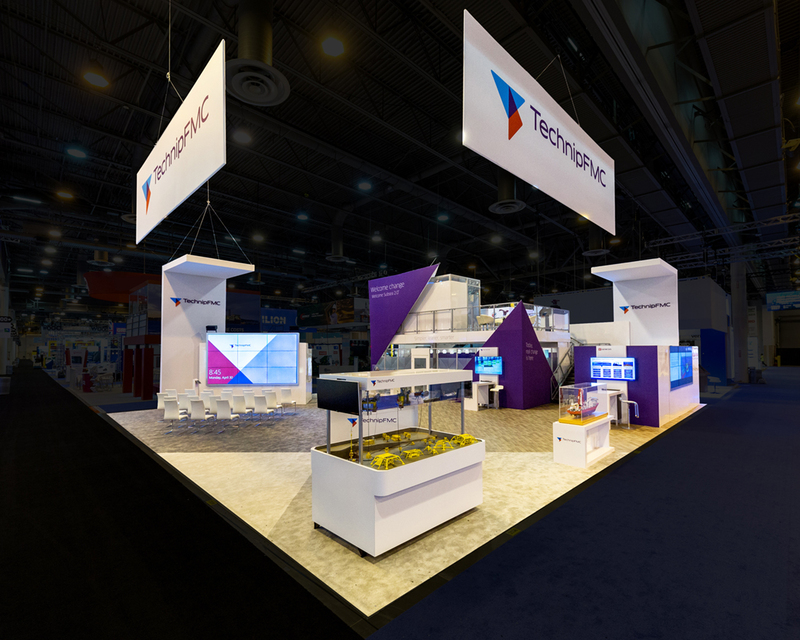 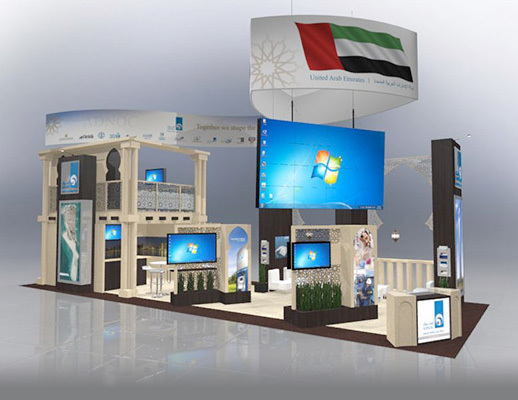 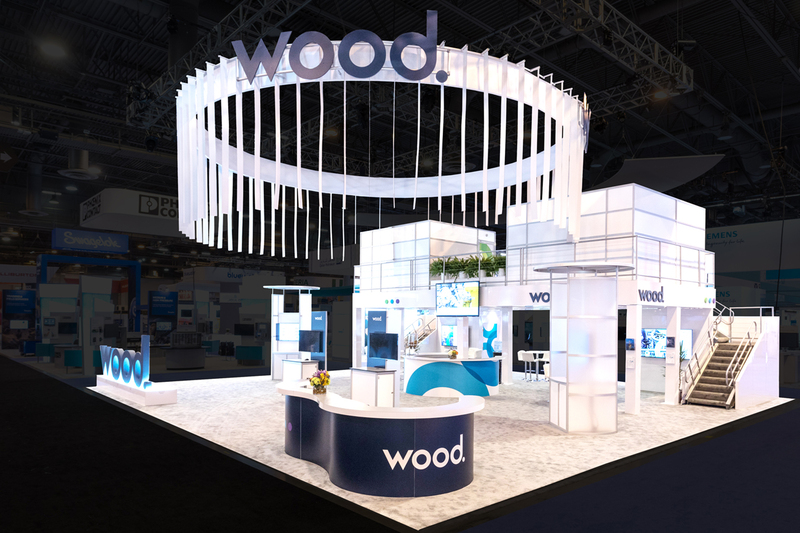 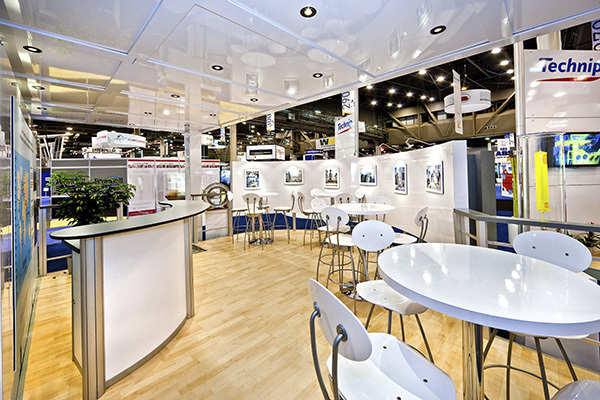 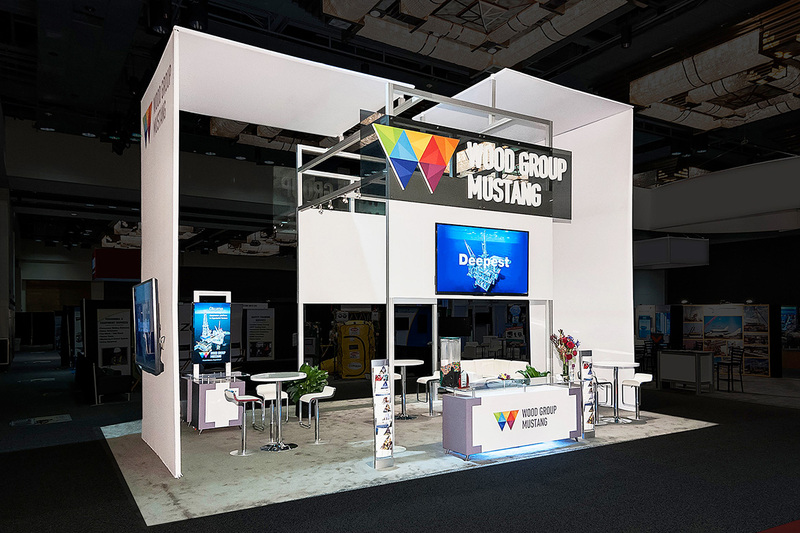 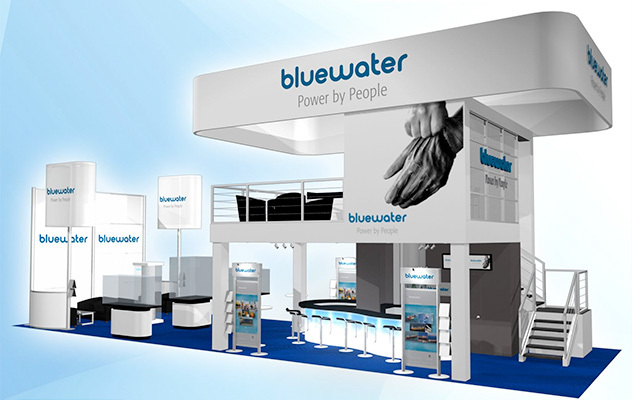 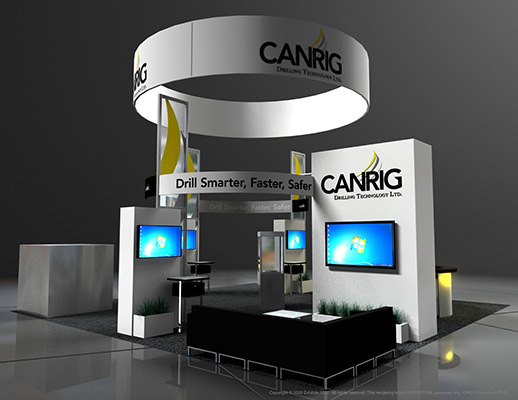 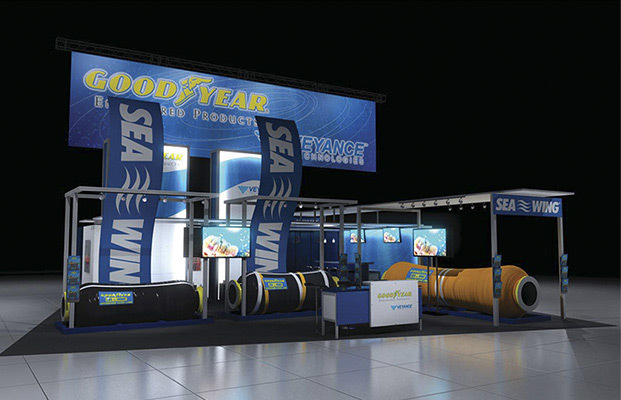 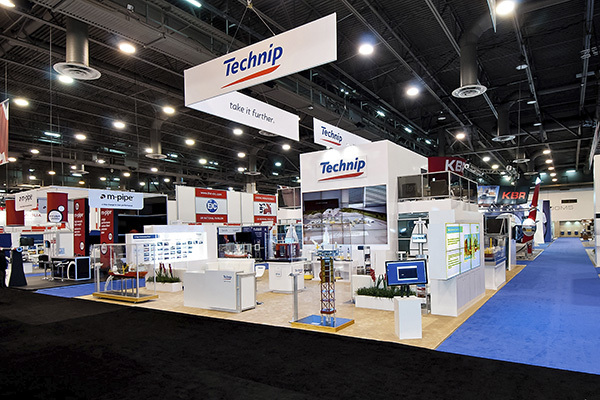 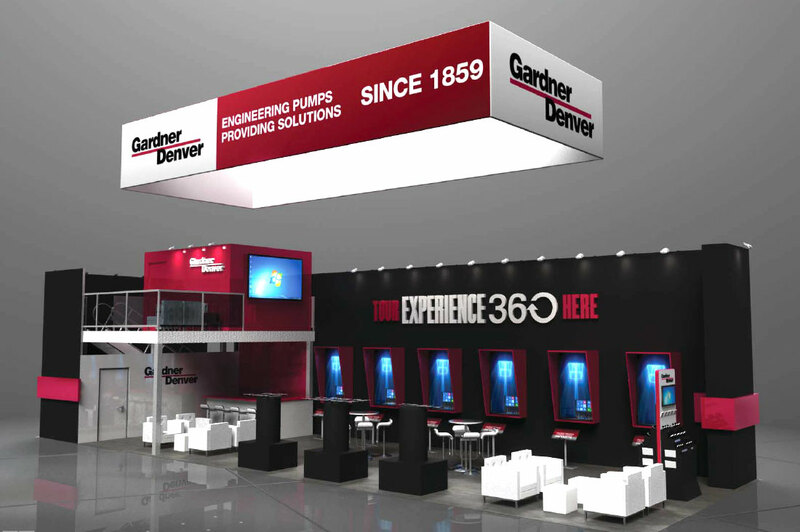 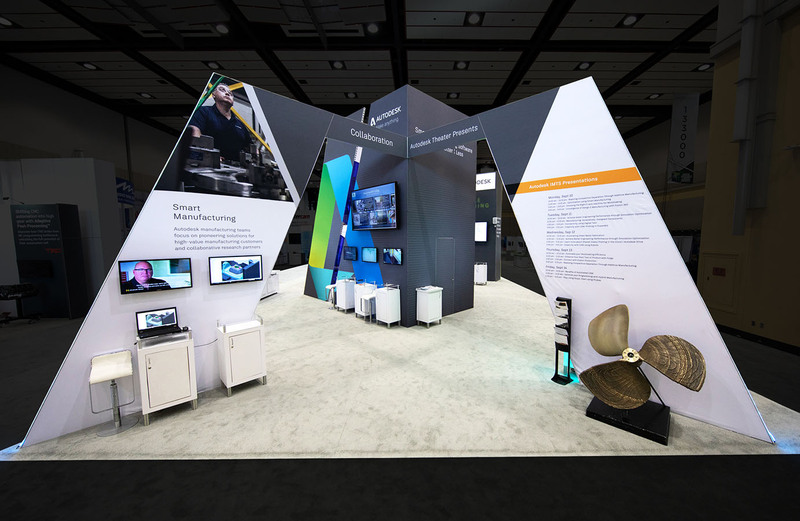 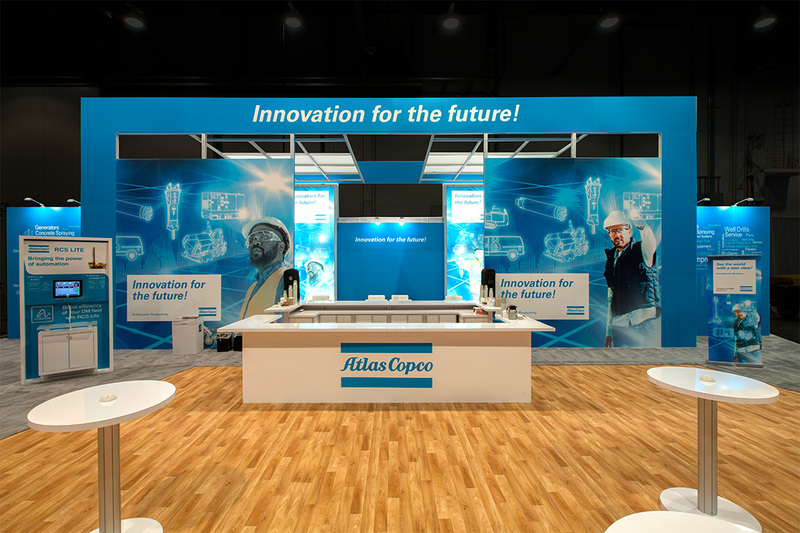 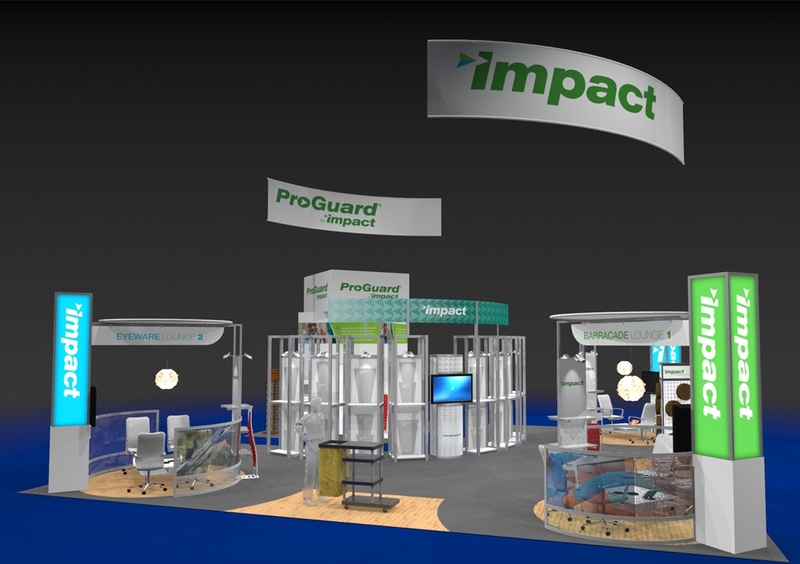 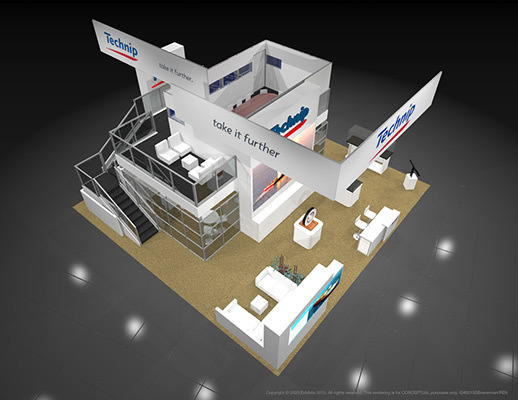 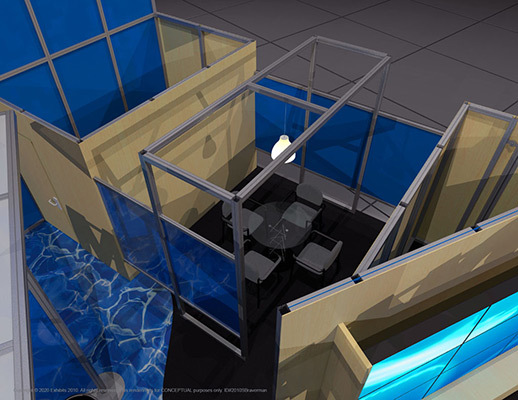 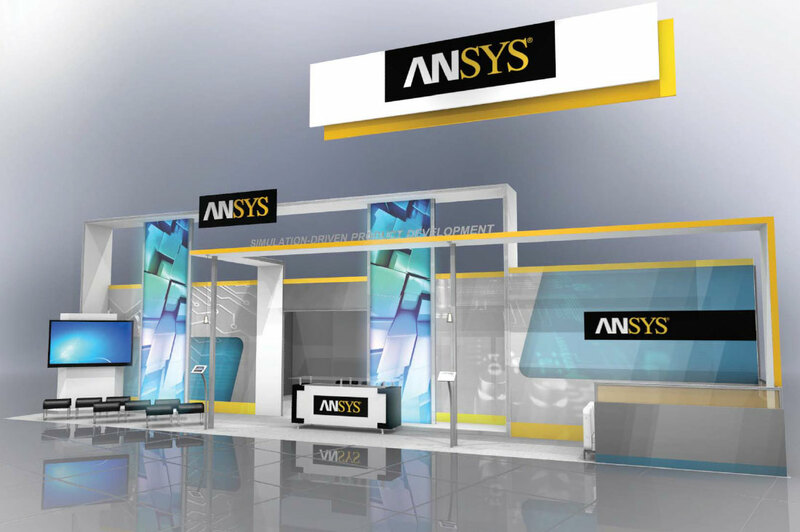 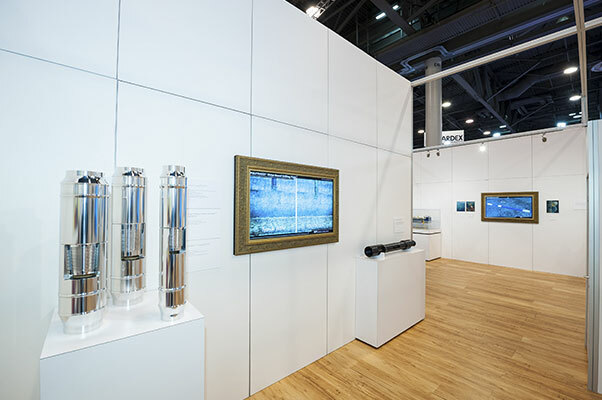 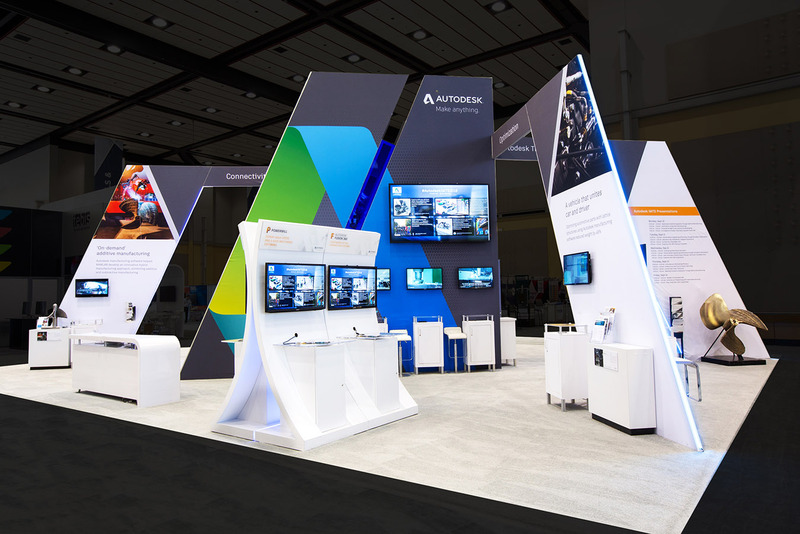 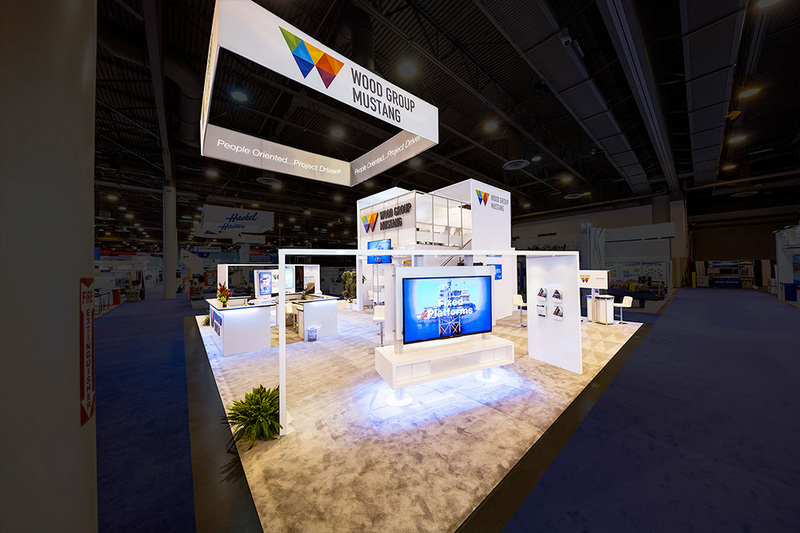 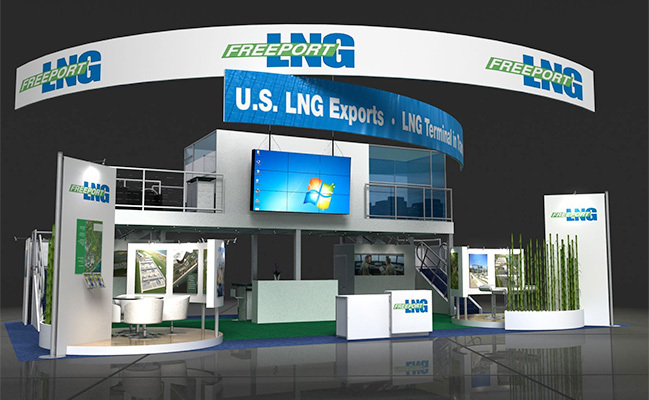 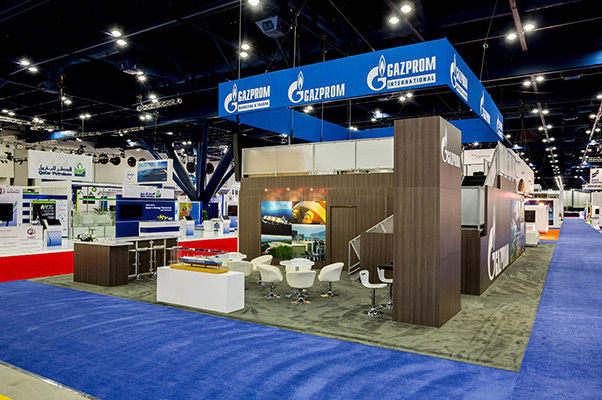 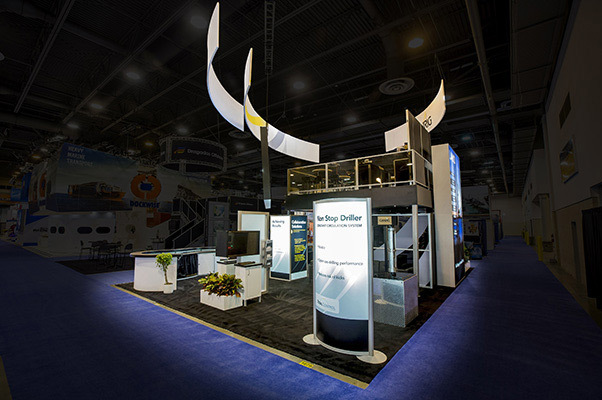 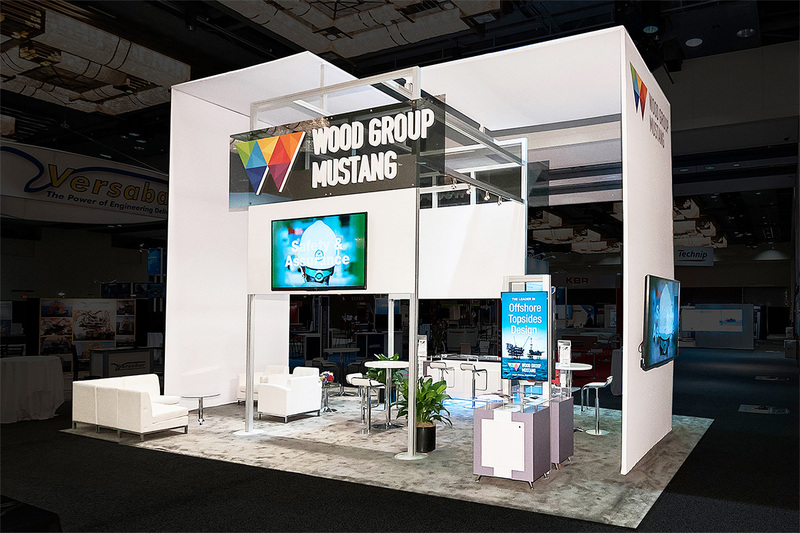 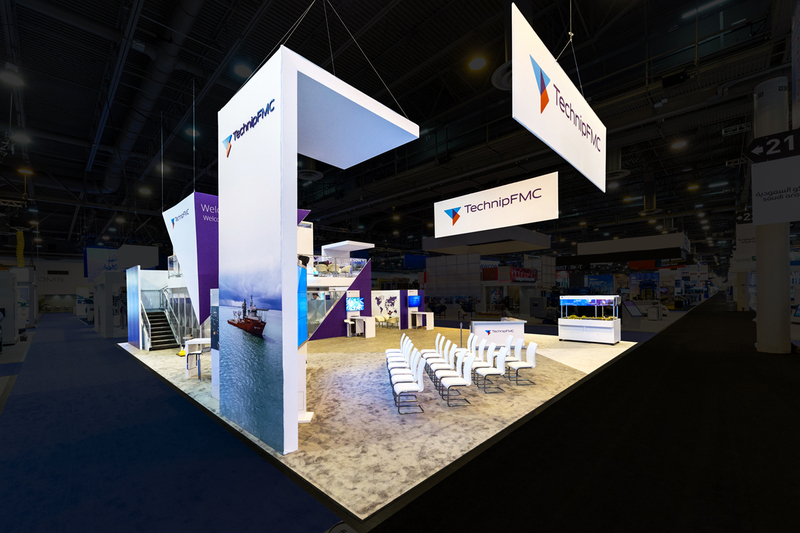 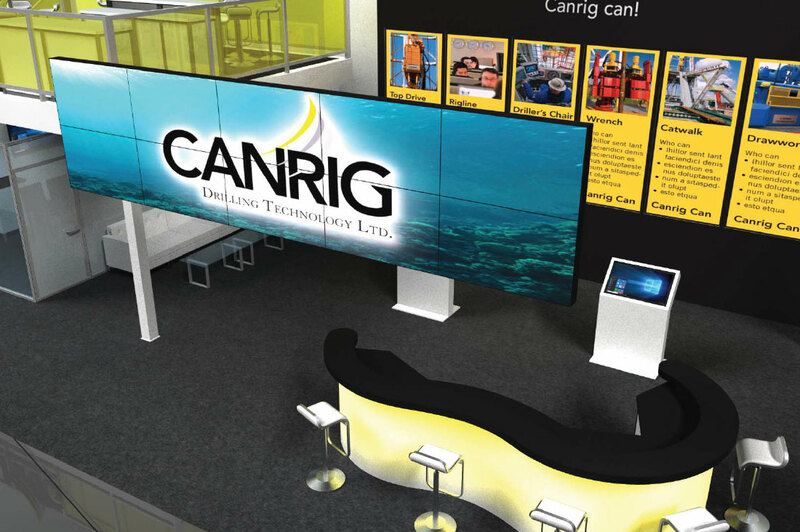 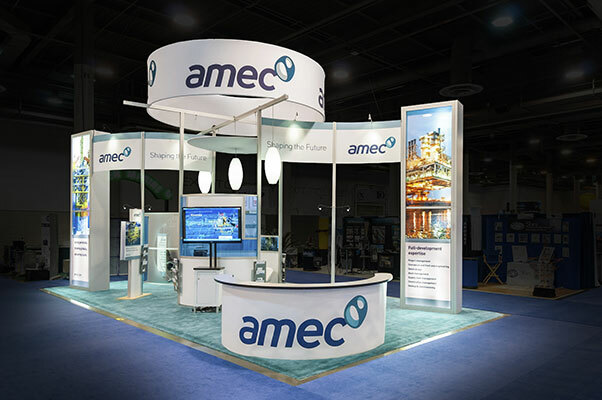 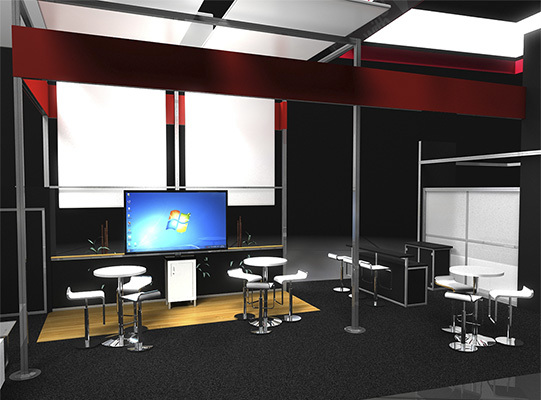 Information stations, video stations, meeting areas, product displays and much more are all on showcase for a vast array of products and services to present to guests of the booth. 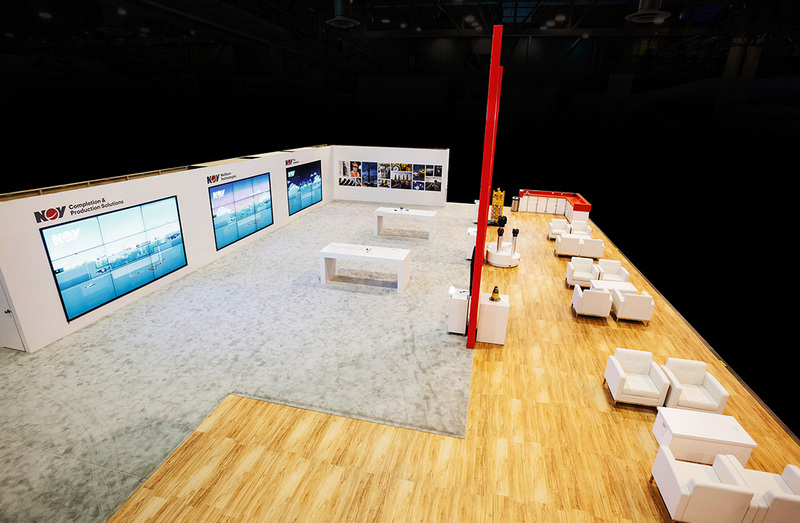 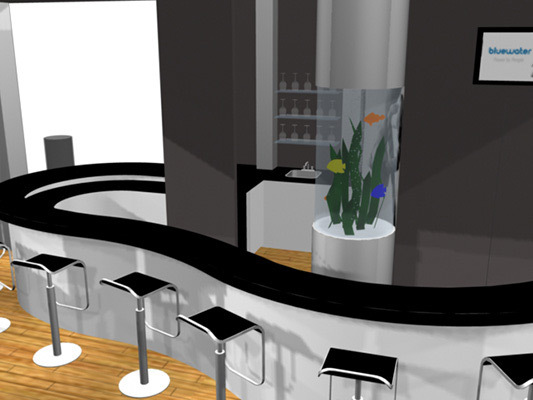 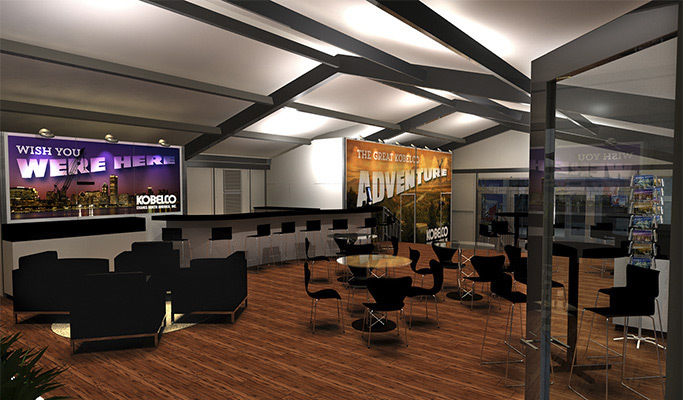 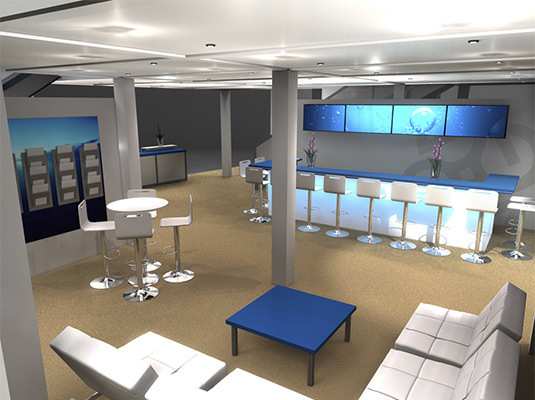 Theatre seating available in front of a large video wall for video presentations. 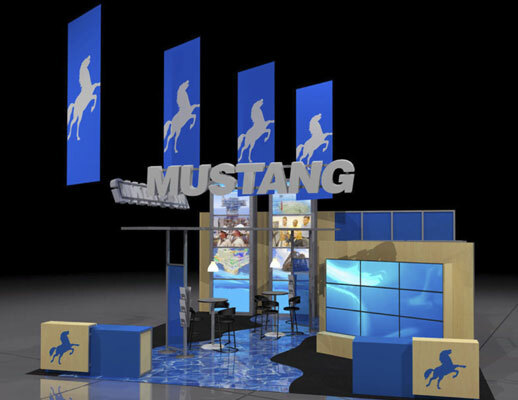 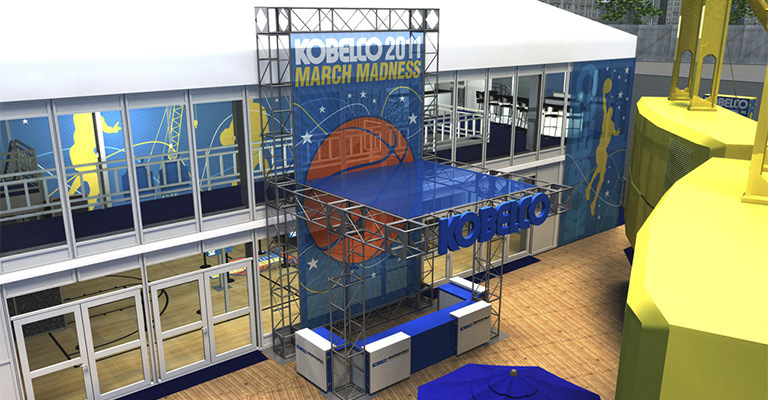 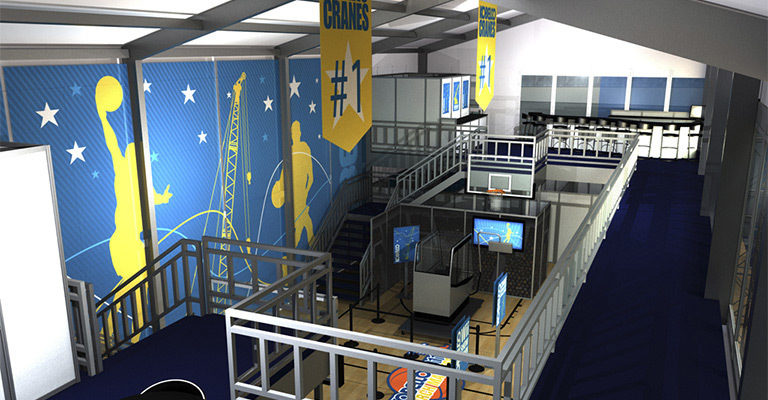 Features include: large circular overhead hanging logo graphic signage, circular video monitor station, video wall, theatre seating, storage space, open environment, many video kiosks, information kiosks, product displays, curved logo signage, lounge area, re-configurable, bar, lounge areas, storage closets, neon lighting, touch screens, open conference seating, interactive, double deck, private meeting areas, reception area and literature displays.